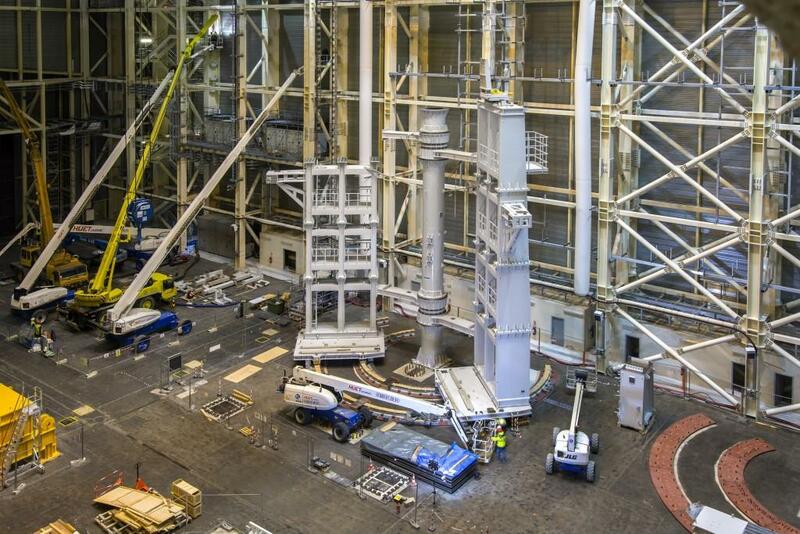 At the top of the second SSAT tool, contractors are assembling the final elements. 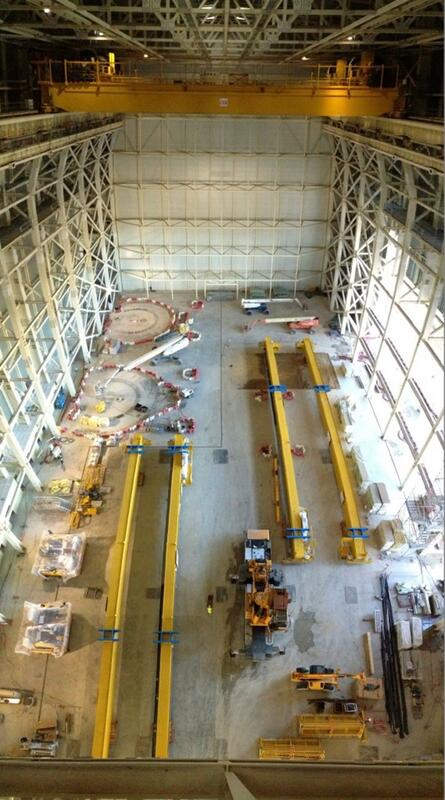 The second SSAT tool is rising quickly in the Assembly Hall. 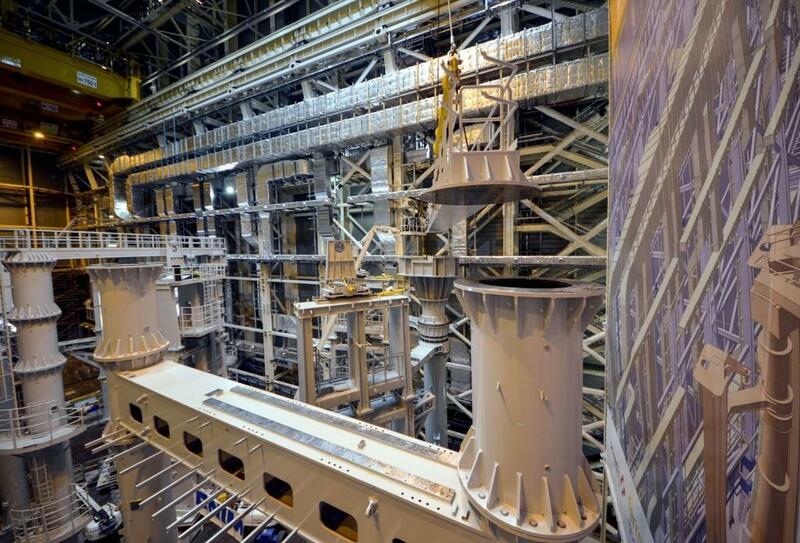 Each of these 800-tonne behemoths can carry component assemblies of 1,200 tonnes. 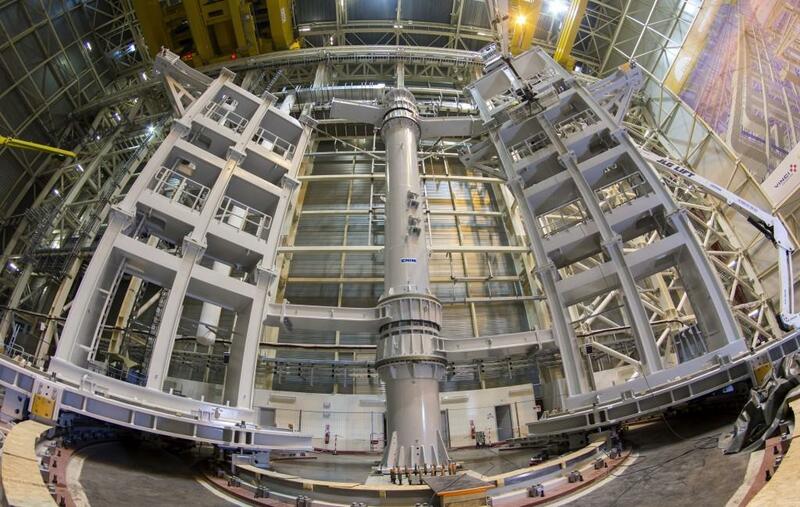 Precision hydraulics will drive the lateral wings of the SSAT tools, which rotate to deliver the toroidal field coils to their installation fixtures on the vacuum vessel sector. 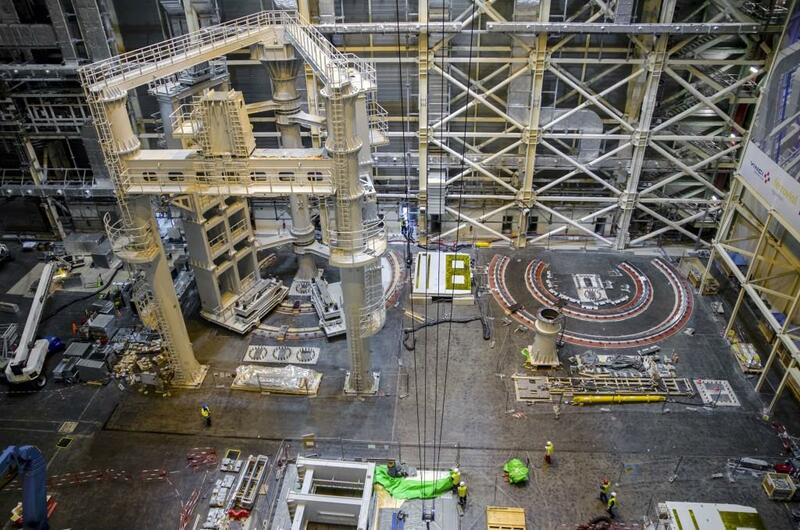 The tools are solidly anchored in the concrete floor of the Assembly Hall. 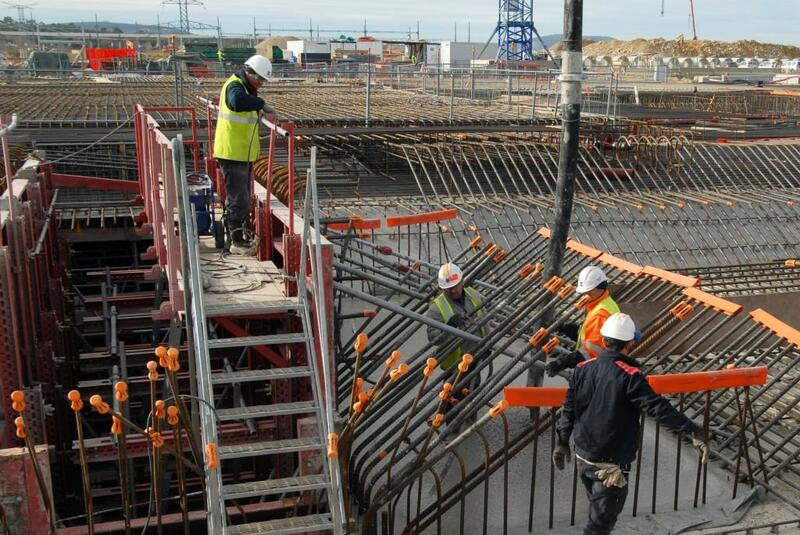 In the foreground is the footing arrangement for the inboard column. 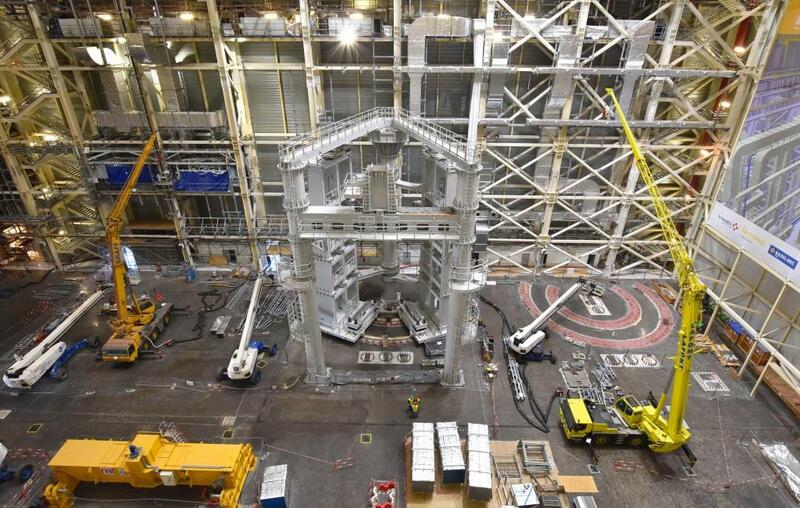 Both tools will be tested with a full-weight dummy load, expected on site in March 2019. 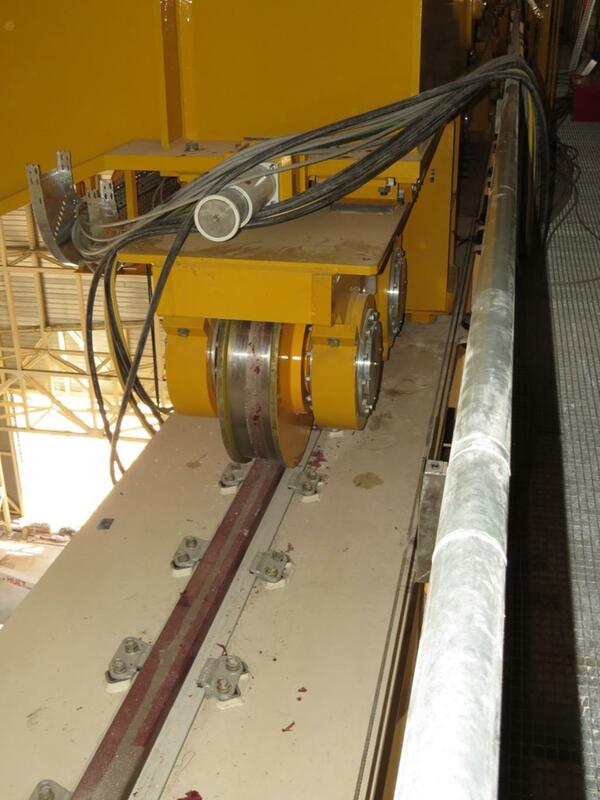 Load testing is the final tool qualification activity, allowing operators to verify the tools' ability to accurately adjust the dummy load toroidally and to six degrees of freedom within tolerances of +/- 1 millimetre. 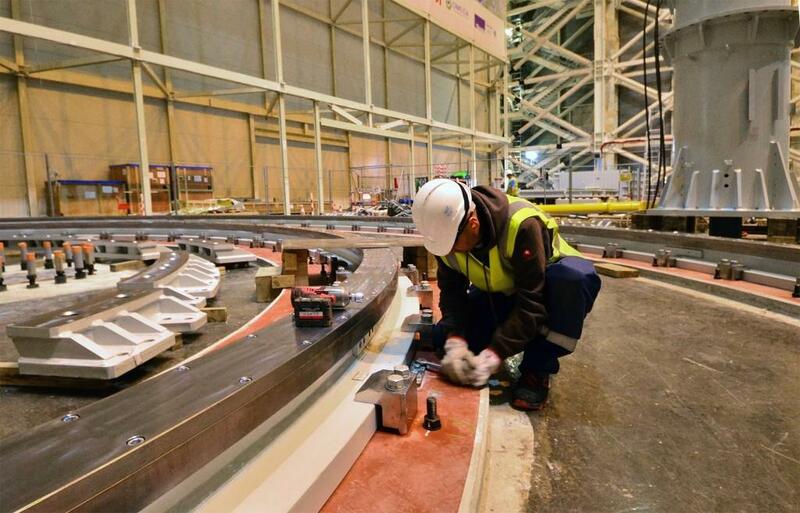 The technician walking along the curved rails gives us a sense of the tool's scale. 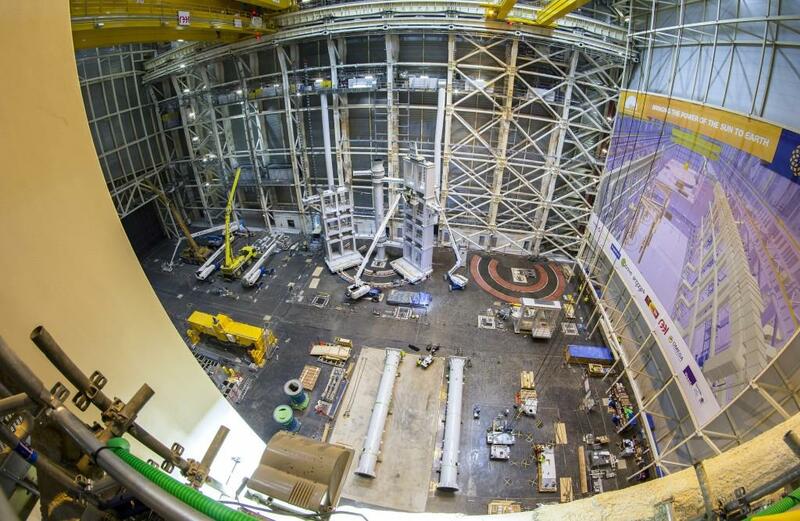 The first segment of tool #2 has been positioned for installation. 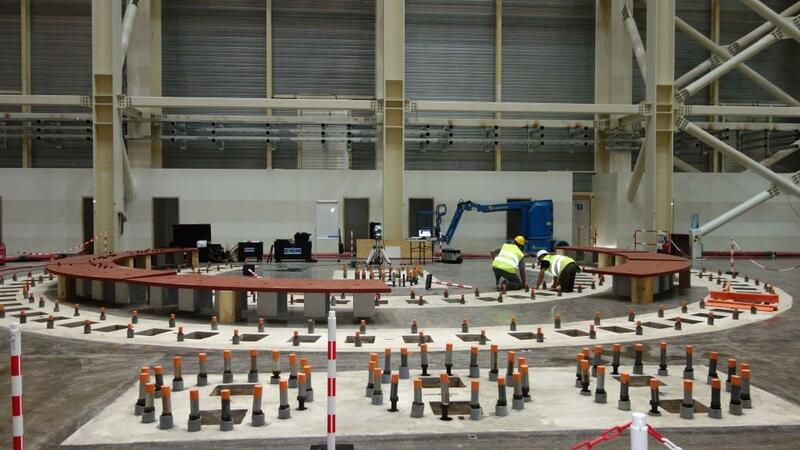 On the floor of the Assembly Hall, across from the SSAT tools, other bespoke handling stations will be installed—for example, for the assembly of the central solenoid. 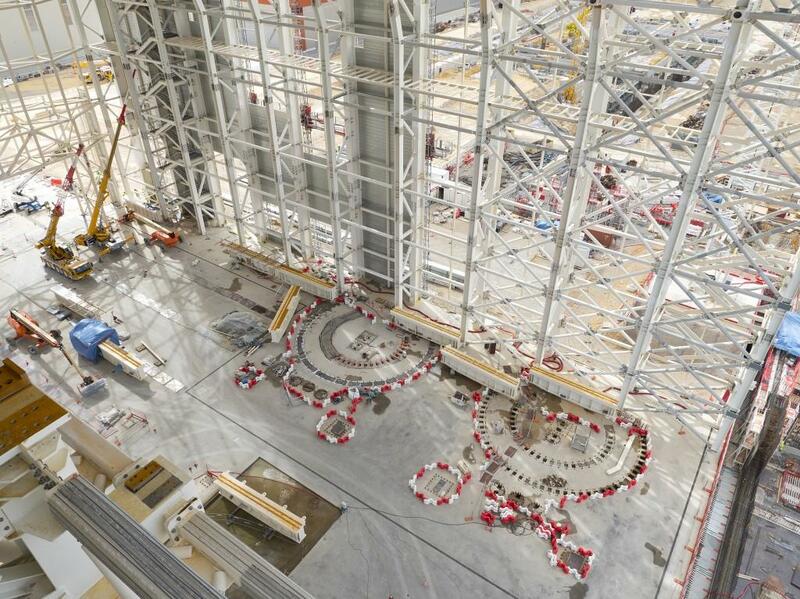 Specialists are busy installing and precisely aligning the toroidal rail tracks upon which the wings of the giant tool will travel. 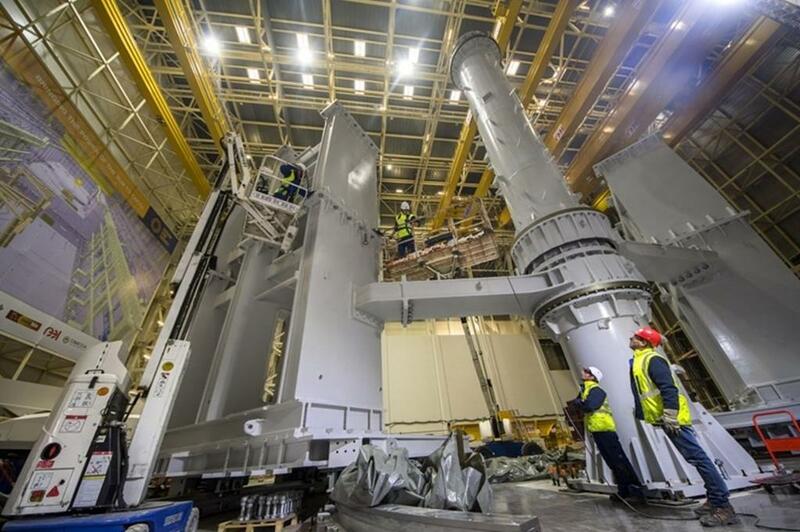 All the pieces of the first tool are in place; only hydraulic and electrical connections must be installed. 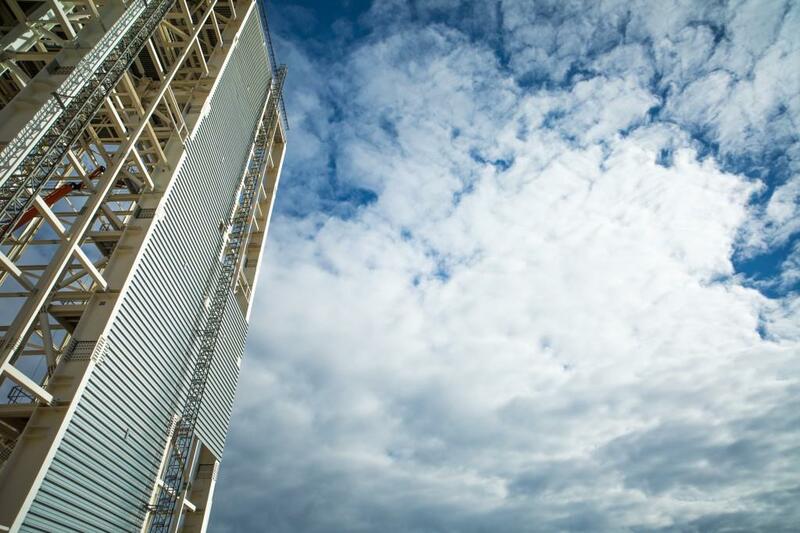 Ahead are functional tests (integrated system tests without the test load), followed by full-load tests. 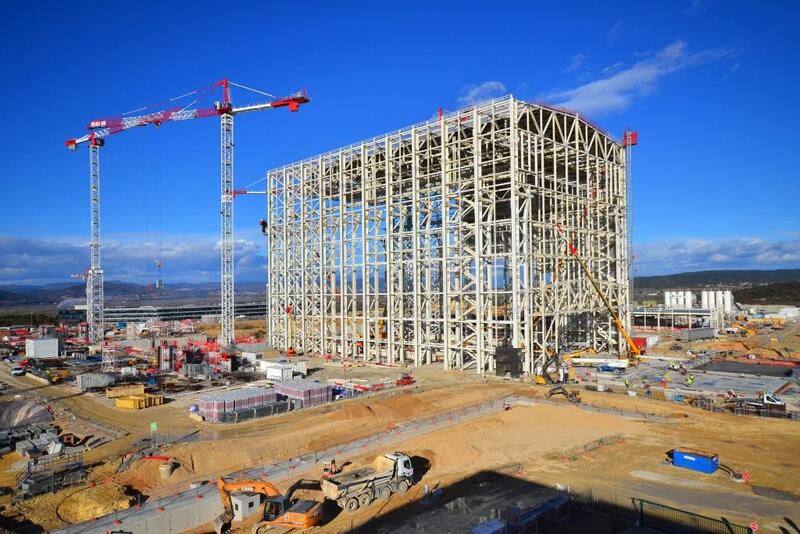 Media crews were invited to tour the ITER site in early October, including the Assembly Hall where one giant tool stands and another is going up. 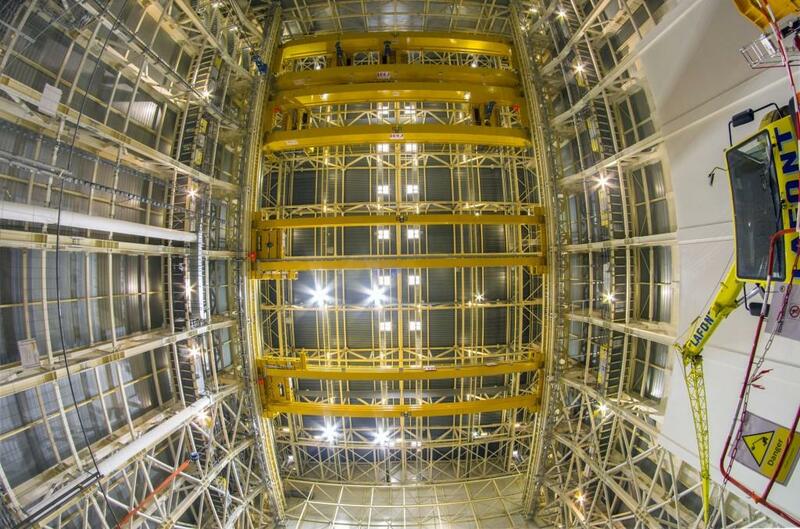 A worksite crane is reflected from the mirror surface of the Assembly Hall in August. 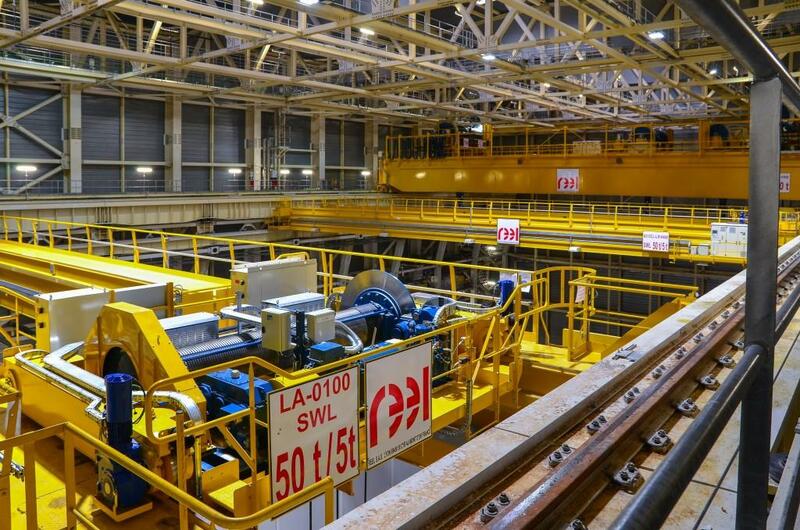 The 800-tonne tools are designed to support charges of up to 1,200 tonnes. 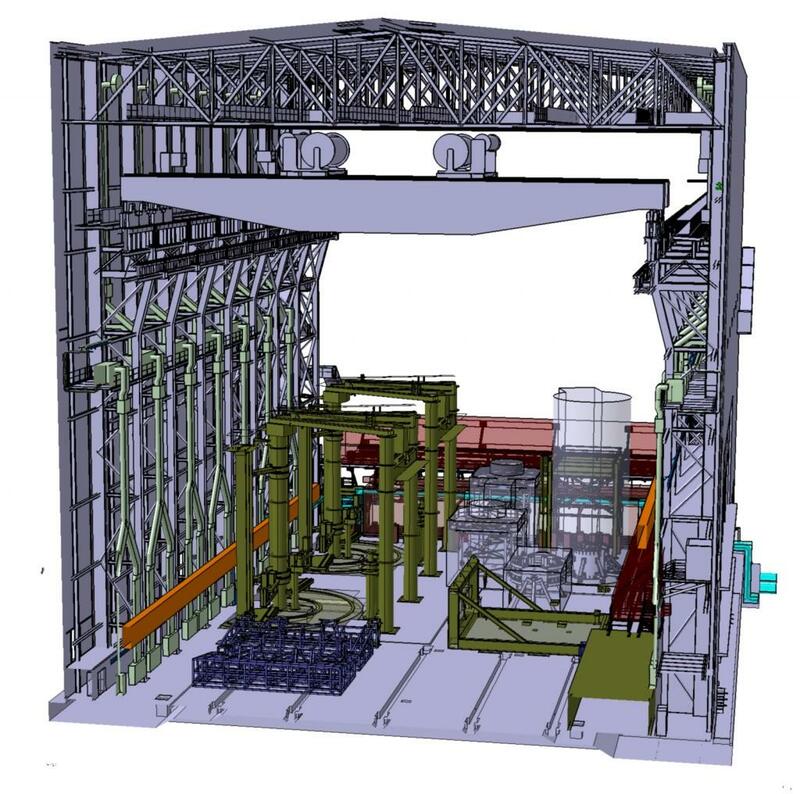 The sector sub-assembly tools (SSAT) will support a vacuum vessel sector vertically while operations that can only take place in a spacious area—the addition of large thermal shielding sections and the attachment of a pair of D-shaped toroidal field magnets—are carried out. 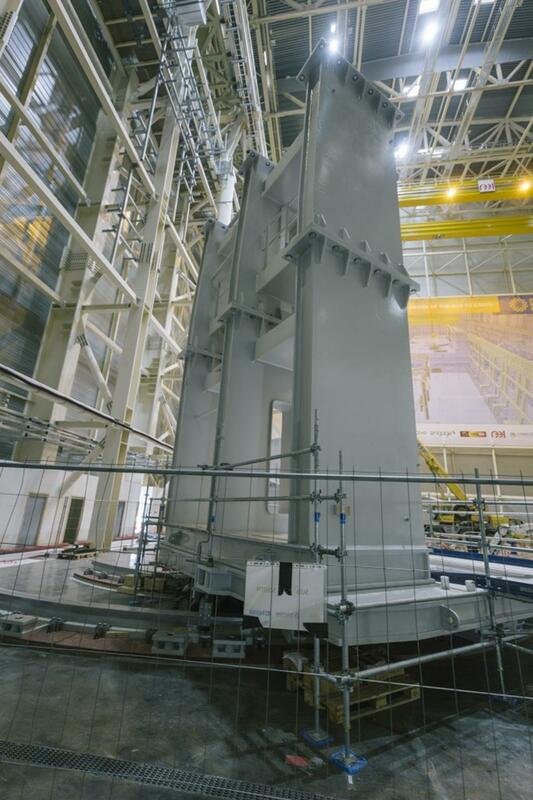 A second sector sub-assembly tool has been manufactured and tested in Korea, and then shipped to ITER for assembly. 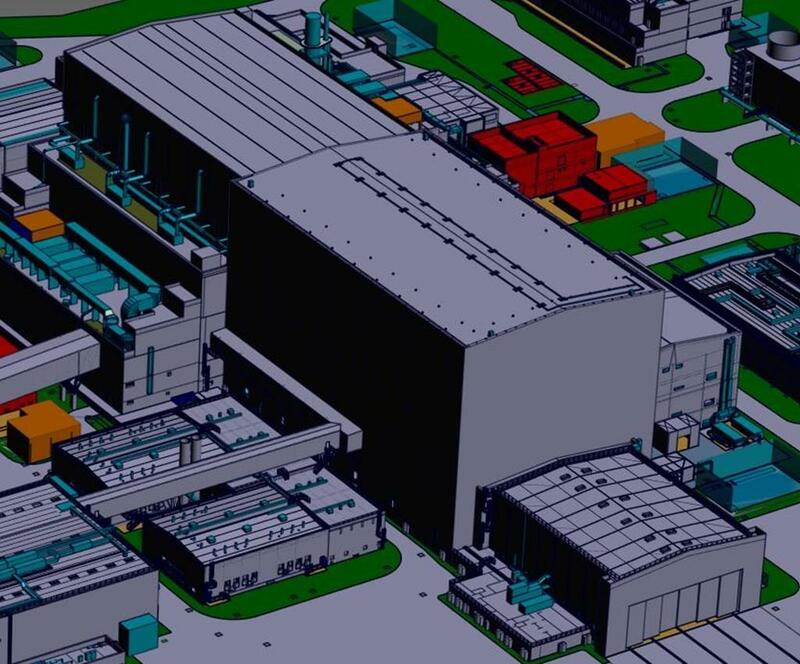 After commissioning, the first tool will enter operations with the arrival of vacuum vessel sector #6 in Q2 2019. 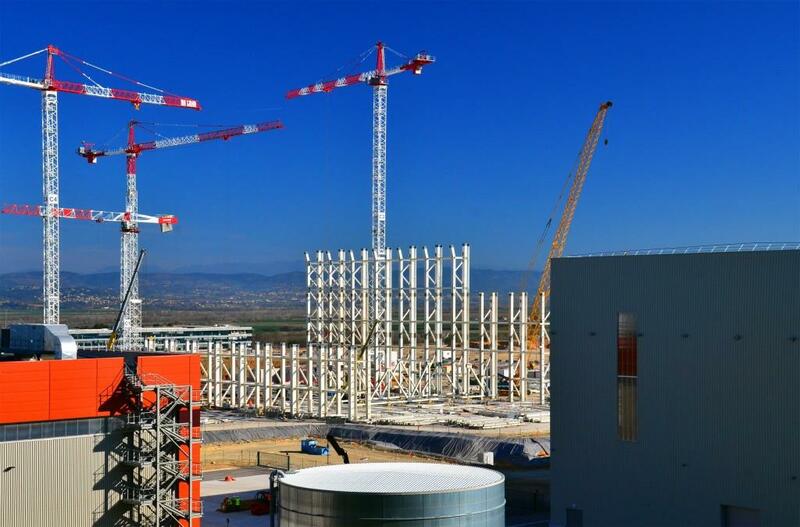 13,000 visitors passed through ITER in 2017 and a similar number is expected this year. 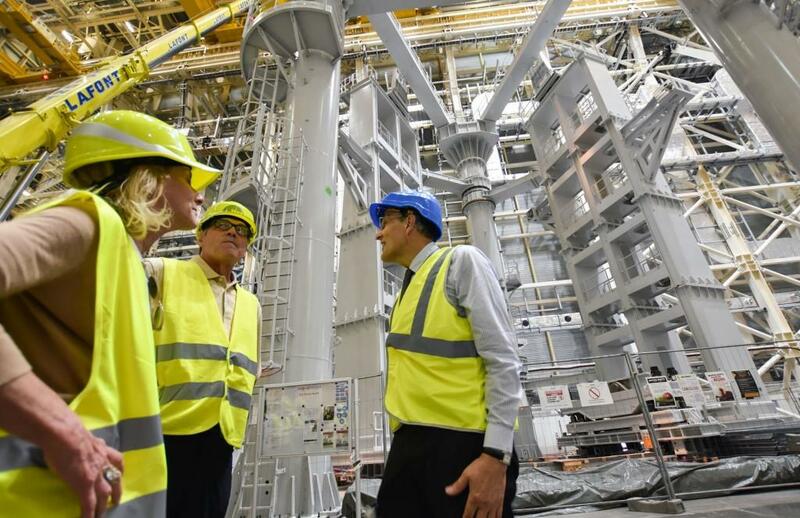 Pictured: the ITER Director-General leads a tour for US Secretary of Energy Rick Perry and US Ambassador to France Jamie McCourt. 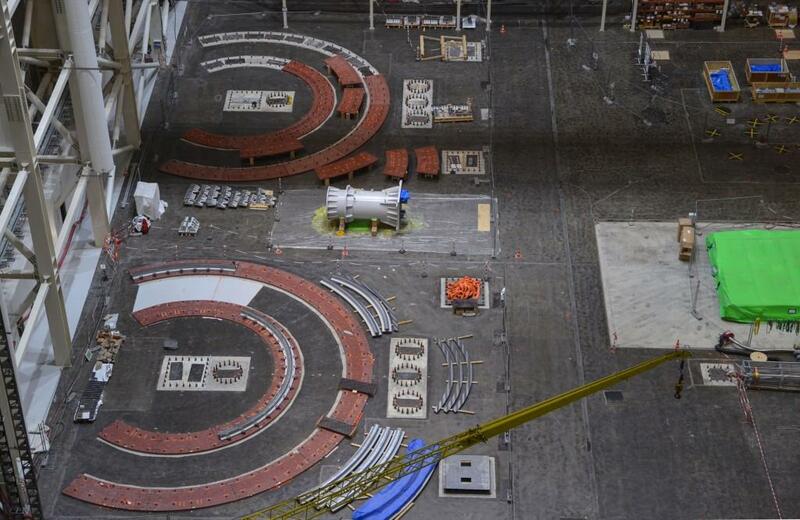 Imagine: two of these giant tools will be working side-by-side during the pre-assembly phase of the ITER vacuum vessel. 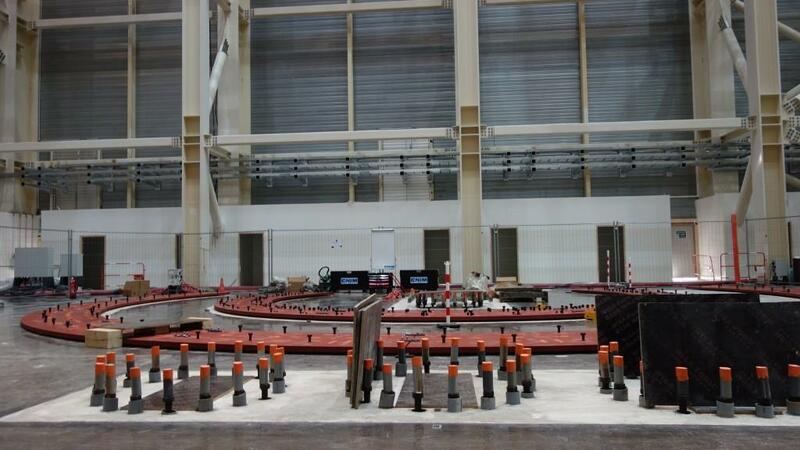 The rails are already in place for tool #2. 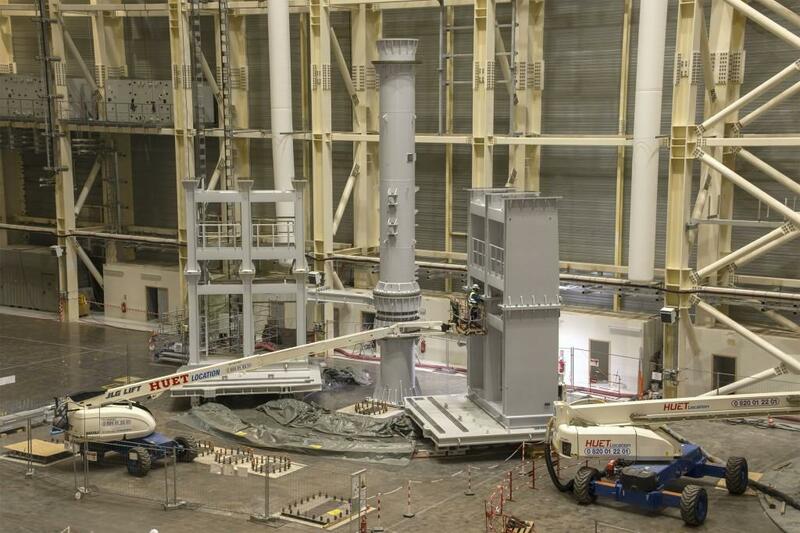 The two outboard columns, which have been assembled horizontally, will be standing by end-April. 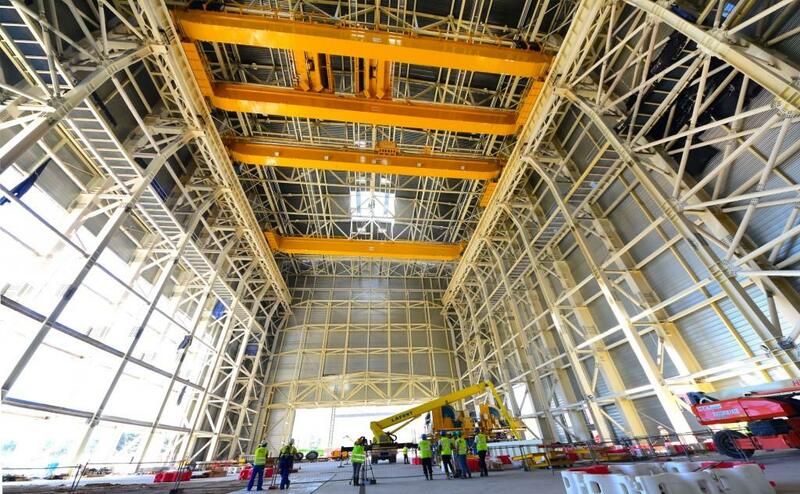 With its wings open, the tool is impressive indeed. 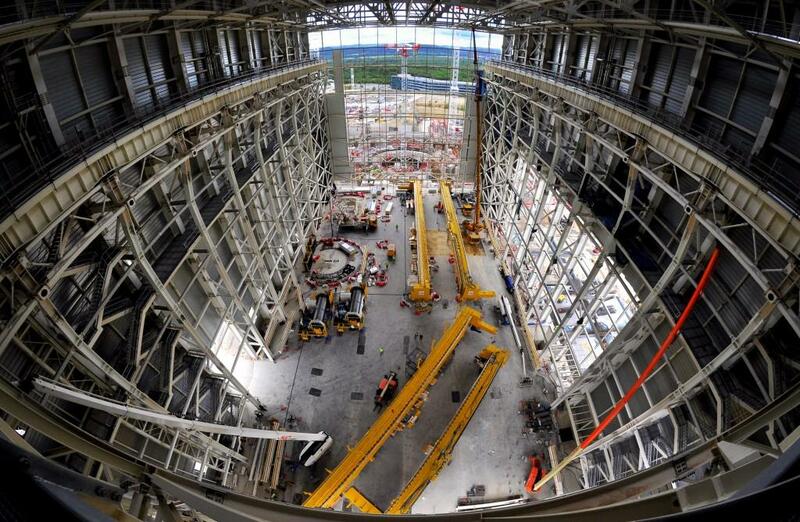 Each wing will slowly rotate in to align 310-tonne toroidal field coils to each side of a vacuum vessel sector. 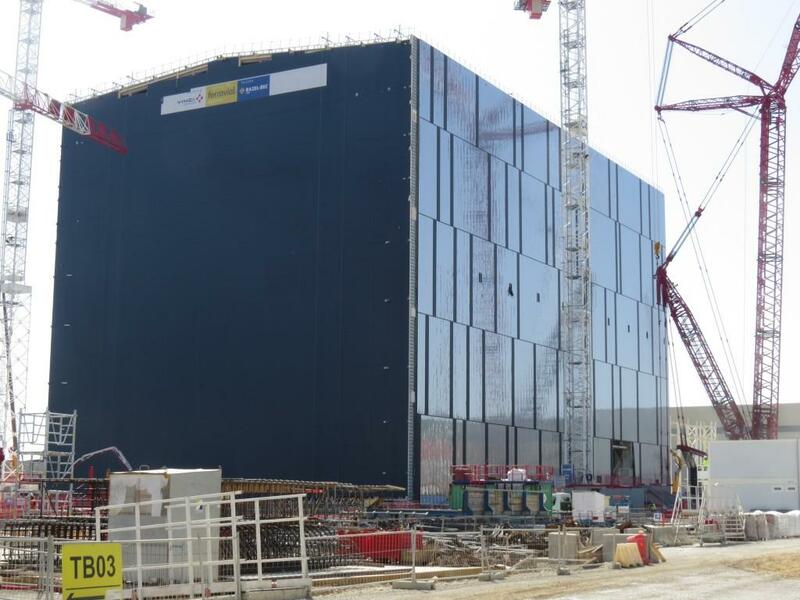 When the Tokamak Building is completed, the temporary wall to the right will come down. 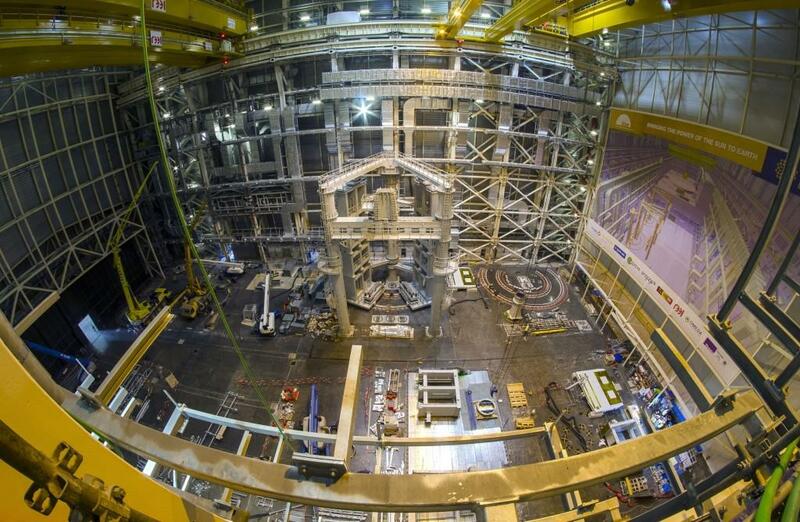 The vacuum vessel sector sub-assemblies won't have far to travel to the Tokamak Pit. 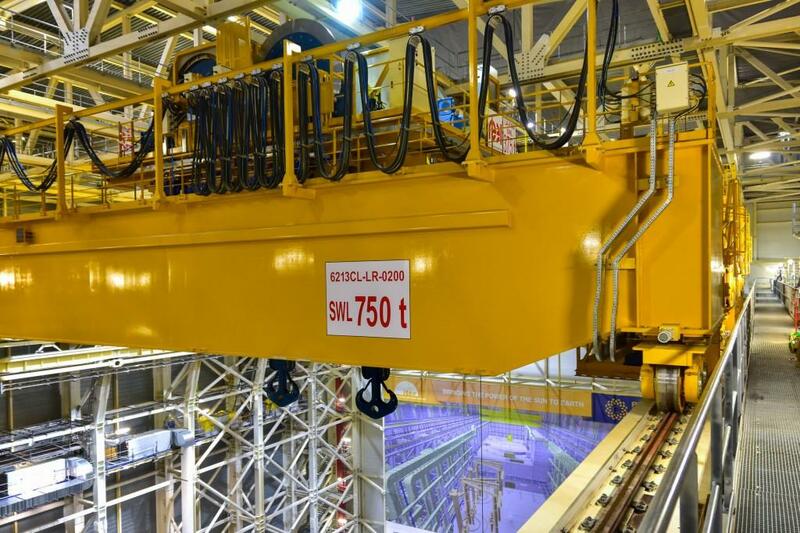 This tool has been designed for 1,200-tonne loads. Structural elements on the inside of the tool's three pillars contribute to stability. 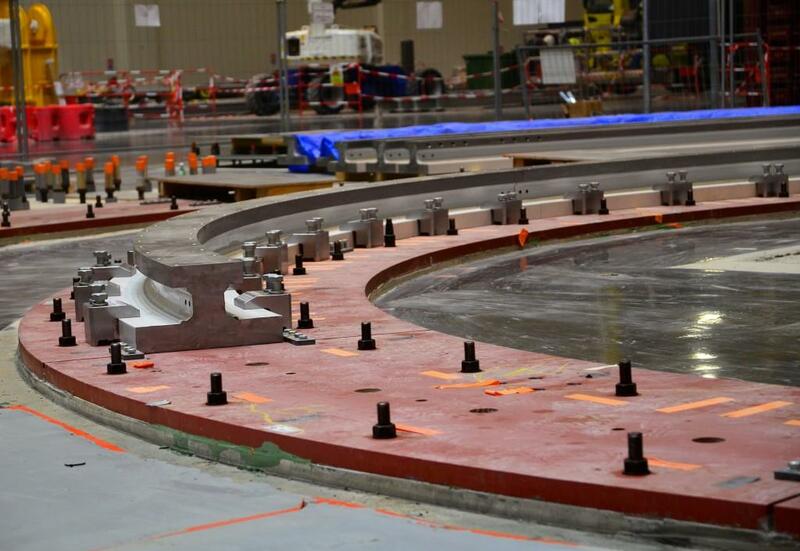 Next to the first tool, base rail plates have been installed for the twin tool that is undergoing factory acceptance tests now in Korea. 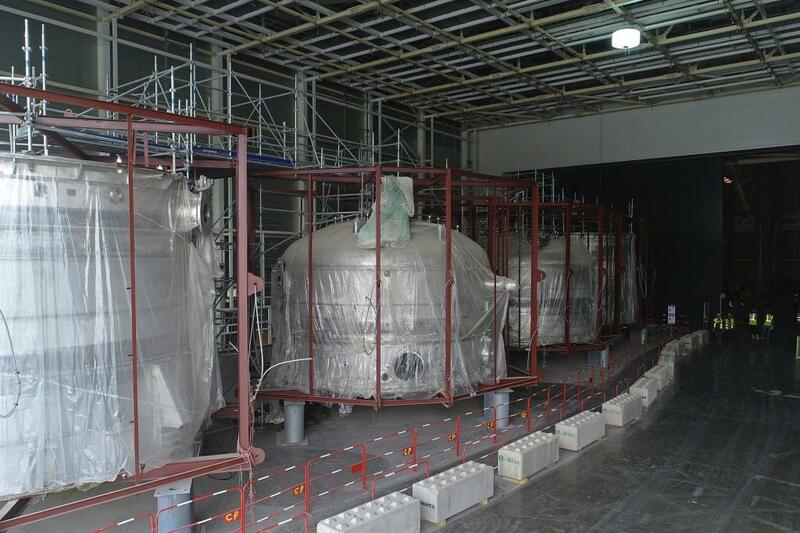 Two tools will allow the vacuum vessel sector pre-assembly period to be divided by ... half. 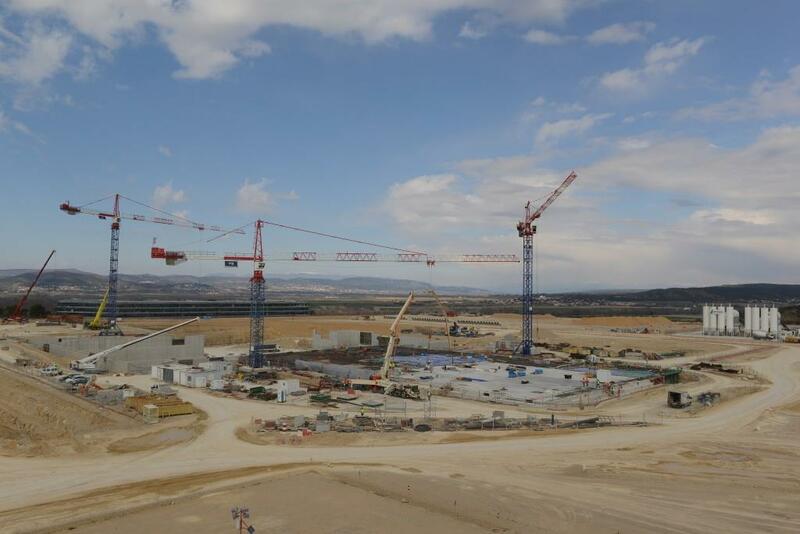 After a long period during which the anchoring elements—including base plates and rails—were set into place and precise measurements taken, the installation of ITER's first giant assembly tool is underway. 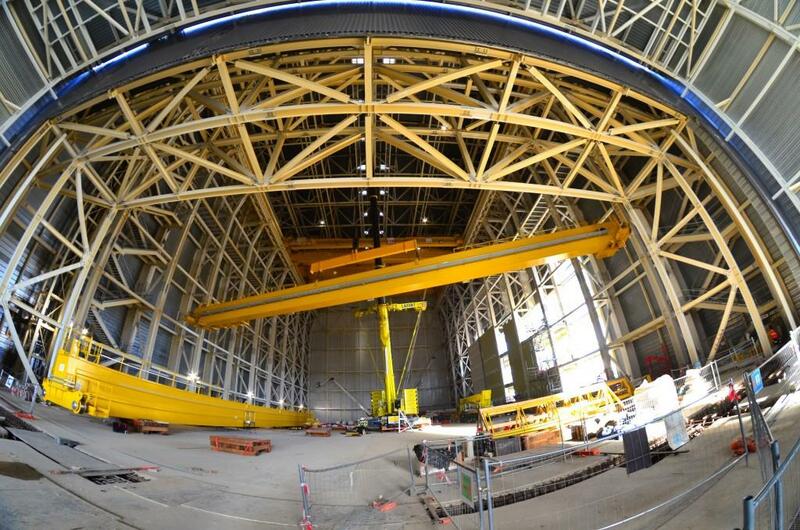 The 800-tonne tool, once fully erected, will be capable of supporting loads of 1,200 tonnes. 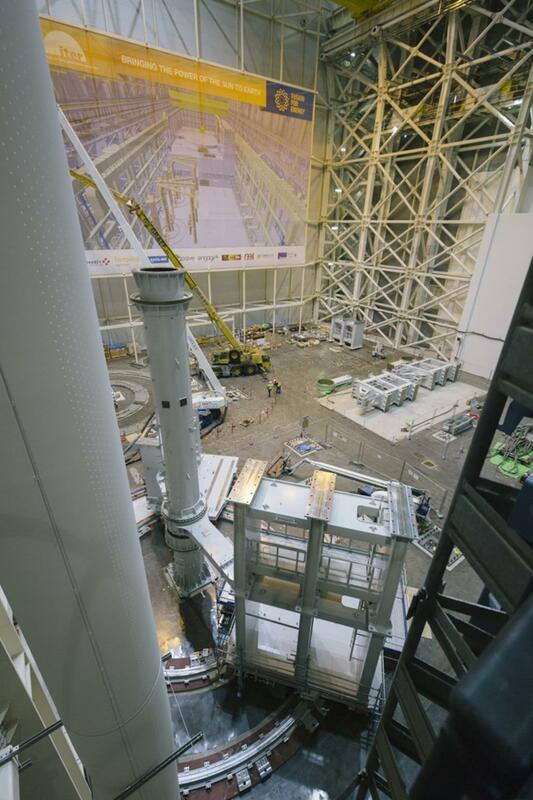 About half of the major components for the first tool have been installed. 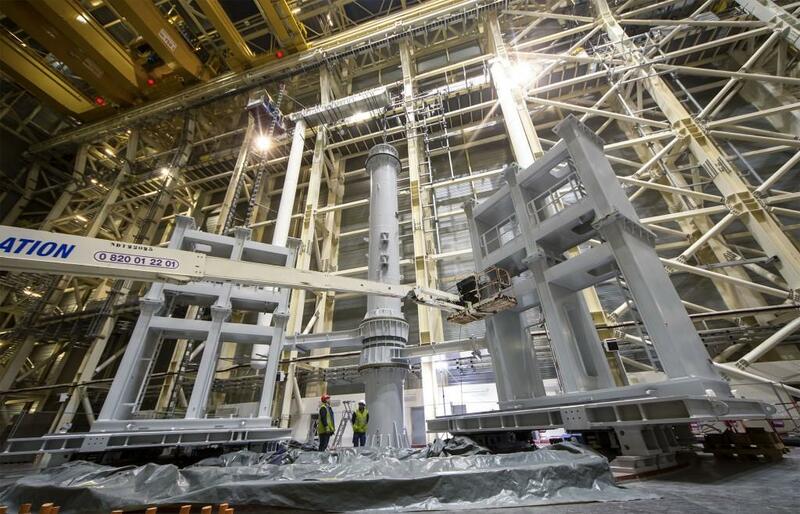 In parallel, the second tool of the pair has been manufactured and assembled at Taekyung Heavy Industries (THI) in Korea, where testing is underway. 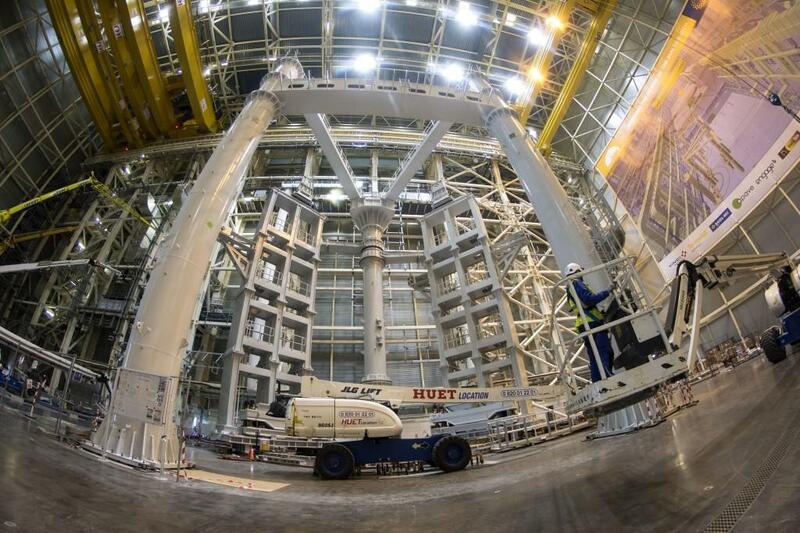 Metrology teams are at work in the Assembly Hall to characterize segments of the SSAT tool before they are lifted into place. 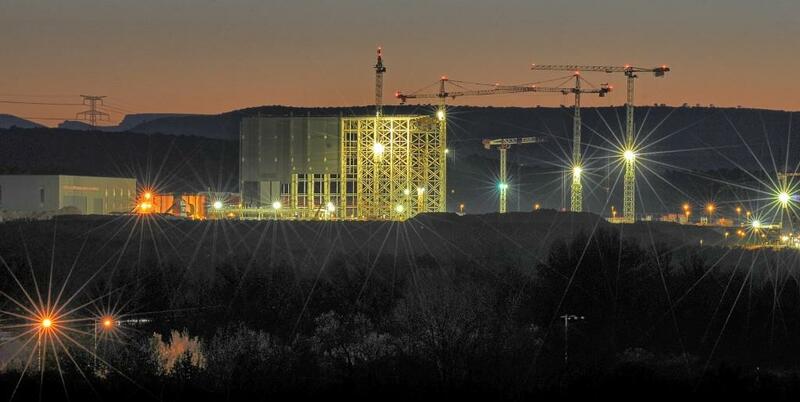 Late at night in December the principal crane of the Assembly Building was subjected to loads that were +10%/+25% of nominal—all part of commissioning tests for the important equipment. 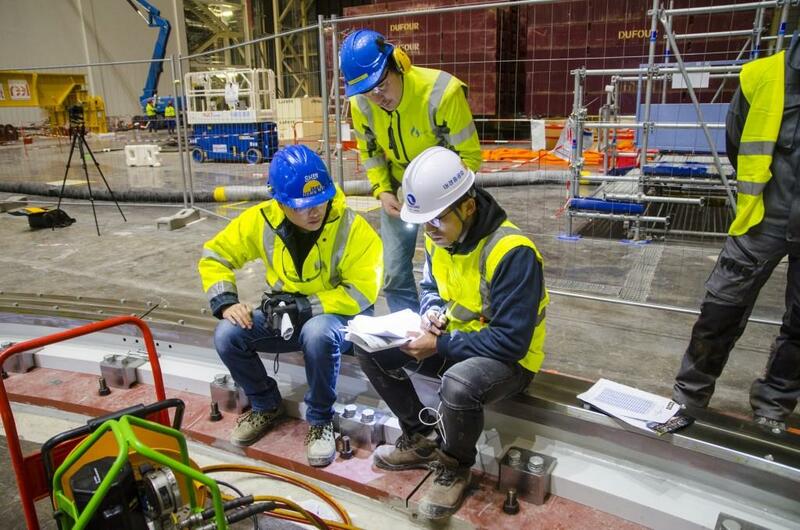 Observers during the load tests include representatives of the crane manufacturer Reel, the ITER Organization, the architect-engineer Engage, and the safety controller Bureau Veritas. 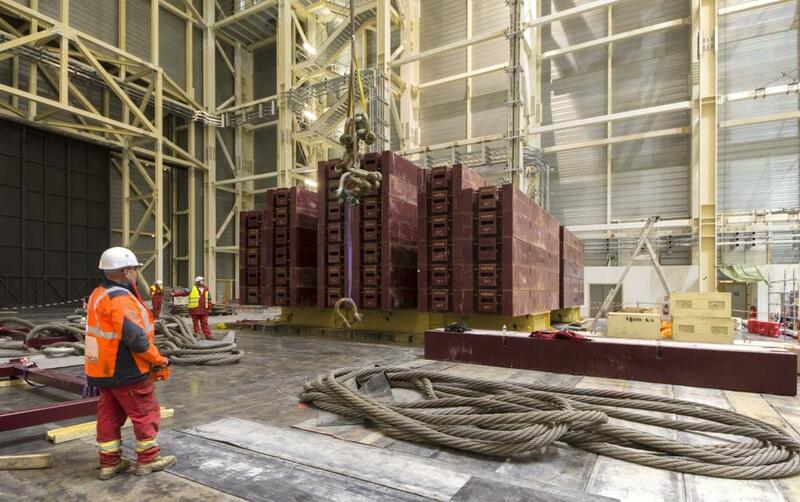 These heavy metal blocks—stacked seven tall—will be lifted some 50 metres overhead during testing. 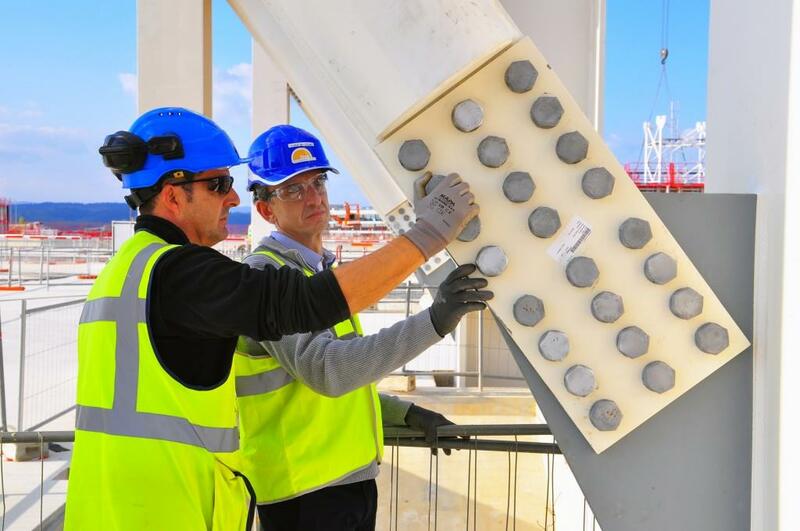 Questions about grouting raised during the installation of the rails have been resolved, and the first tool segment can be moved into place. 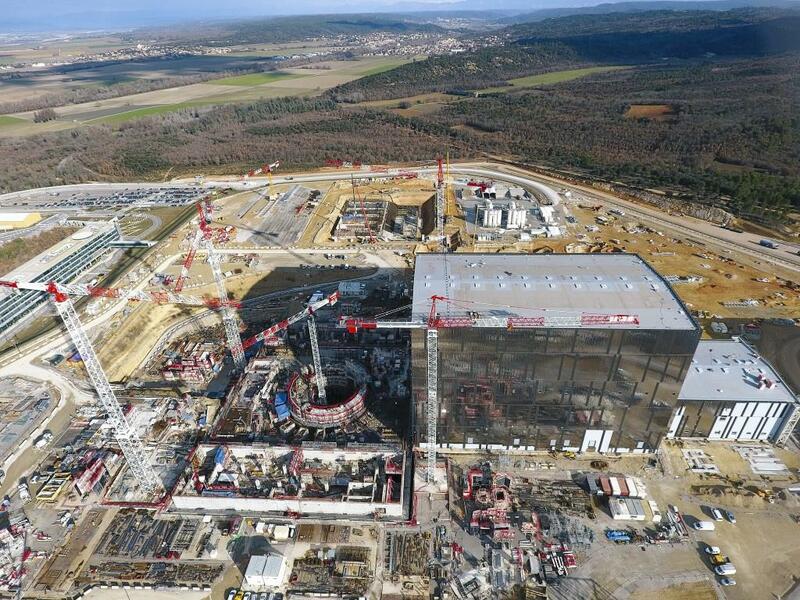 When construction of the Tokamak Building ends, the crane rails will be extended over the machine assembly area, as shown in the poster. 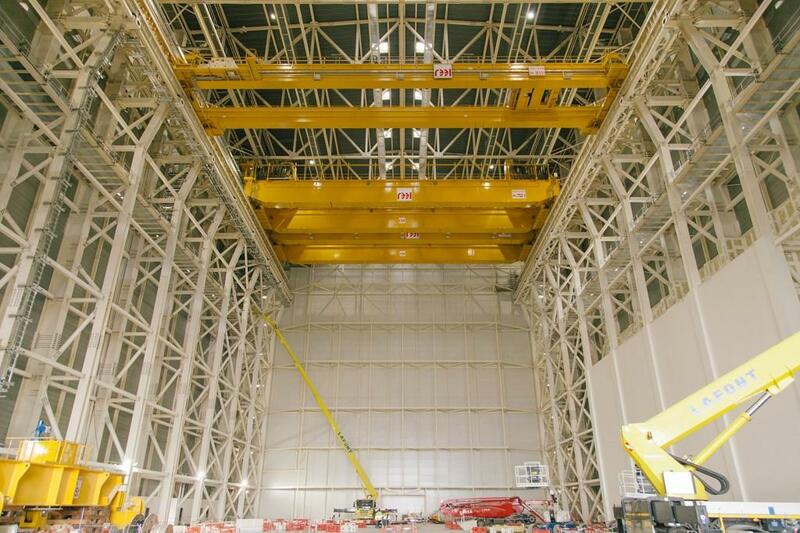 This striking view takes in the whole lifting system installed in the Assembly Hall: the massive double overhead bridge crane, with a lifting capacity of 1,500 tonnes (top), and its much smaller sibling the 50-tonne auxiliary crane sitting on rails three metres below. 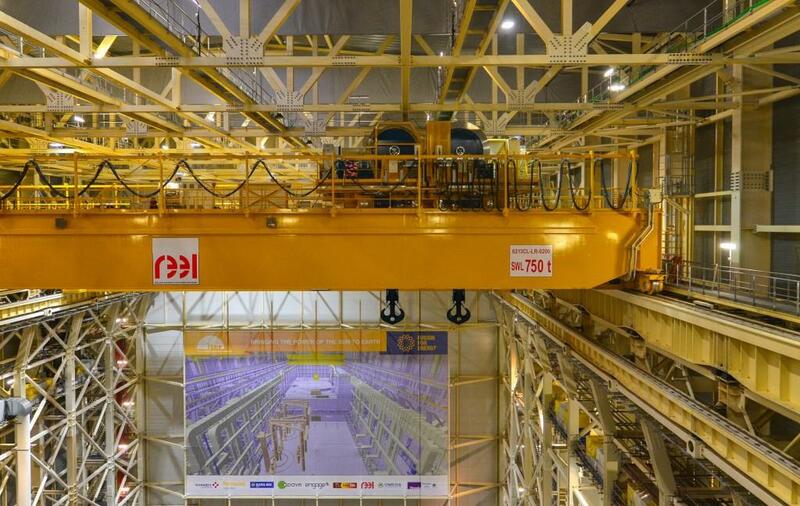 Trolleys and cranes of various capacities fill most of the space in the Assembly Hall rafters. 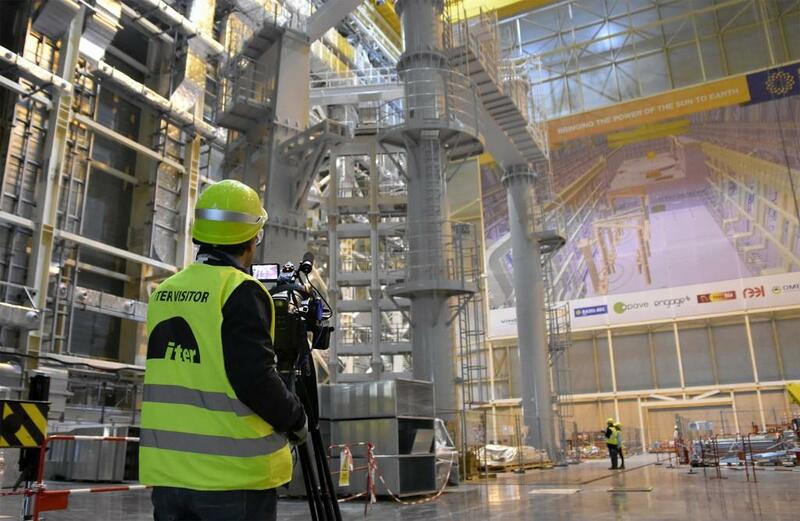 Like a catwalk in a theatre, they host the invisible machinery that makes the production possible. 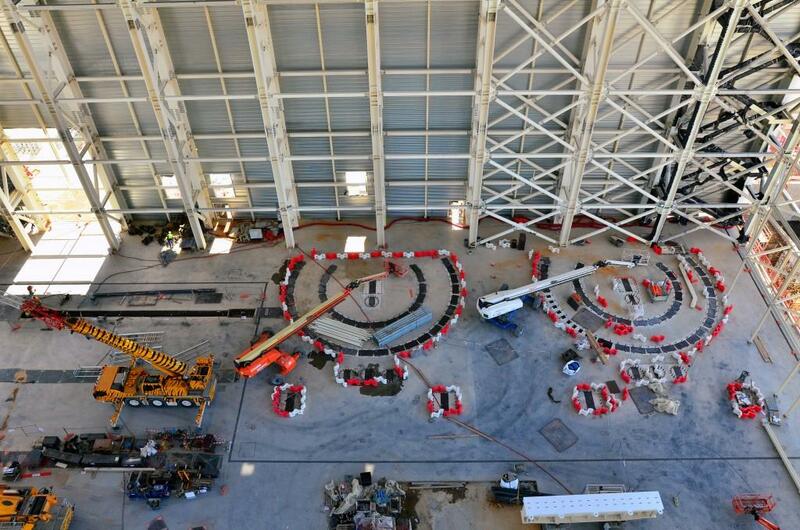 Plates and rails for the first of the twin Titans, SSAT-1, are temporarily in place. 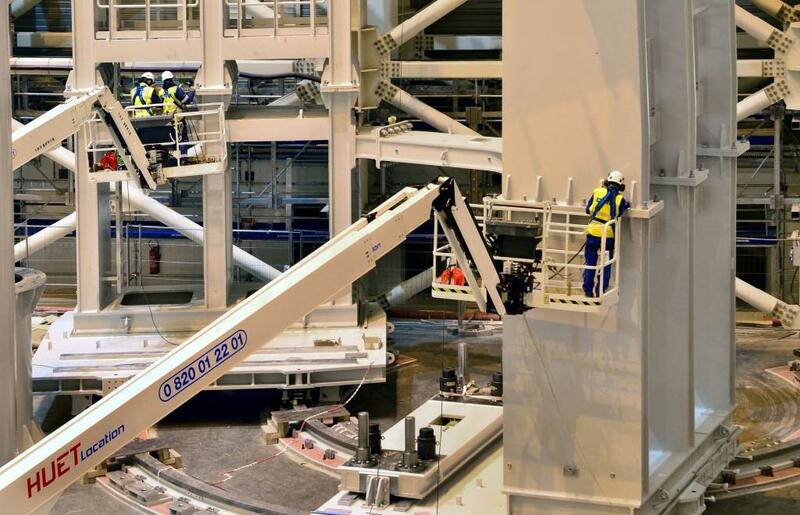 Once the torque has been hydraulically adjusted on every bolt and the positioning laser-aligned, the assembly of the 20-metre-high handling tool will begin. 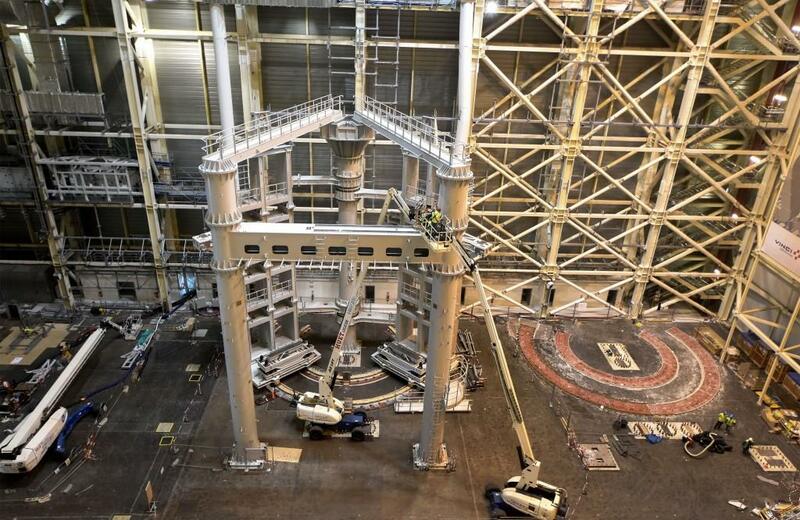 Procured by Korea, the twin SSATs are being assembled by technicians from the French company CNIM. 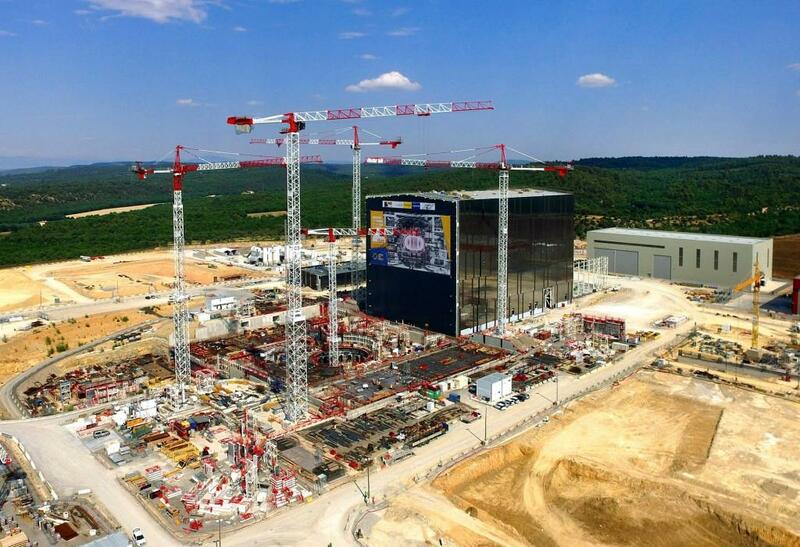 The operation is being closely monitored by quality insurance specialists from the ITER Organization, by ITER's Construction Management-as-Agent contractor MOMENTUM, and by a representative of the manufacturer Taekyung Heavy Industries (THI). 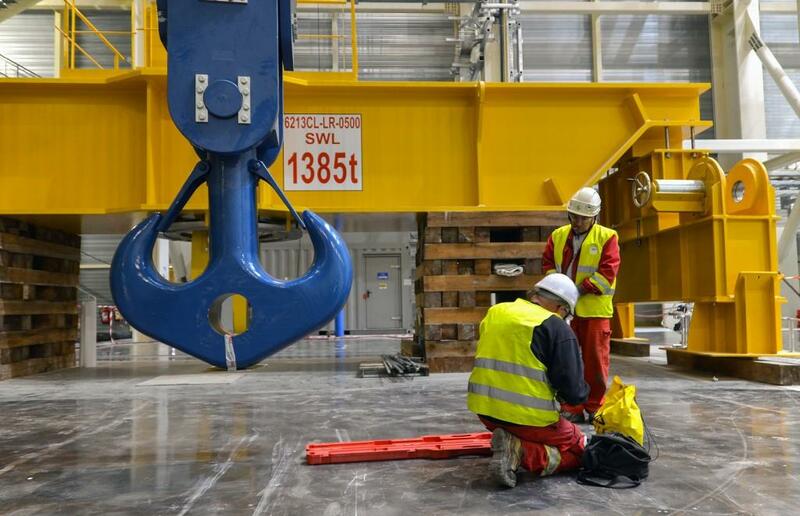 This massive hook is one of four, each with a lifting capacity of 375 tonnes, that belong to the double overhead bridge crane installed 43 metres above the floor in the Assembly Hall. 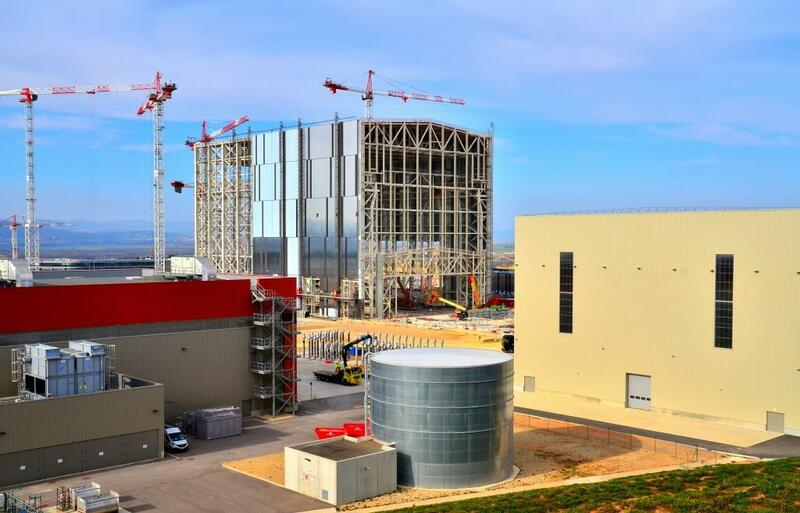 Load tests are scheduled to begin in the first week of December. 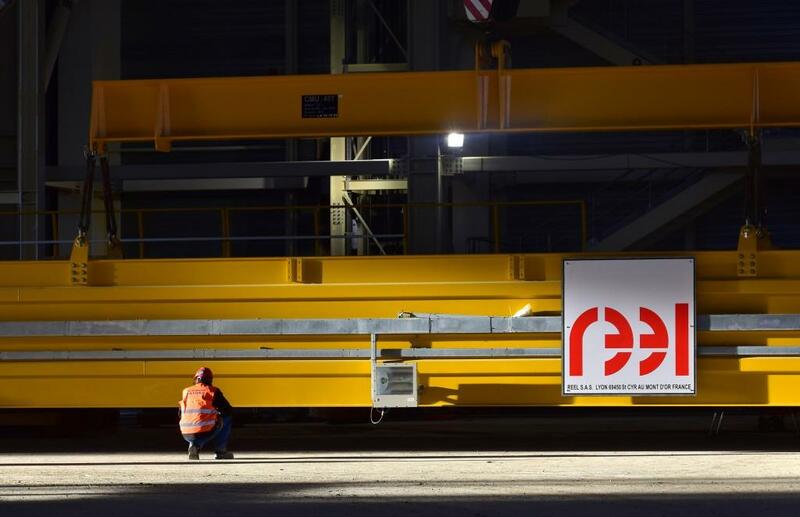 A final test at 25 percent over-capacity (1,875 tonnes) will verify that the flexion of the 43-metre-long bridge crane girders remains within specifications. 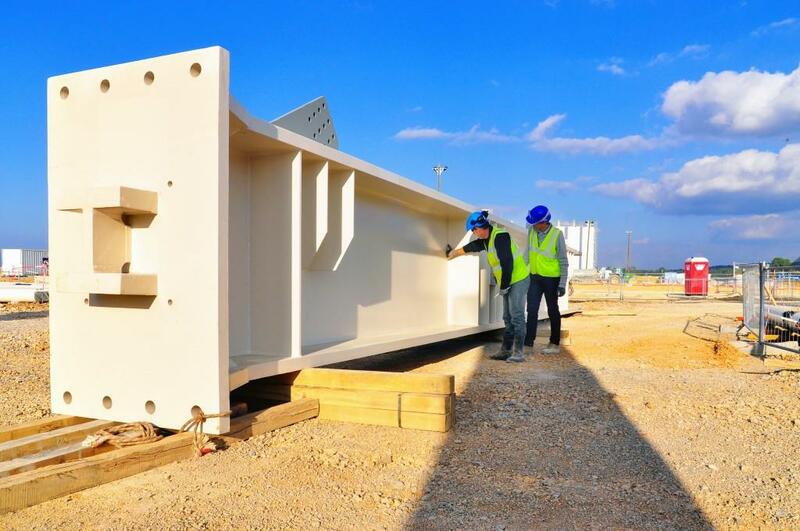 Rails have been installed on the base plates. 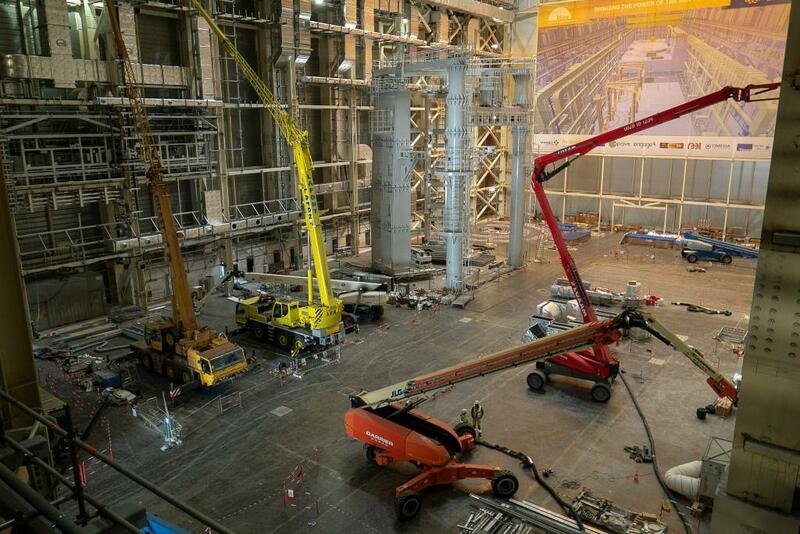 A new poster in the Assembly Hall shows how—once the temporary wall is removed—the cranes will travel into the Tokamak Building to deposit their loads. 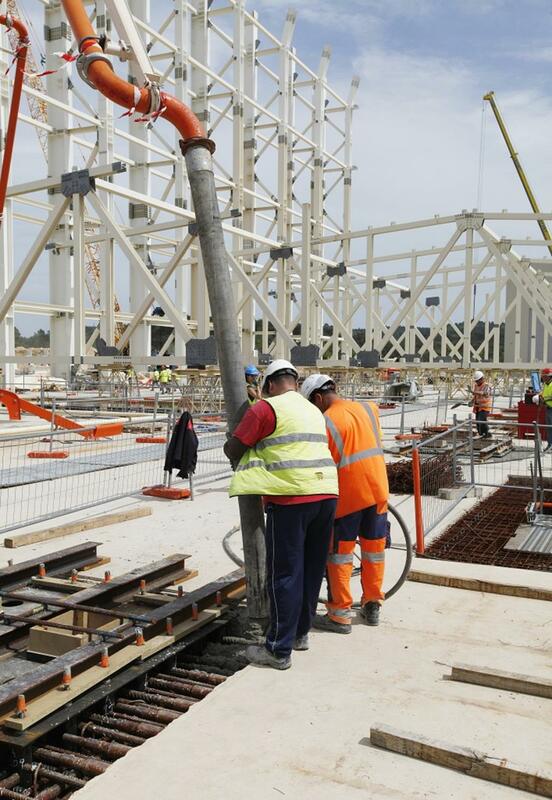 This large element will be the base segment of one of the tool's three huge columns. 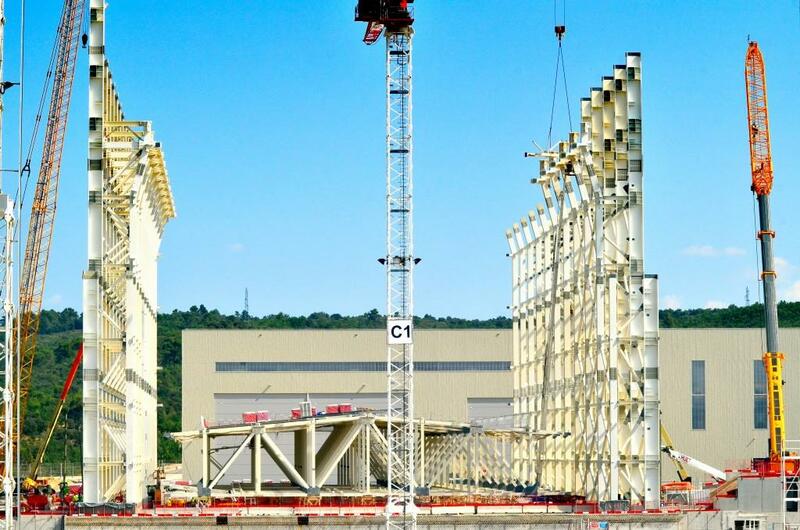 Three other segments of varying sizes will be stacked on top of it. 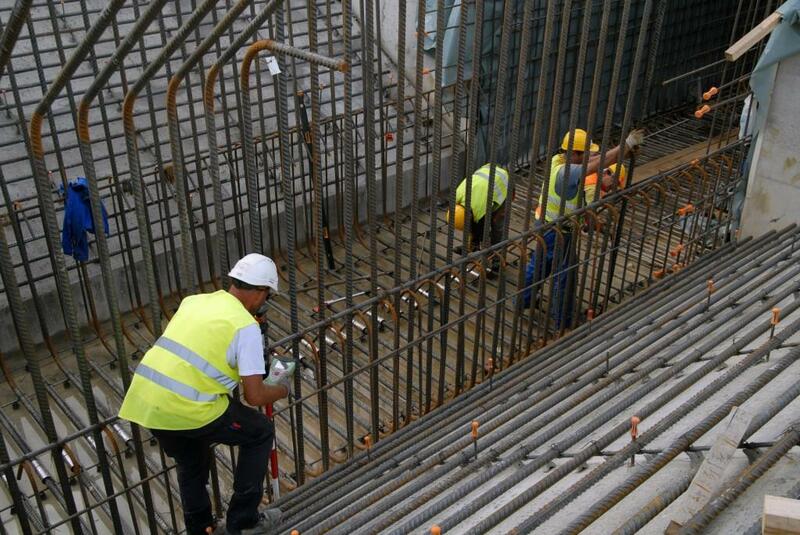 Details of the anchoring system for the tool rails. 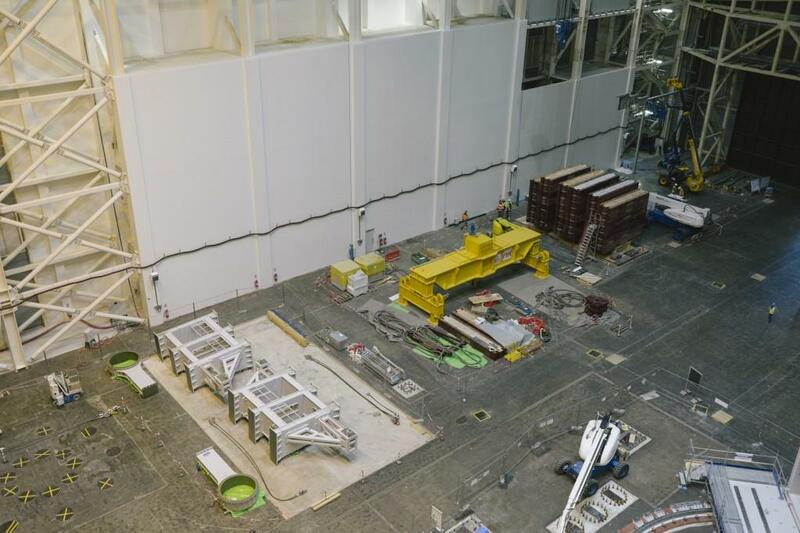 Everything is laid out for the first stages of assembly of the SSAT tools (for vacuum vessel Sector Sub-Assembly Tool), including the first "foot" of one of the massive columns. 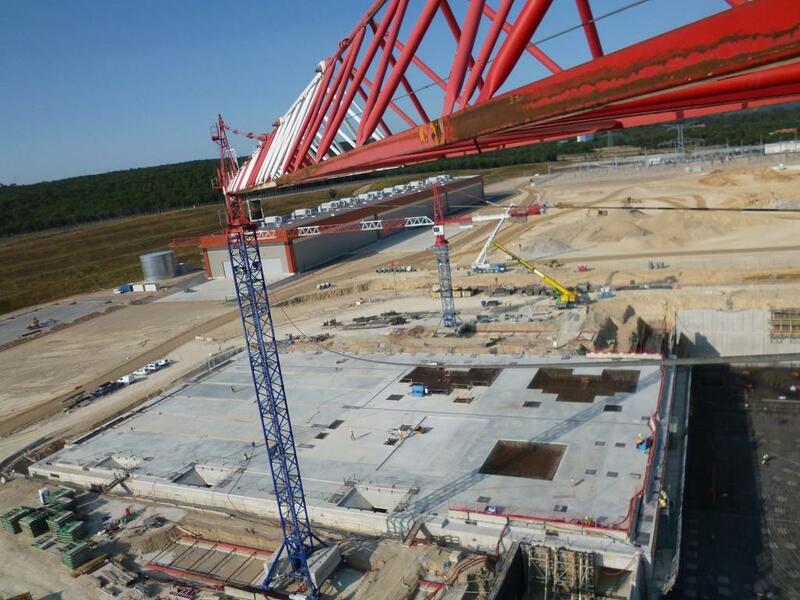 Just below the heavy lift cranes are two smaller, more agile cranes capable of lifting 50 tonnes. 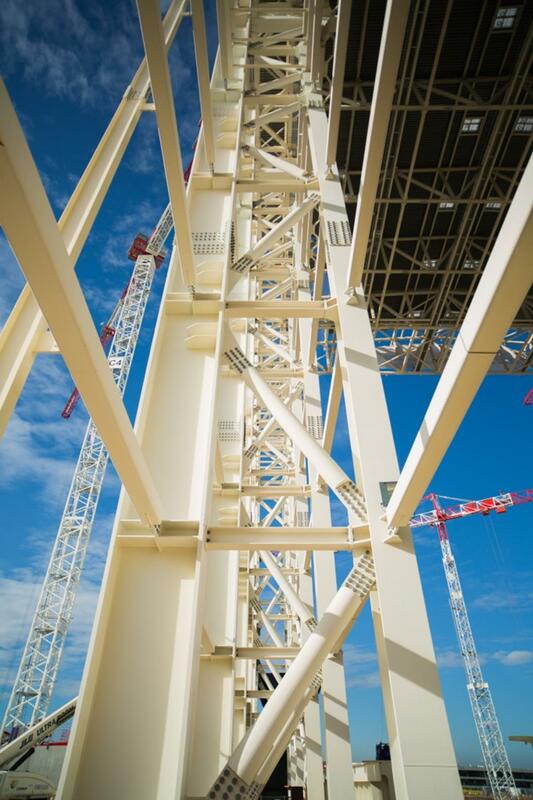 A close-up of one of the 750-tonne cranes, with hooks that are ready to lift 375 tonnes each. 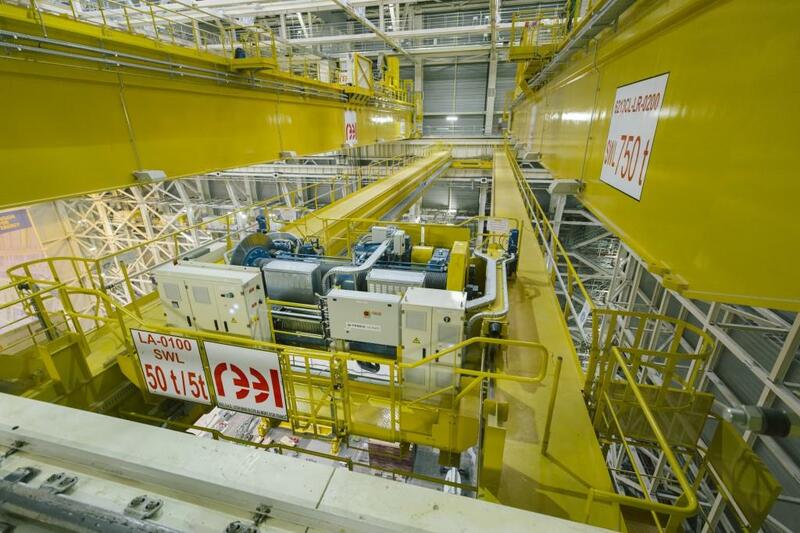 Load tests will be run soon as part of the crane's commissioning activities. 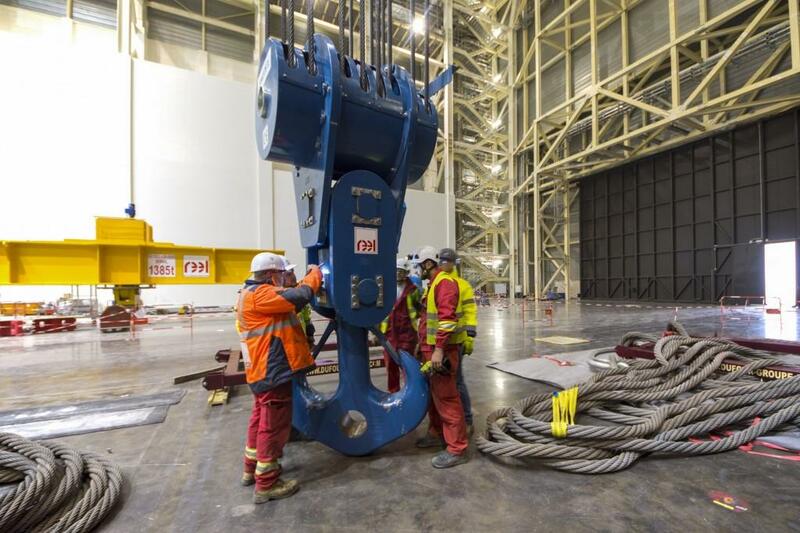 Four giant hooks like this one will hang from the double overhead cranes in the Assembly Hall, each one with a lift capacity of 375 tonnes. 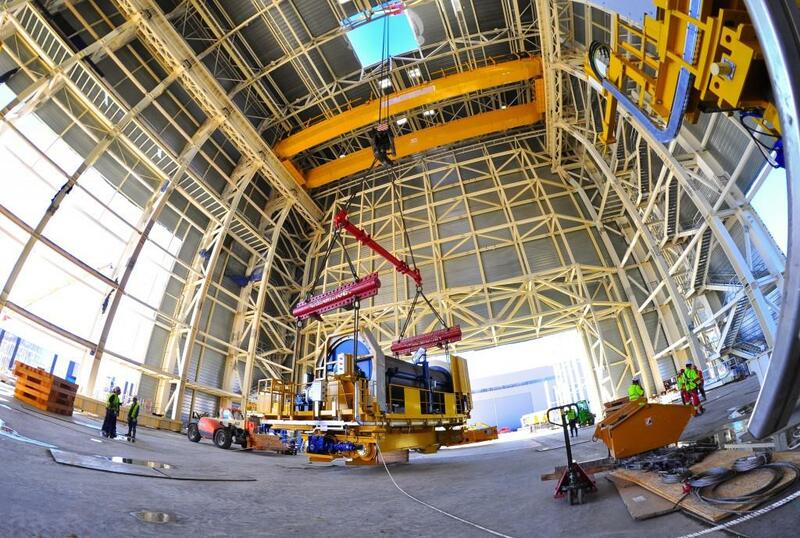 Before the mammoth tool can be erected in the Assembly Hall, the anchoring technology must be carefully installed. 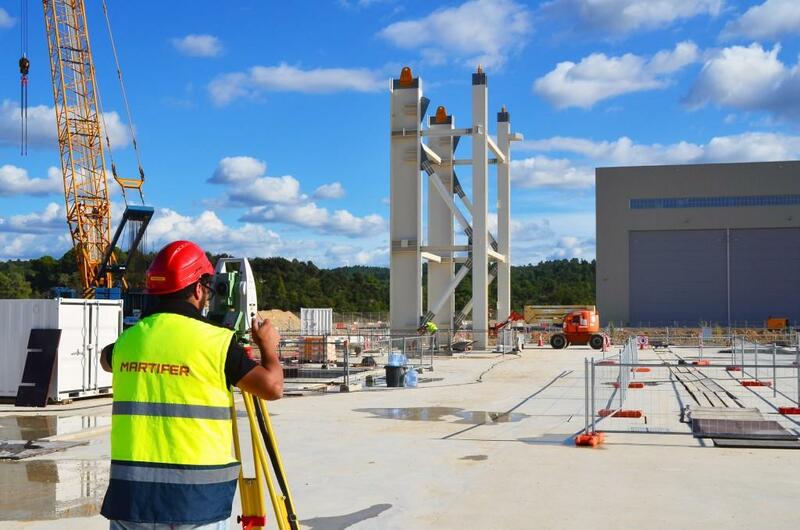 In the future, this vestibule will be dedicated to the cleaning of ITER components before they are delivered into the Assembly Hall. For now, though, part of it is reserved for storage. 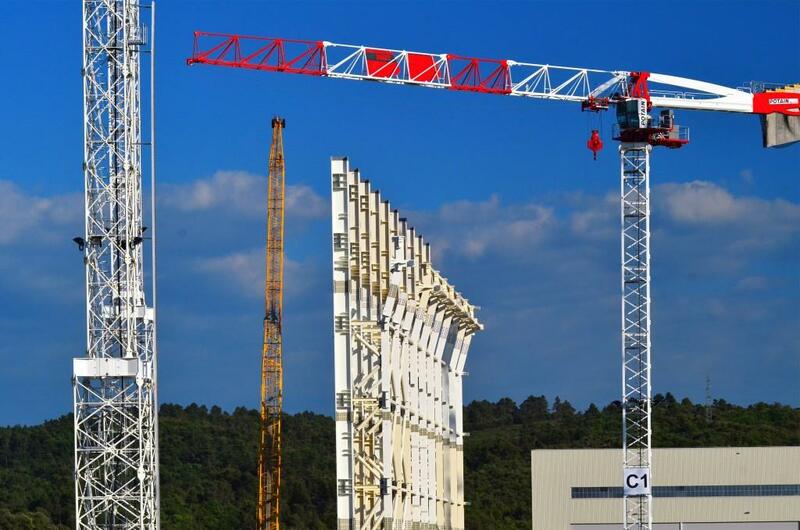 The French company CNIM has been charged by the Korean manufacture of the SSAT (sector sub-assembly tool) with the responsibility of mounting the tool in the Assembly Hall. 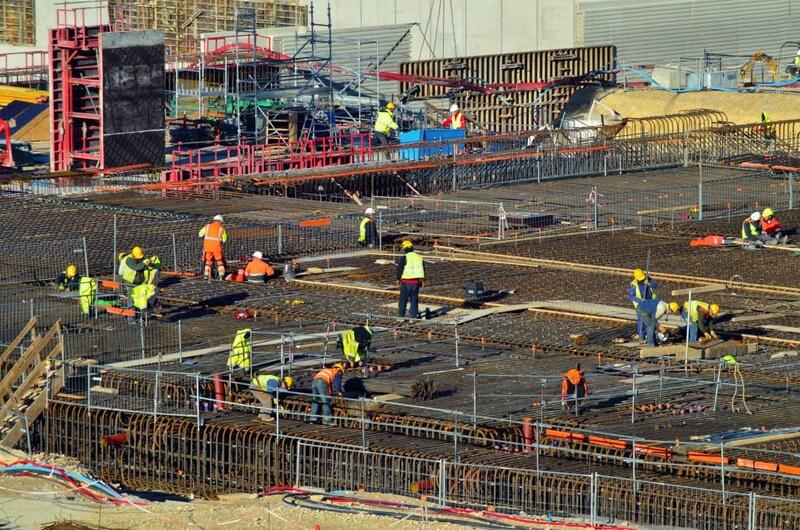 Work is underway now. 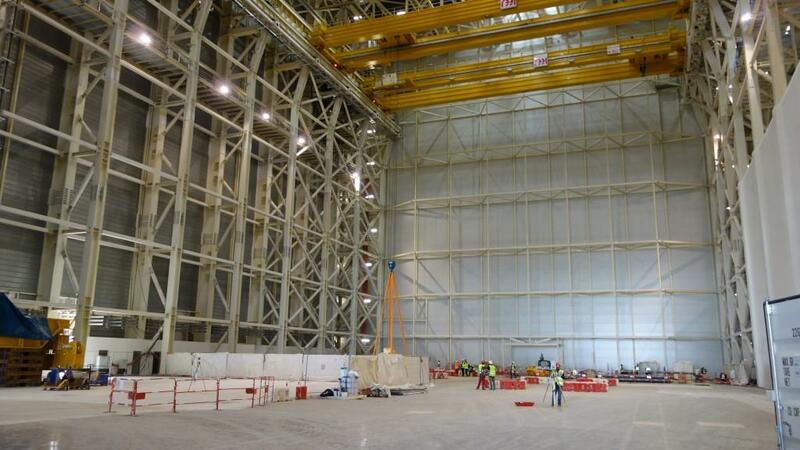 The SSAT tools for the pre-assembly of vacuum vessel sectors are monsters, weighing 800 tonnes and standing 22 metres tall. 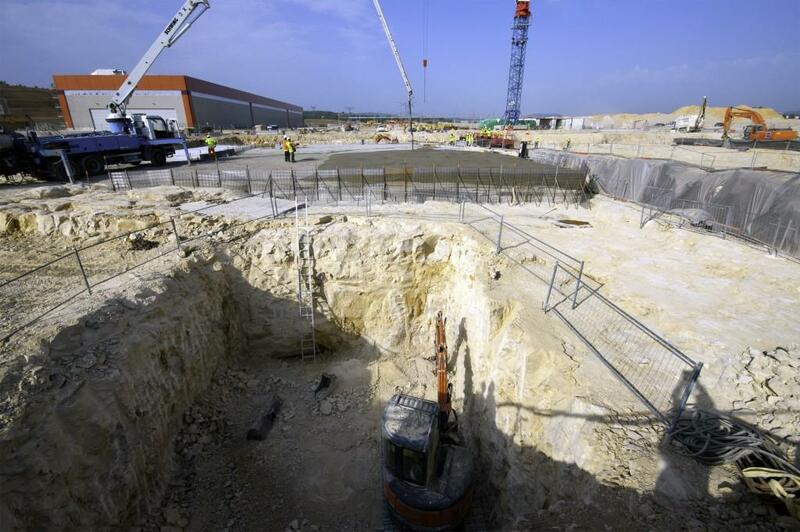 Seeing the size of the footprint helps us to measure just how massive they are. 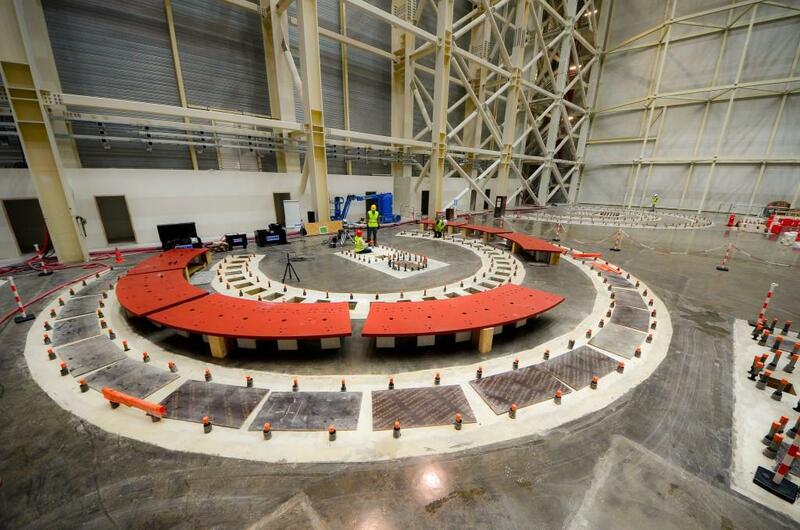 In one corner of the Assembly Hall, workers are installing the base plates that will support the rails of ITER's largest assembly tools—the twin sector sub-assembly tools (SSAT). 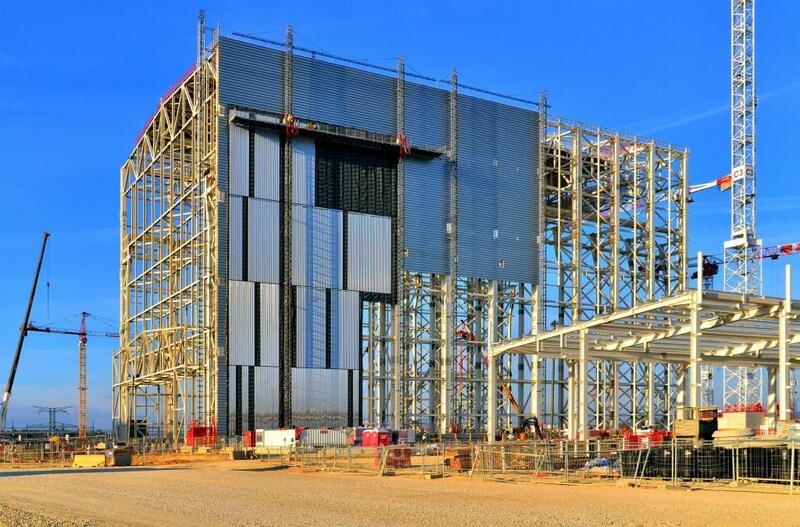 The red panels will be moved forward to mesh with the pre-built apertures, before the operation is repeated for the second row. 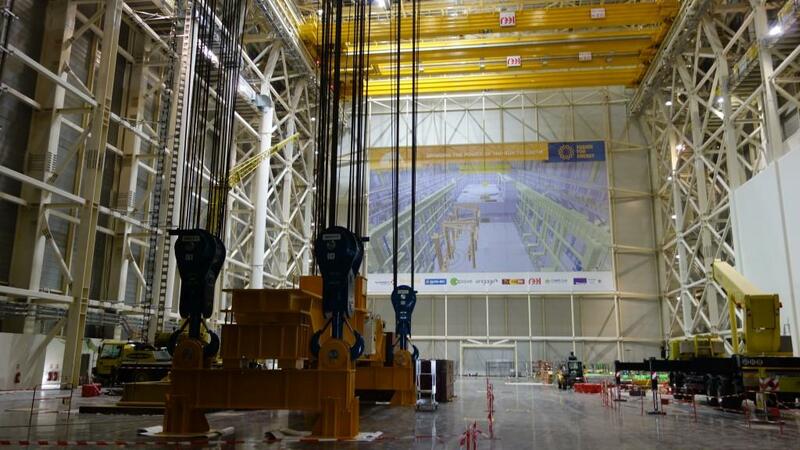 The two large overhead cranes of the Assembly Hall are currently undergoing functional tests. 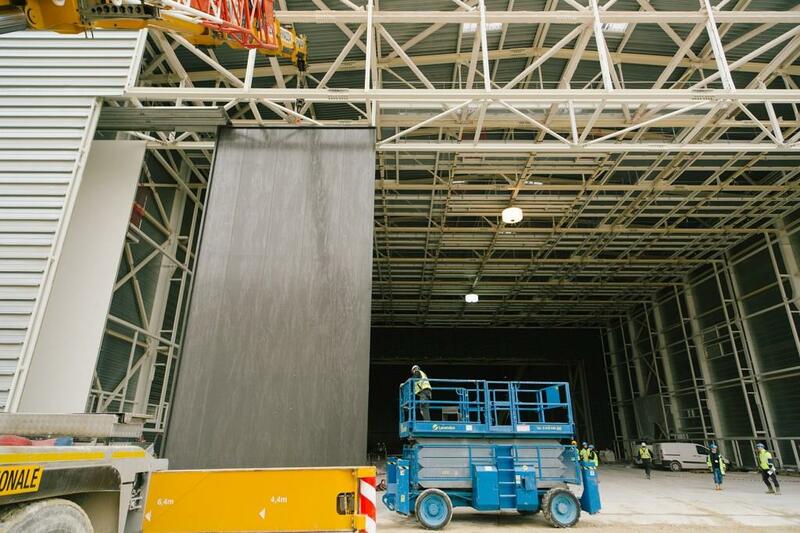 In the 60-metre-tall building for pre-assembly activities, workers go over the painted surface of the basemat. Not a small task! 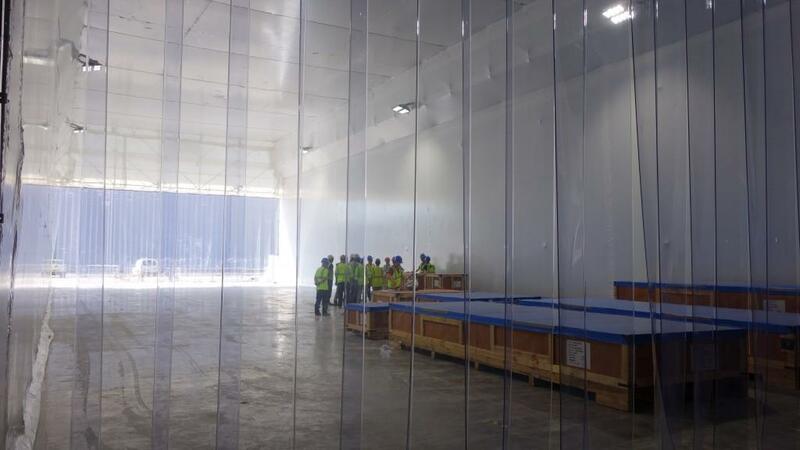 A "box within a box" space has been installed in the Cleaning Facility to store deliveries to the Assembly Hall. 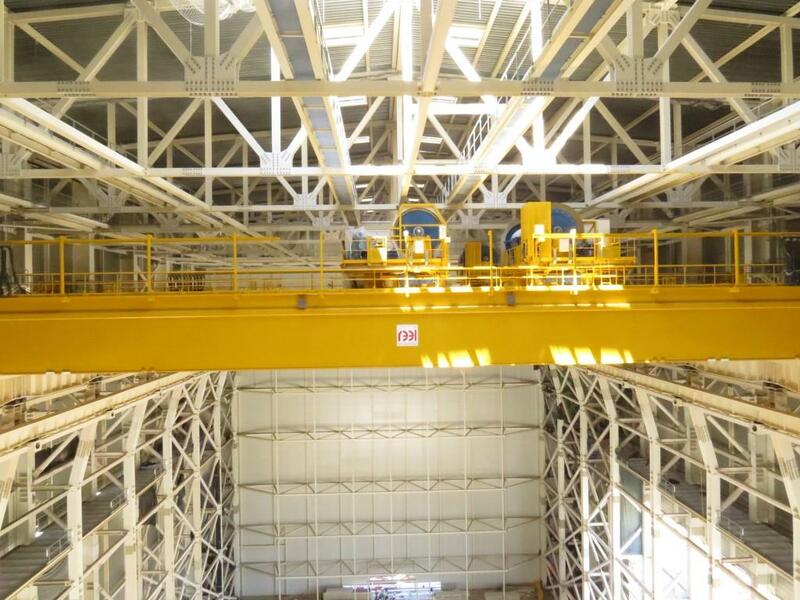 Functional tests for the overhead handling cranes are underway now. 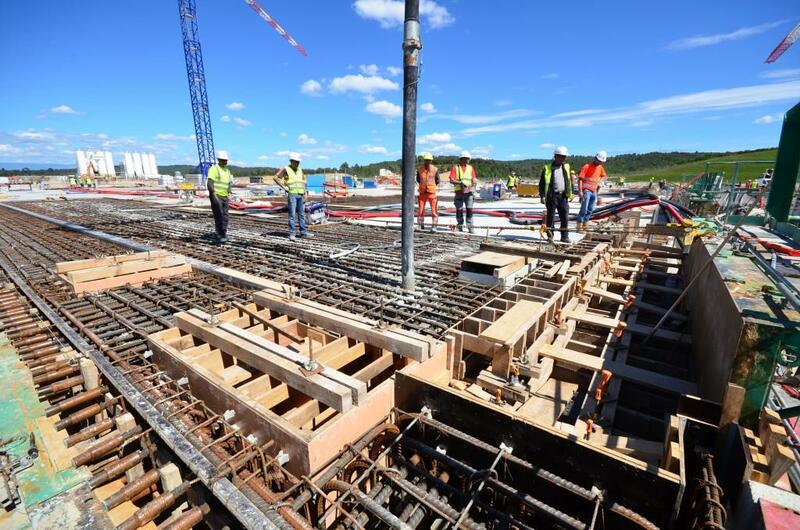 On the reinforced slab that has been prepared for the sector sub-assembly tools, contractors have already embedded anchor bolts onto which the rail base plates will be mounted. 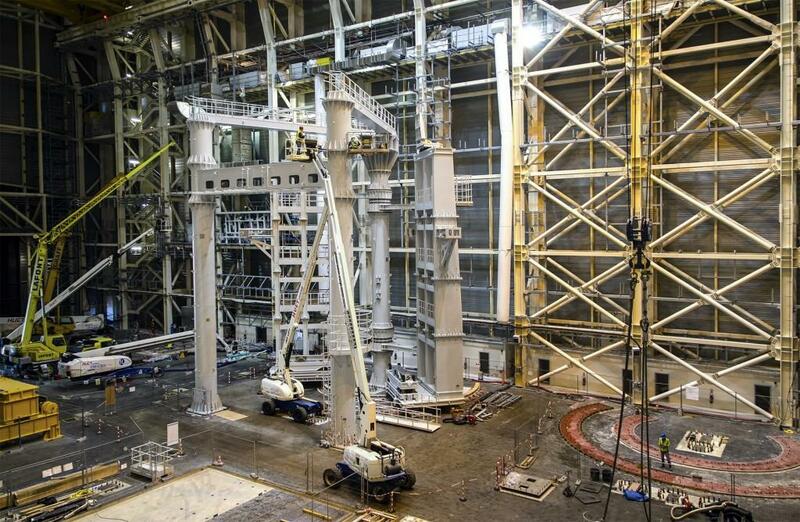 In the adjacent Cleaning Facility, a storage structure has been erected to keep the elements of the sector sub-assembly tools out of the dust during assembly. 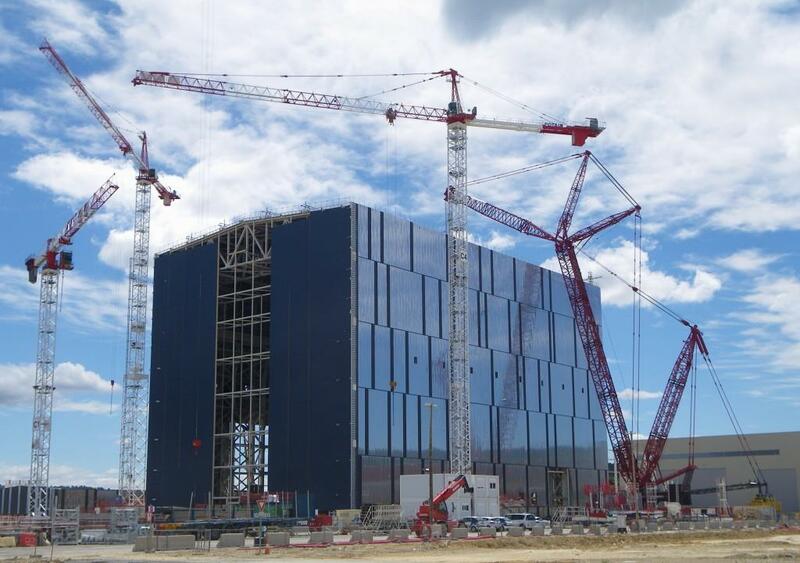 The first crates reached ITER in June from Korea. 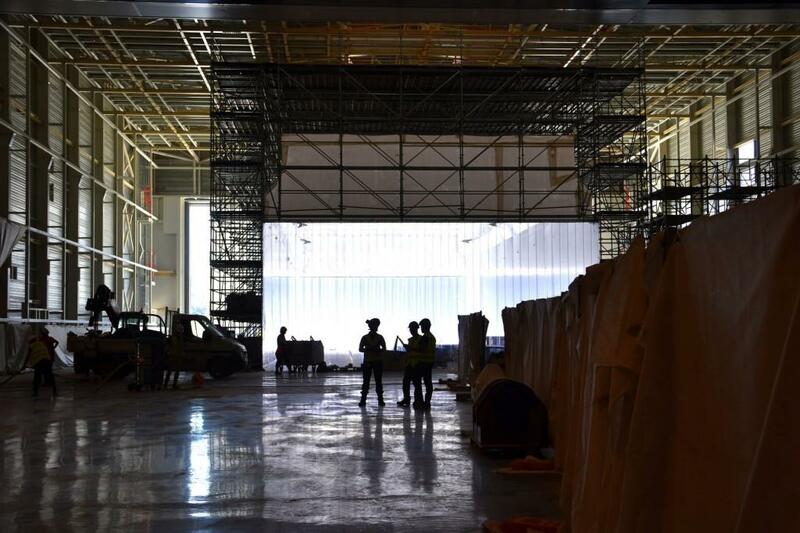 Around the back of the Assembly Hall, we can see through the open doors of the Cleaning Facility. 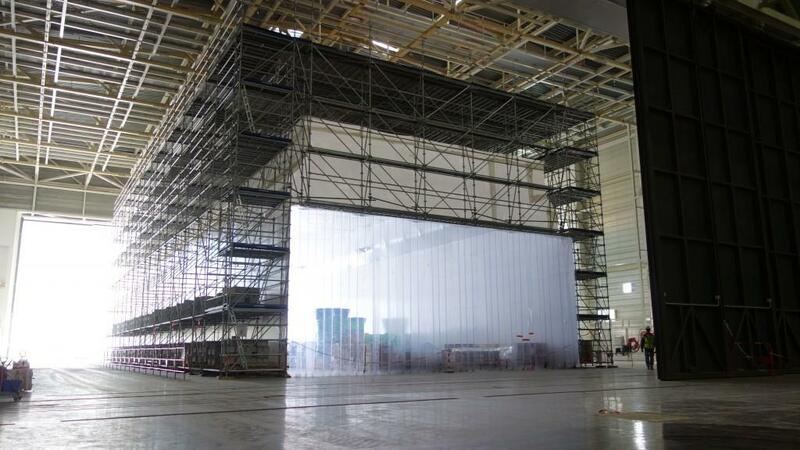 A temporary structure has been erected there for the storage of assembly tool components that are arriving from Korea. 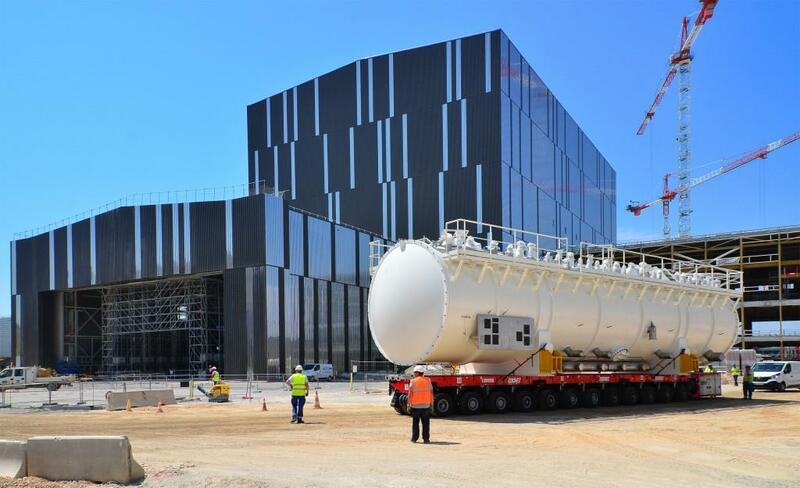 In the meantime, a helium cold box is transported along the road to the cryoplant. 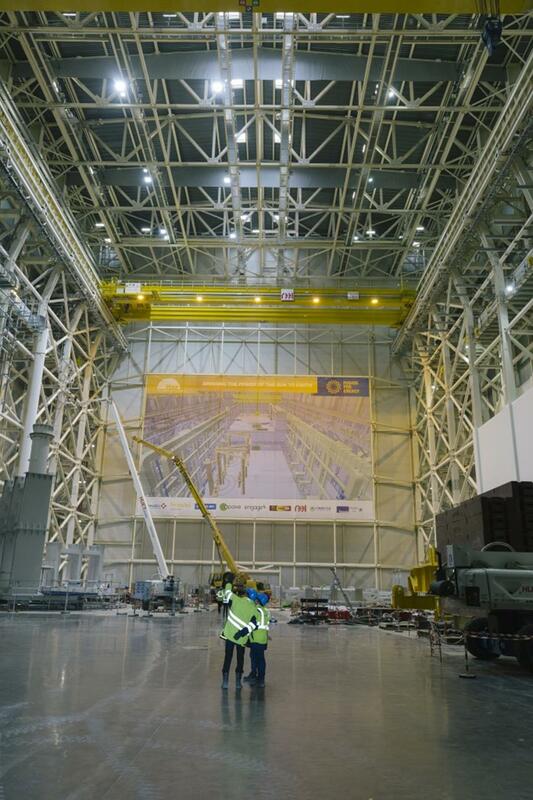 As the elements of the first giant sector sub-assembly tool begin arriving on site from Korea, workers are readying the corner of the Assembly Hall where they will stand. 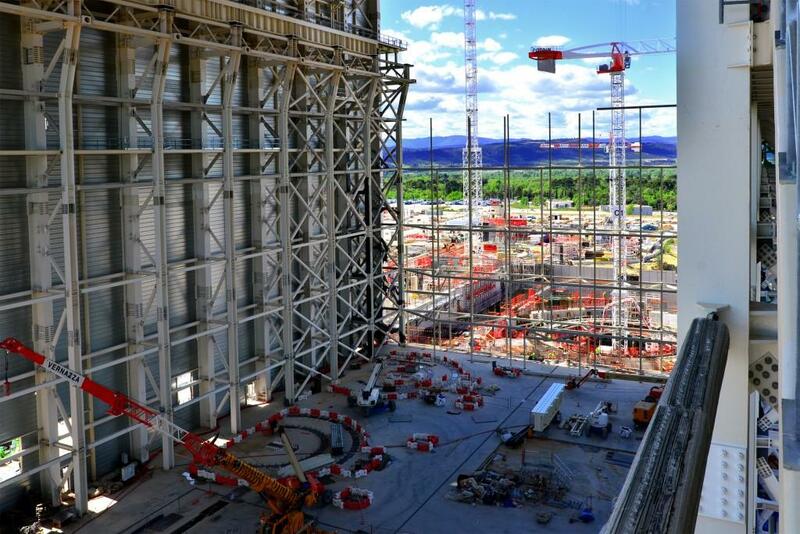 In front of the Assembly Hall, work is progressing on level L1 of the Tokamak Complex (ground level). 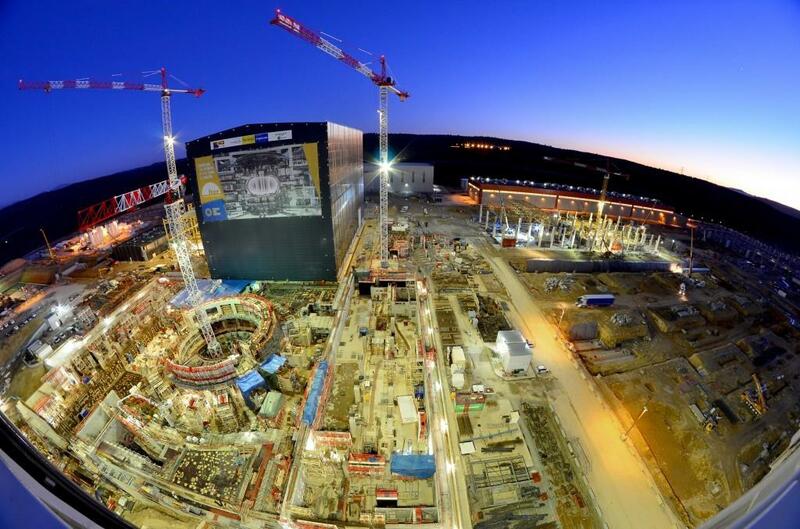 When the Tokamak Building is completed in 2018, it will stand as tall as the Assembly Hall. 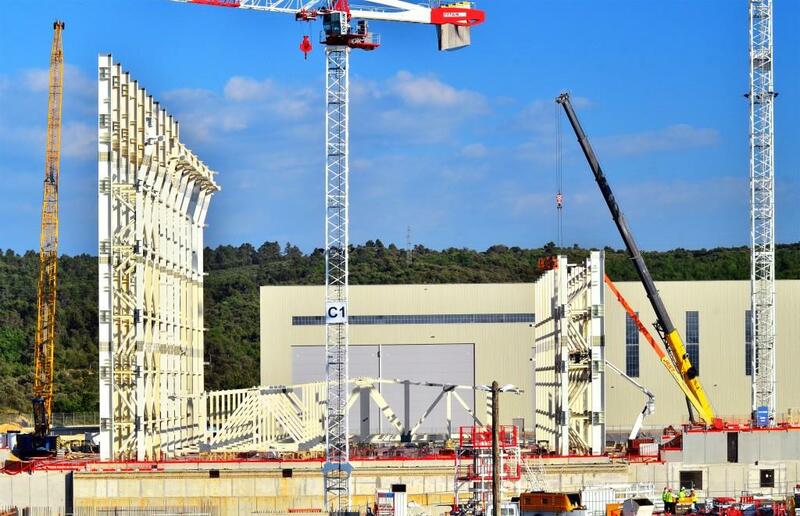 After the installation this week of the facility's second overhead crane, the next milestone will be the delivery of the first bespoke tool for ITER assembly—one of the two giant sub-sector assembly tools. 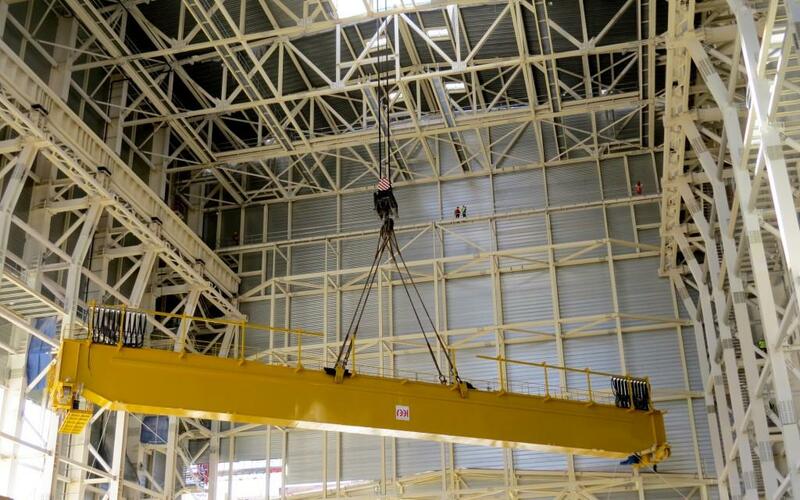 The NKMNOELL-REEL consortium (formed by NKMNoell Special Cranes, Germany and REEL SAS, France) has manufactured two pairs of cranes for the Assembly Hall: the 750-tonne cranes installed in June 2016 and the 50-tonne auxiliary cranes, pictured. 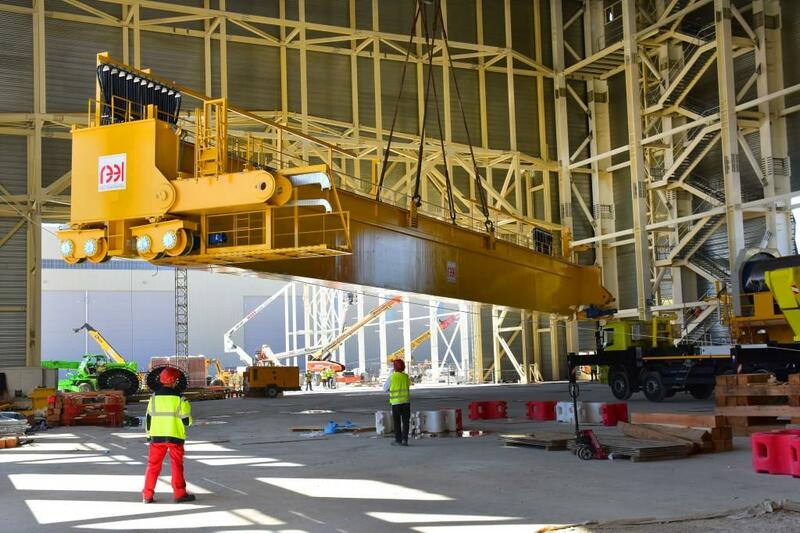 Cranes are used inside the building to lift the girders of the 50-tonne crane into place. 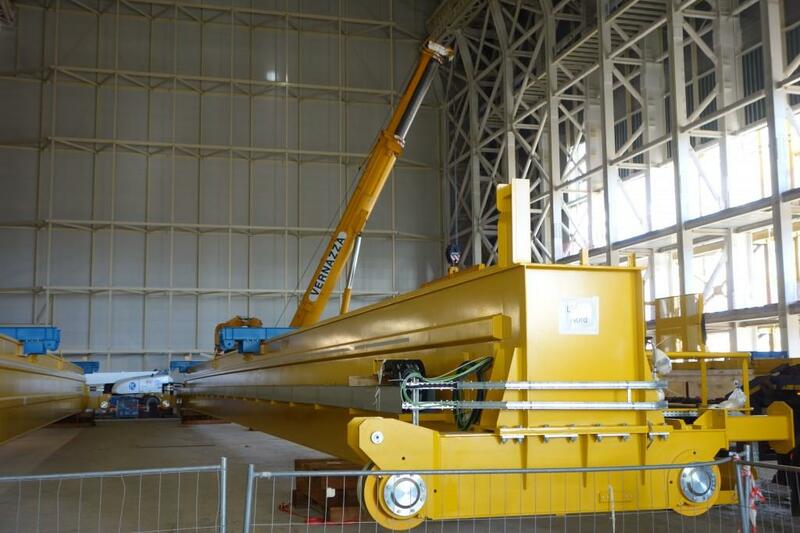 This auxiliary crane will be installed on rails that are a few metres below the heavy-lift crane. 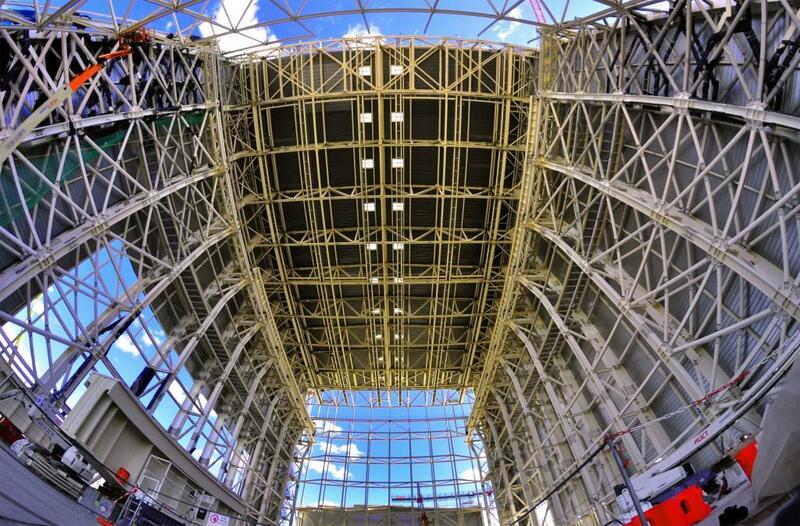 Looking up at the reflective surface of the Assembly Hall. 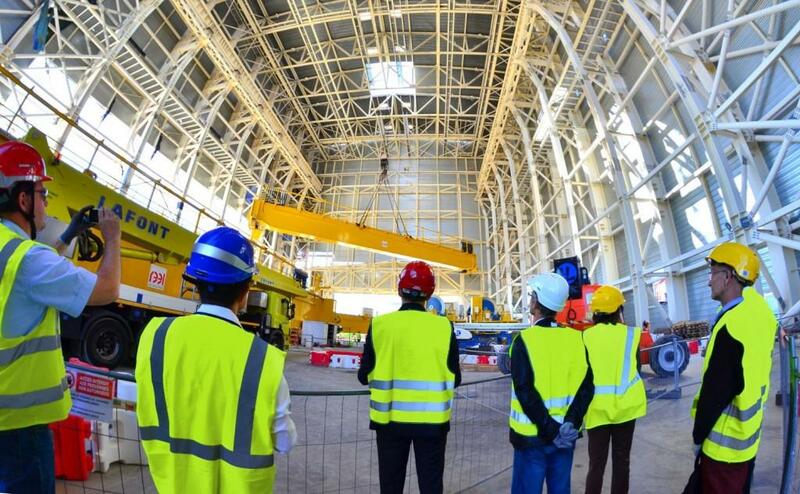 In addition to two overhead cranes with a lift capacity of 750-tonnes each, the Assembly Hall will be equipped with a set of 50-tonne cranes. 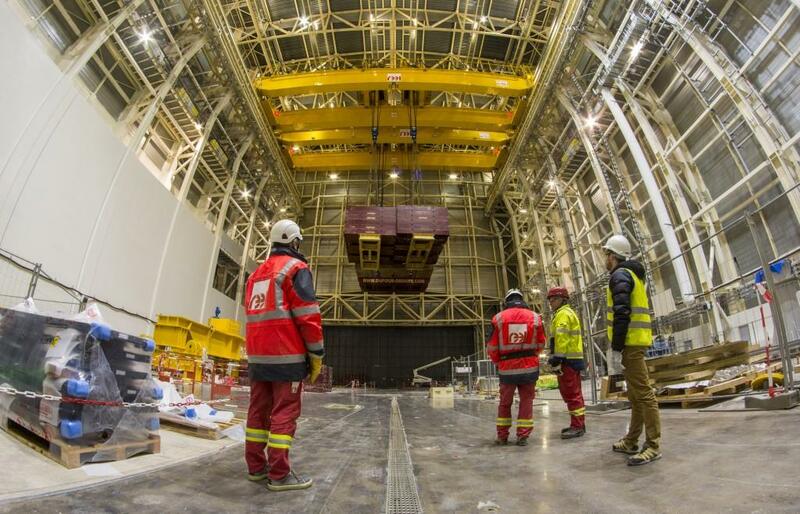 In November, four girders for this smaller set were delivered to the shop floor. 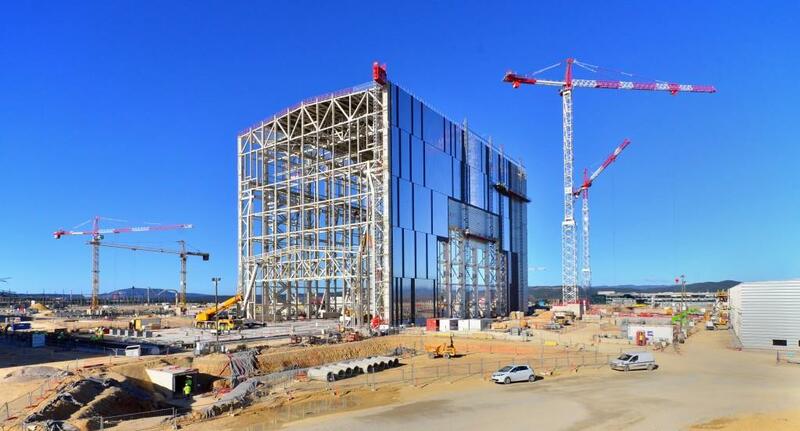 The Assembly Hall, with its giant poster of the ITER machine, is the most visible feature of the ITER site from a distance. 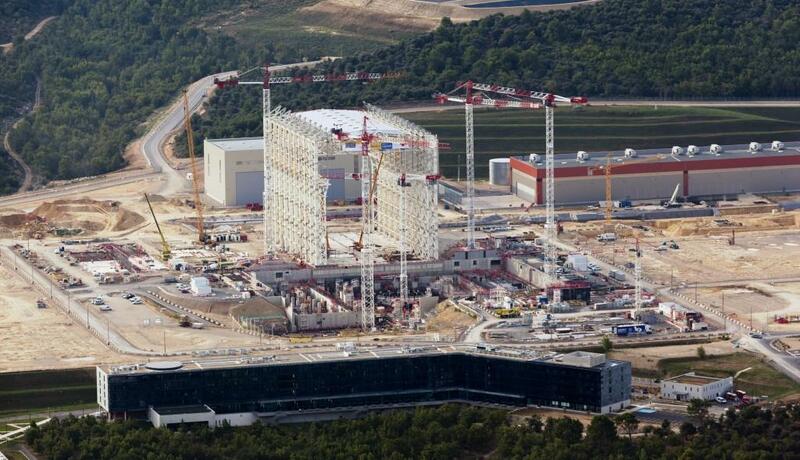 In 2018, the adjacent Tokamak Building will match it in height. 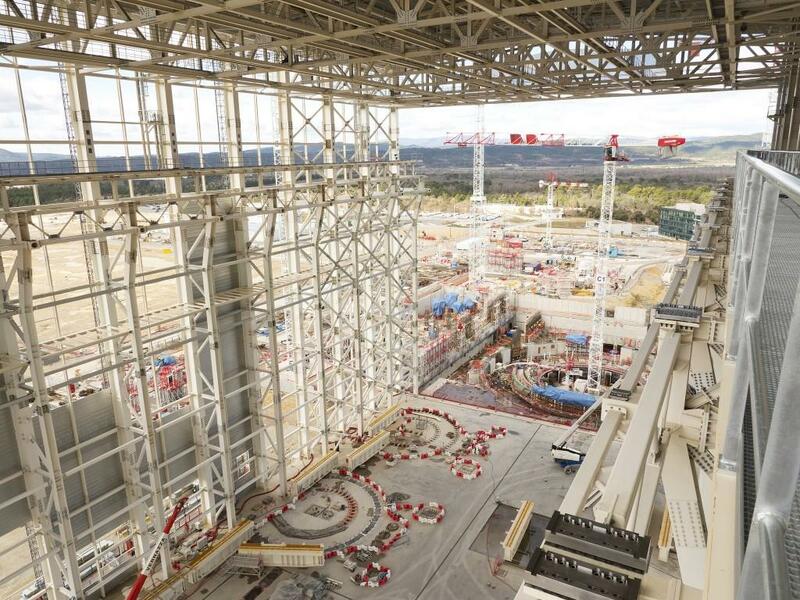 The 60-metre-tall Assembly Building seen from the B1 level of the Tokamak Complex. 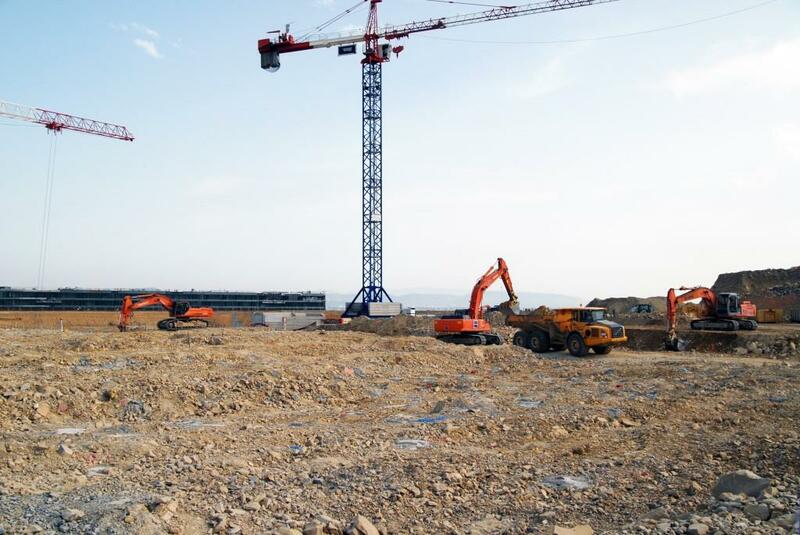 Work is currently underway on level two of the seven-storey building. 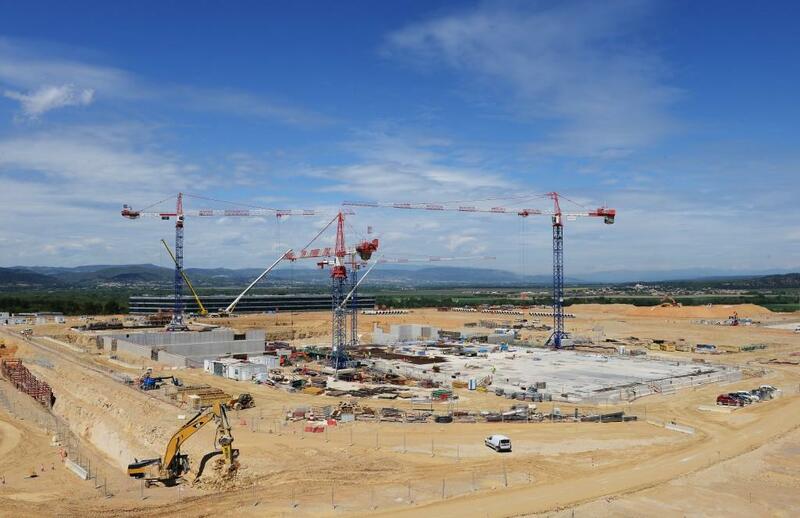 The assembly cranes are in place, and a project milestone for 2016 has been achieved. 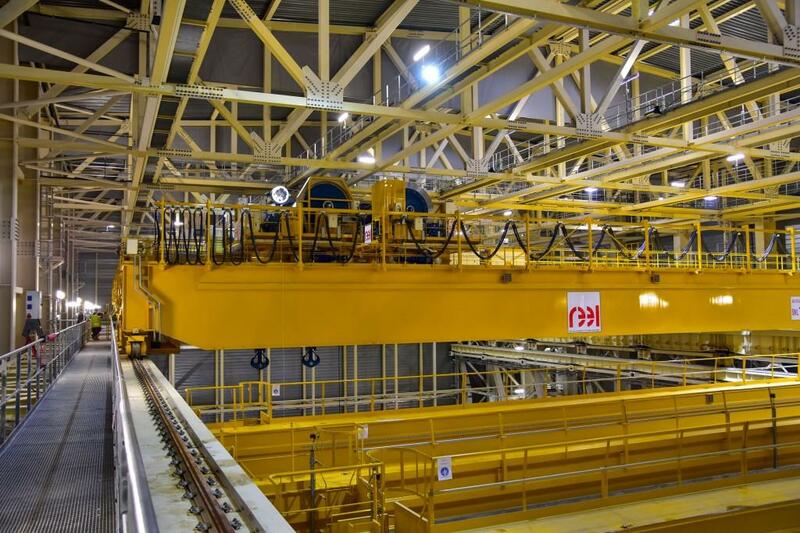 A close-up of the rail mechanism employed for the overhead cranes. 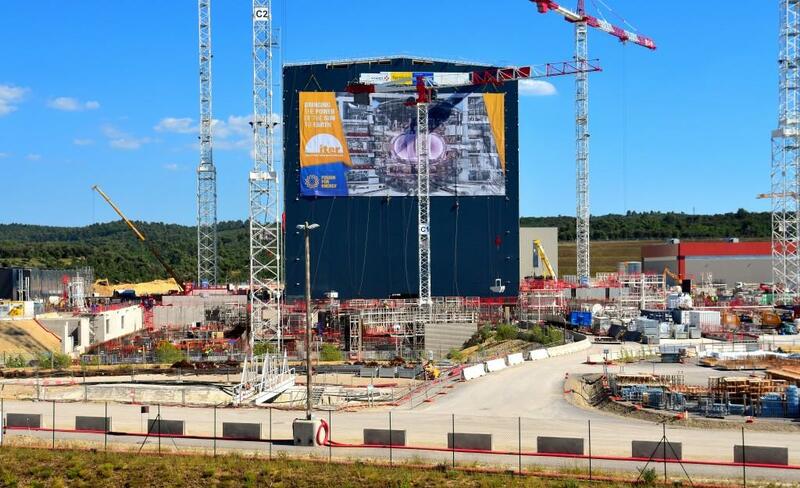 A giant poster (25 x 50 m) of the Tokamak ensconced in its concrete building has been installed on the temporary wall of the Assembly Building. The poster image is 70 percent of the machine's actual size. 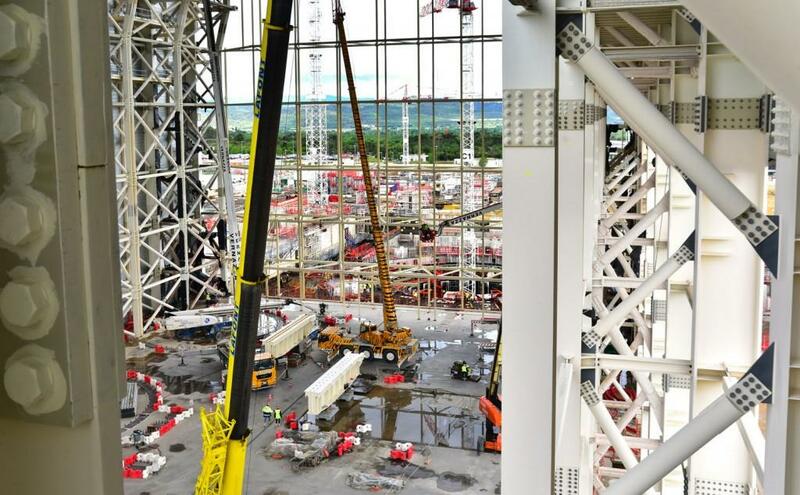 In late June, two trolleys remain to be lifted and installed for the main Assembly Hall cranes. 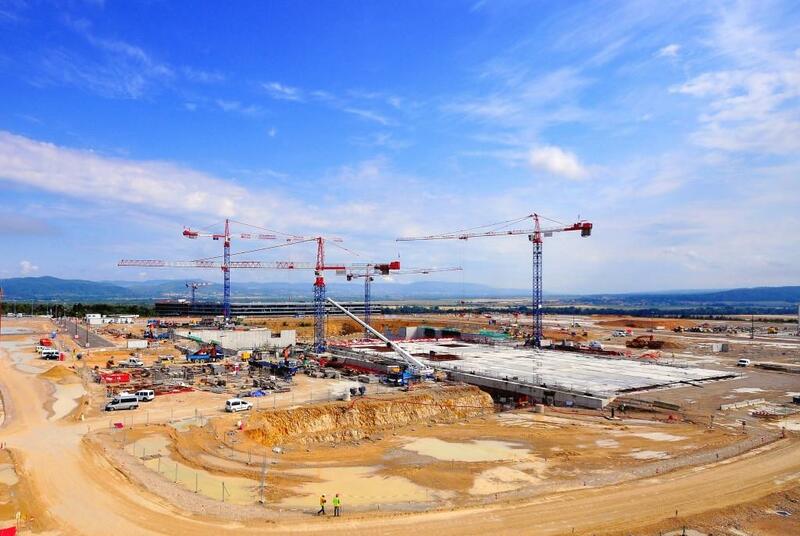 Two smaller cranes, each with a lifting capacity of 50 tonnes, will be installed in September/October. 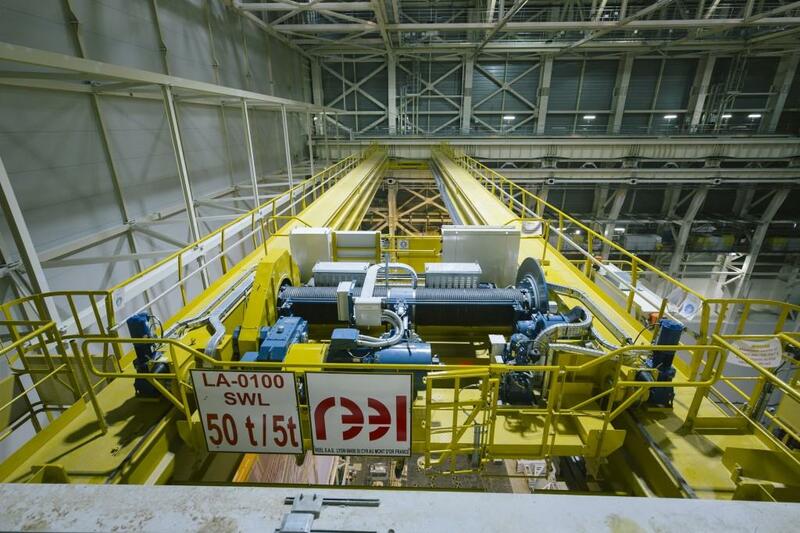 Before the lift, the load must be carefully balanced on the hook. 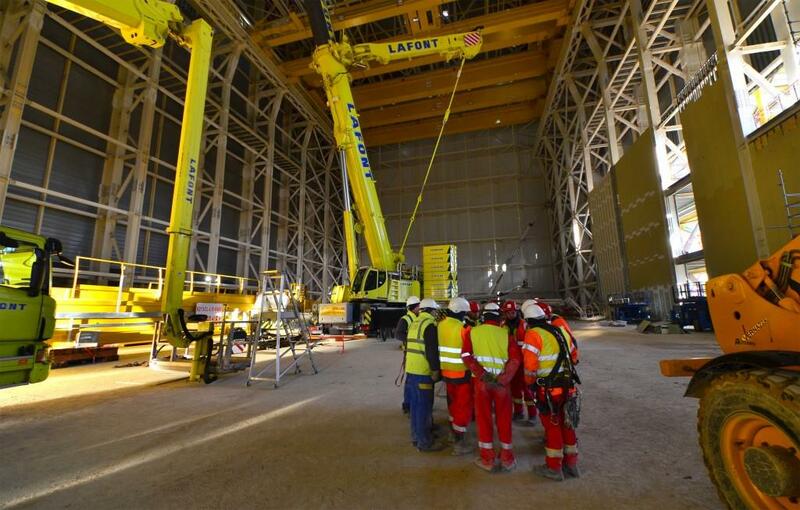 This operation takes much longer than the actual lifting. 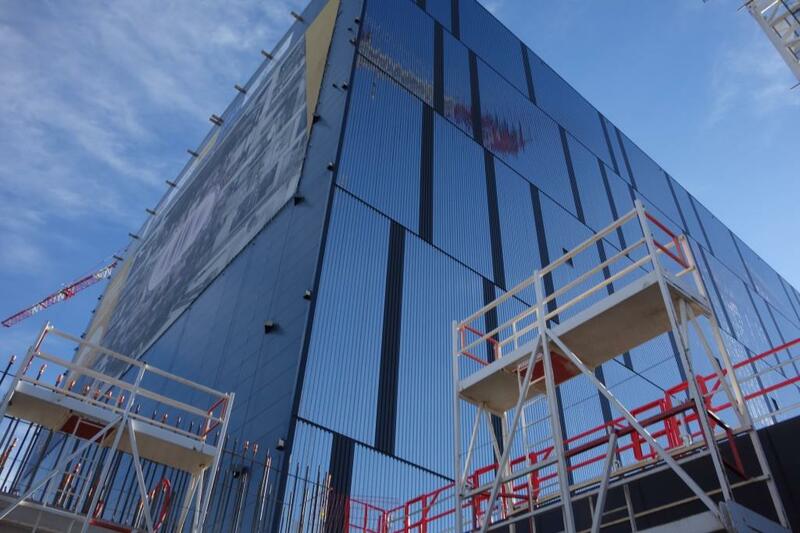 Cladding is now completed. 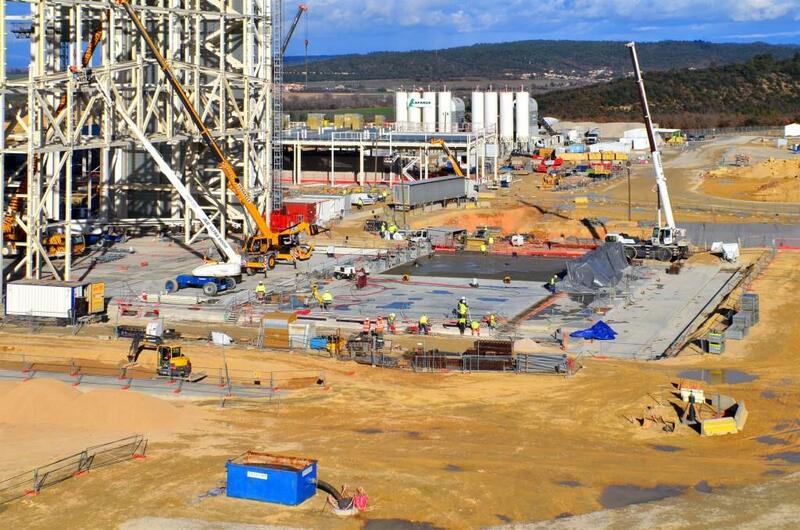 In a few days, a giant poster of the ITER Tokamak will be installed. 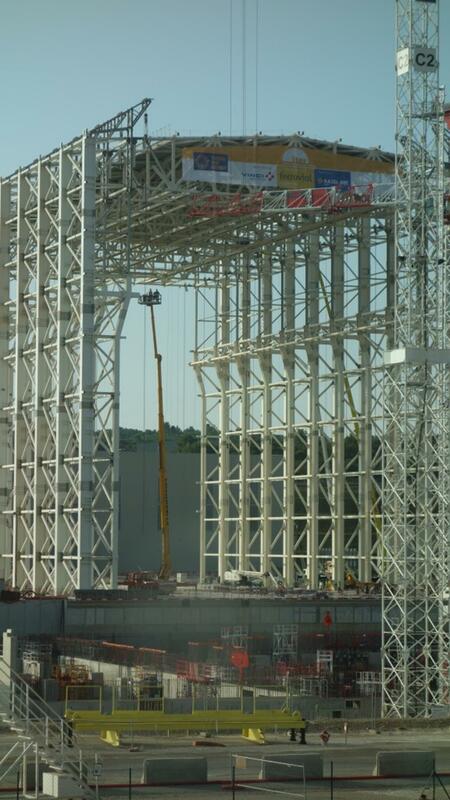 On Friday 17 June, a trolley is lifted to join the two girders already in place. 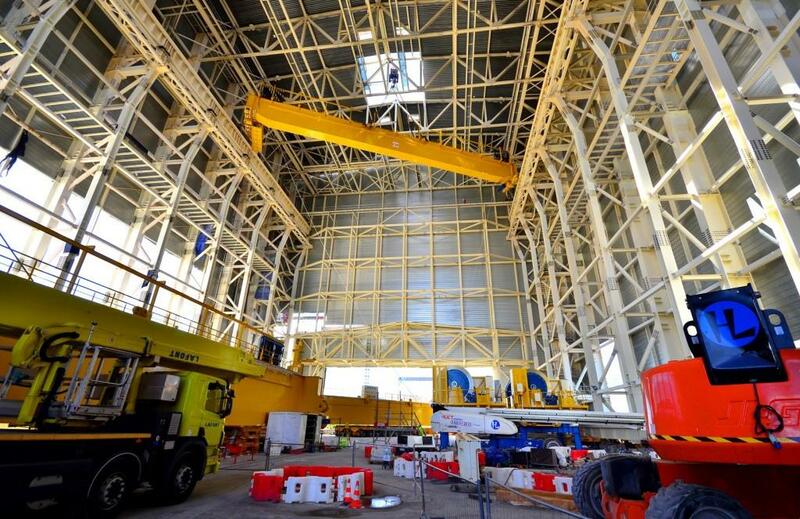 Operators moved the girders to the end of the building to free the opening in the roof. 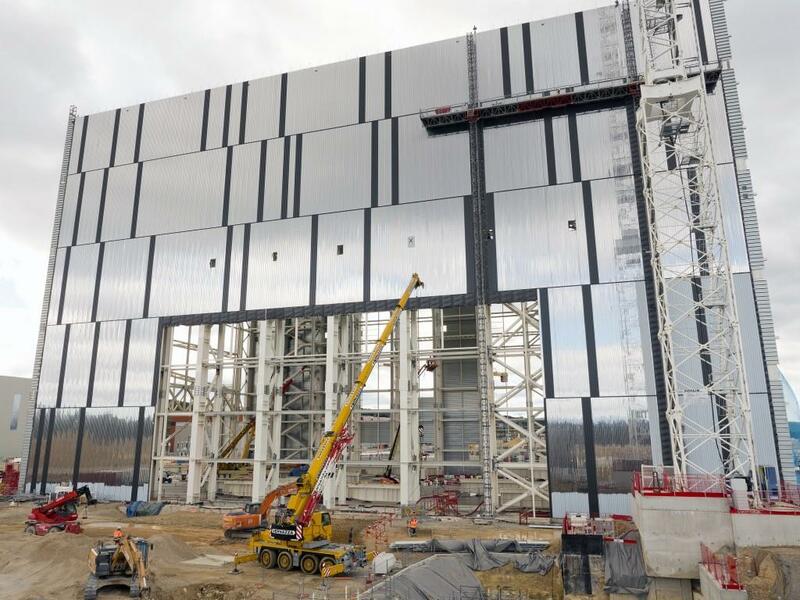 The cladding on the northwest facade of the building is nearly completed, and the crawler crane is in place for crane assembly. 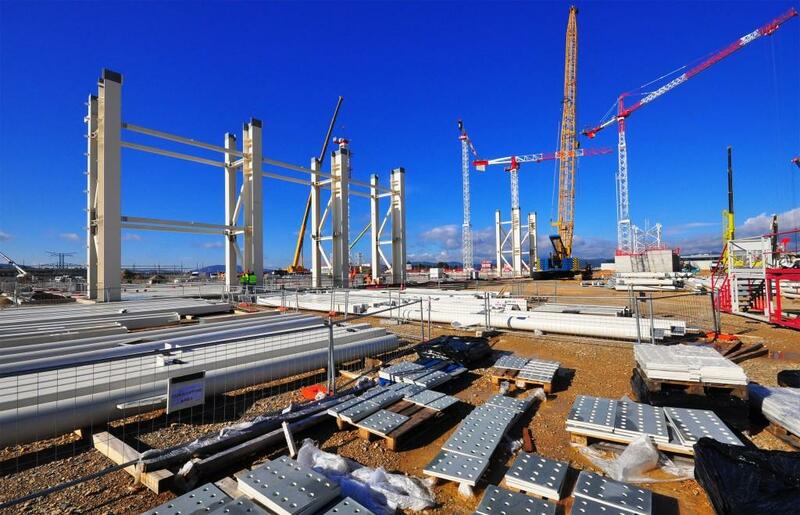 Four girders and four trolleys will be lifted into place over a period of 10 days. 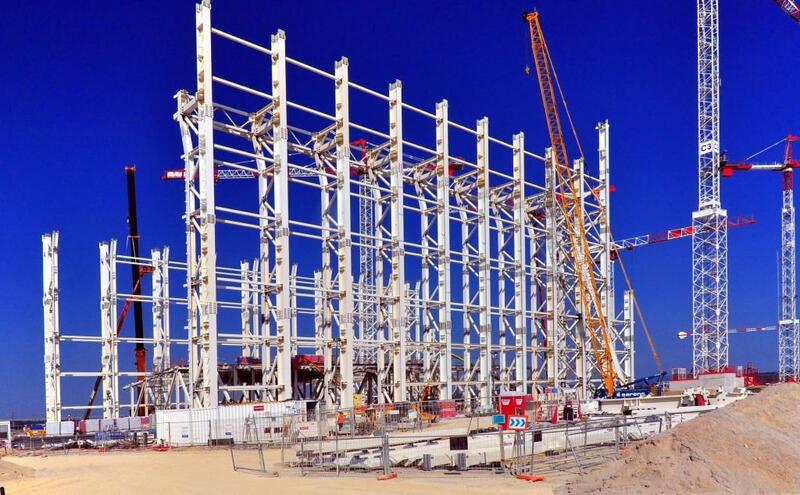 The first girders were installed on 14 and 16 June, followed by first of the four 100-tonne trolleys. 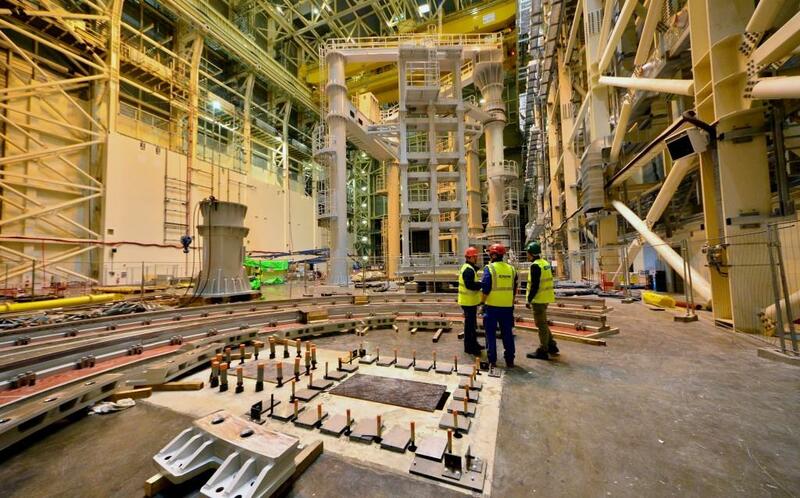 Gear motors, wheels, braces, and electrical equipment ... the fitting out of the girders has added some 30 tonnes. 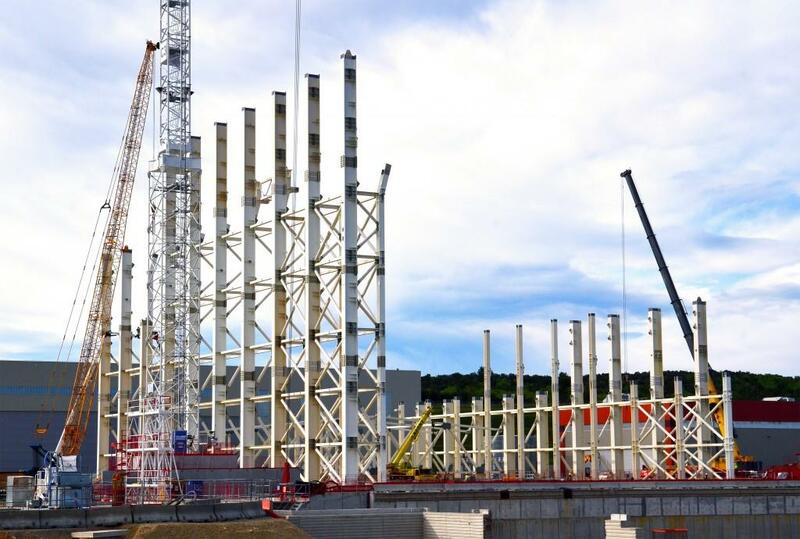 Each girder now weighs 186 tonnes. 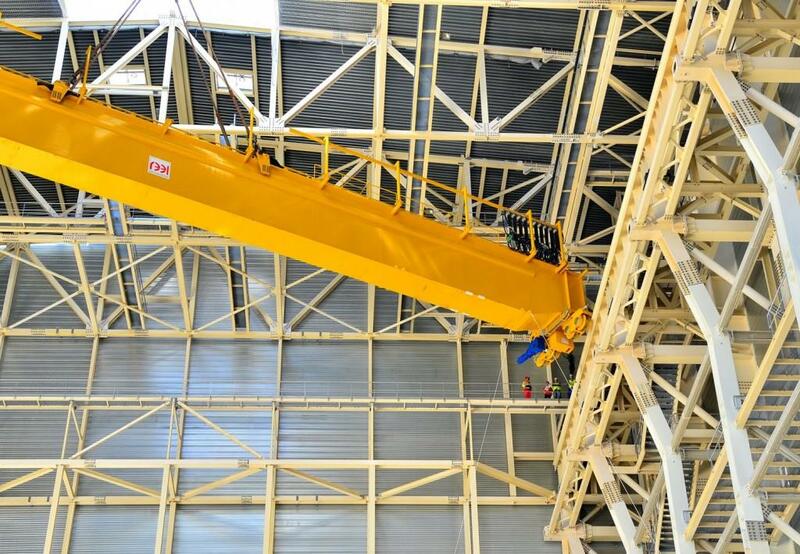 A man-sized hook is passed through an opening in the roof by the beam of the crawler crane. 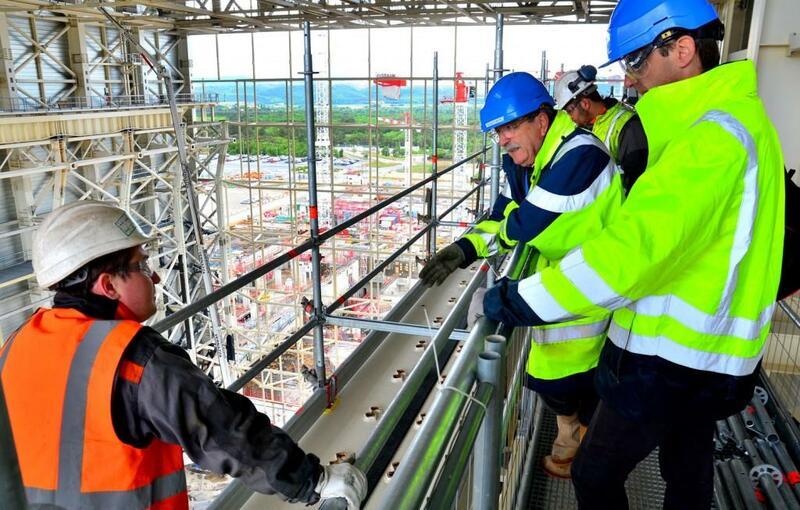 The crane operator, with no direct line of sight to the lifting operations, receives radio instructions from the "rigger," who oversees the whole operation. 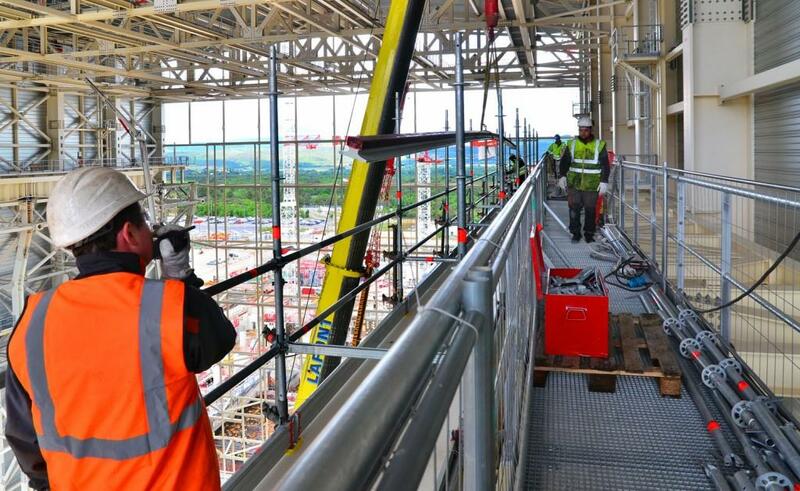 As the girder is lifted toward the overhead rails, 43 metres above the basemat of the Assembly Hall, a bit of pushing and pulling tilts it in the right direction. 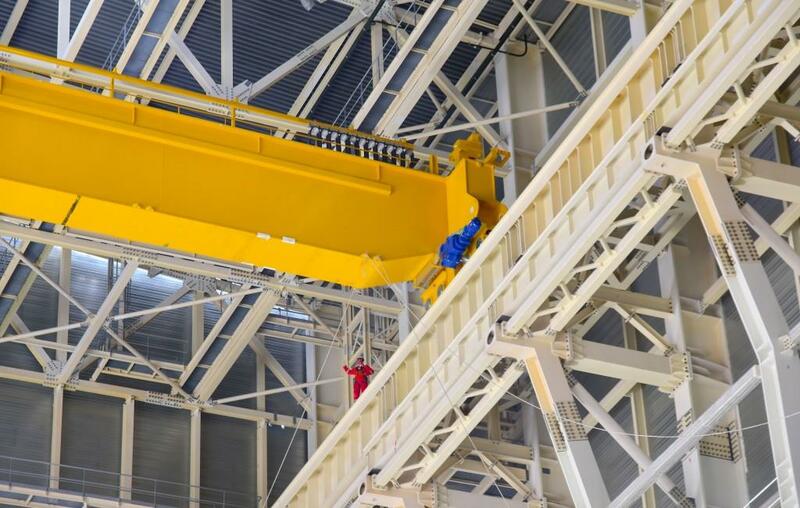 The girders and trolleys of the overhead cranes are delivered to the Assembly Hall in early June. 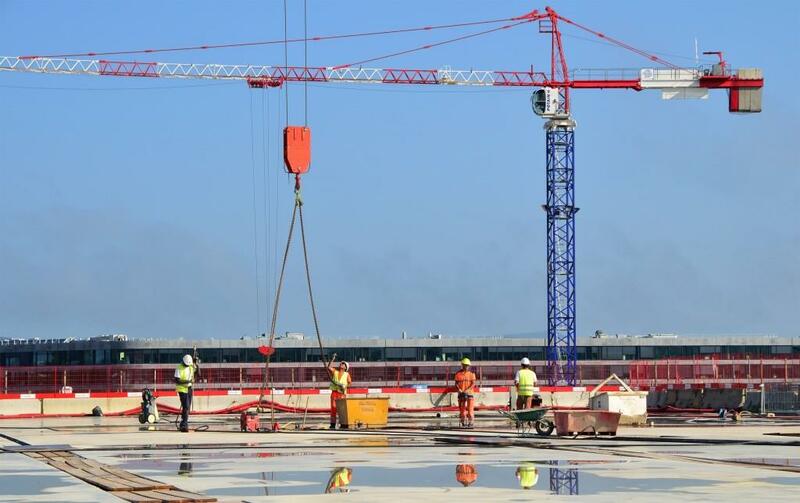 They will be lifted into position by a huge crawler crane operating from outside the building and passing its hook through an opening in the roof. 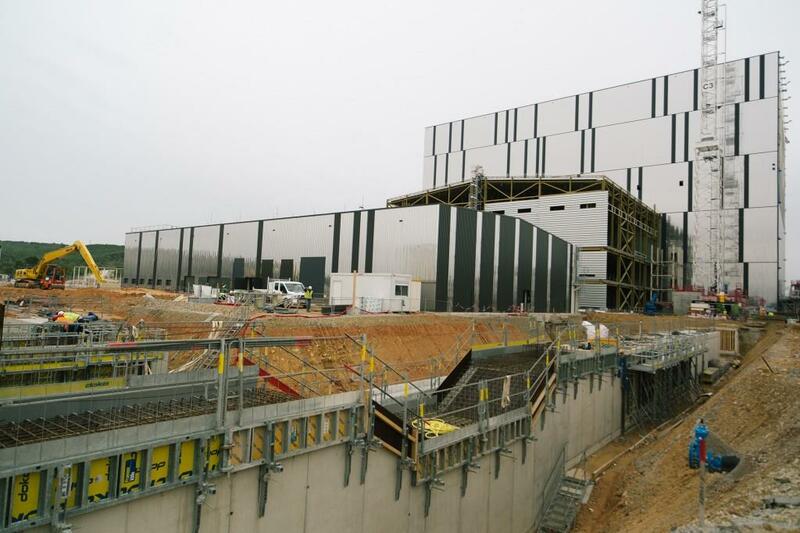 The Tokamak Pit and ITER Headquarters, as seen from the rear of the Assembly Building. 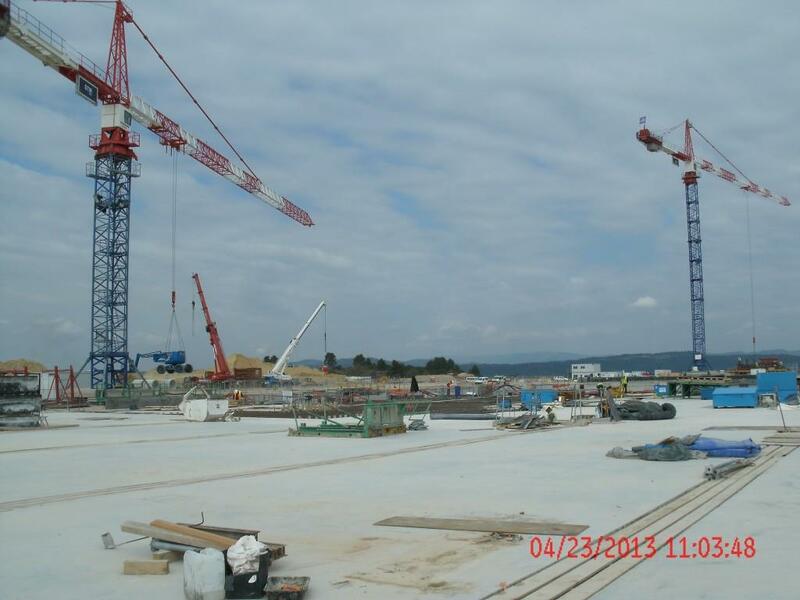 After the lifting operation, the cranes will be able to move along the rails of the Assembly Building (visible here). 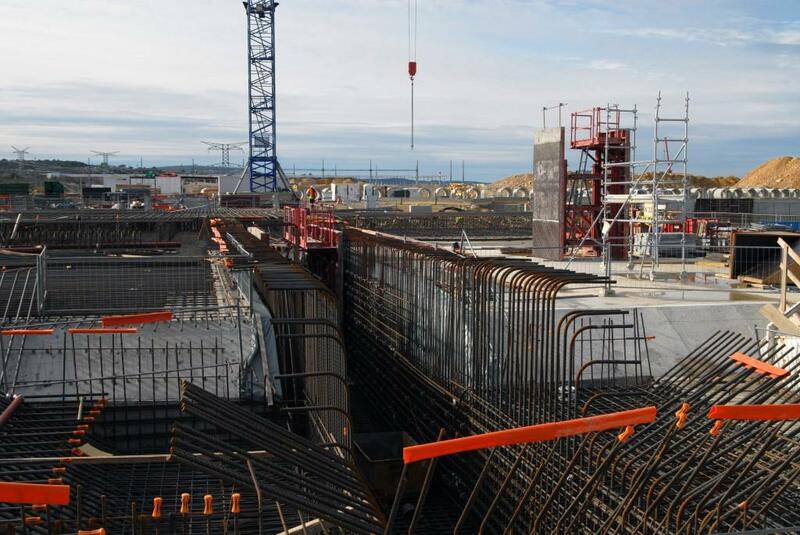 Later, when the Tokamak Building is completed, the rails will be extended over the Tokamak Pit installation area. 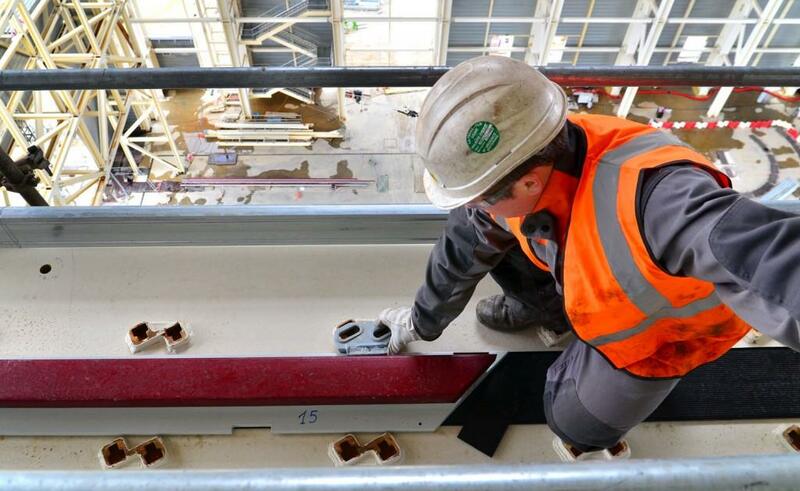 Each rail is fastened with heavy clips to the ledge formed by the railway beams. 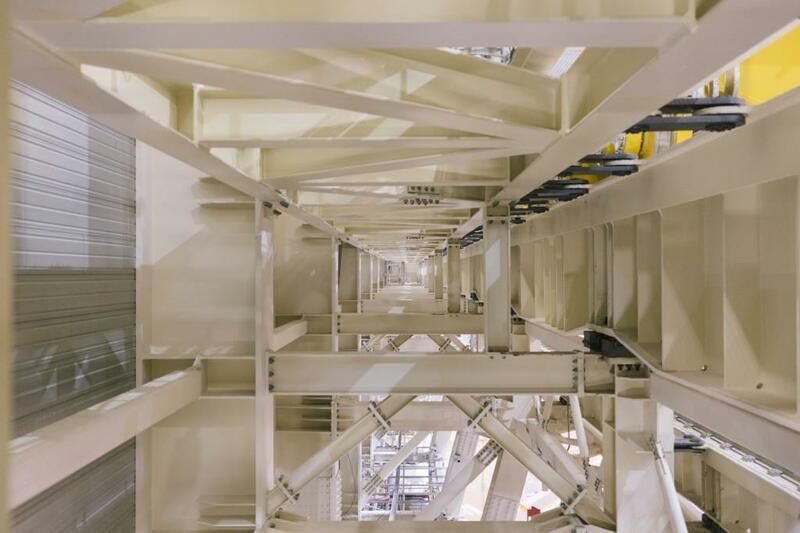 Heading up to the level of the overhead crane rails (15 stories), our photographer shot this picture through the pillars of the Assembly Hall. 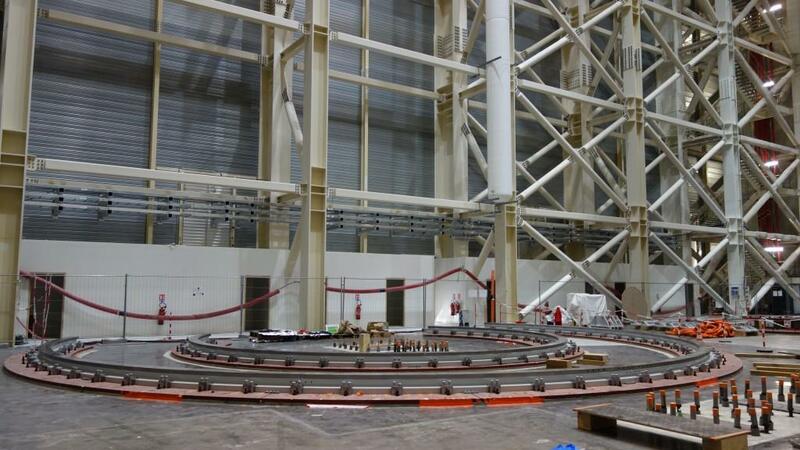 It will take a few weeks to install the rails and fine tune their alignment. 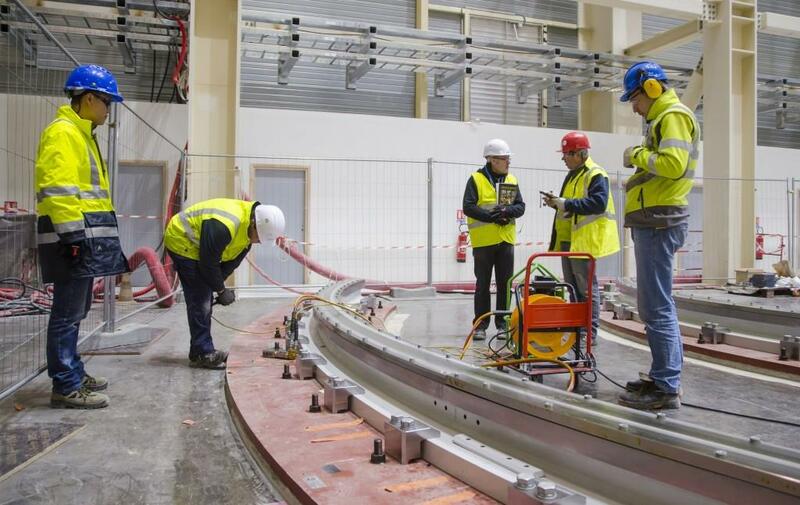 Each rail segment is between 10 and 18 metres long and will rest on beams that run the entire length of the Assembly Building (and, one day, the Tokamak Building). 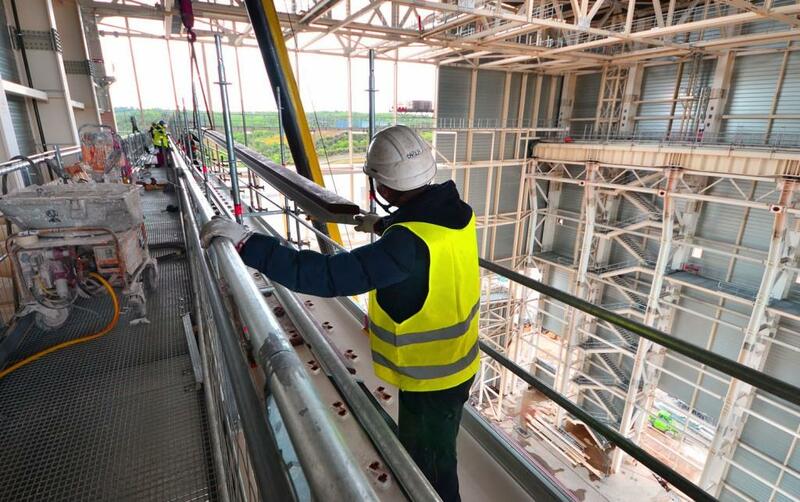 43 metres above the basemat of the Assembly Hall, workers are laying the rails for the lifting system that will handle components weighing up to 1,500 tonnes. 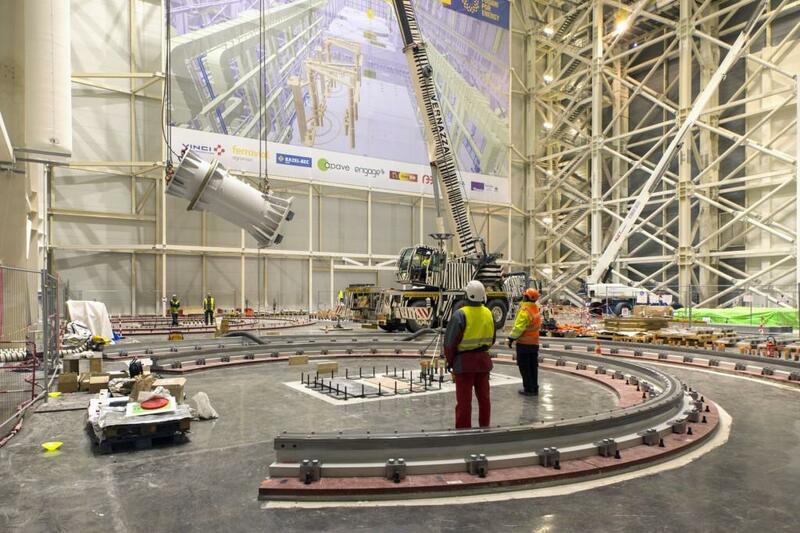 Rails will be set in place for the components of the massive overhead cranes. 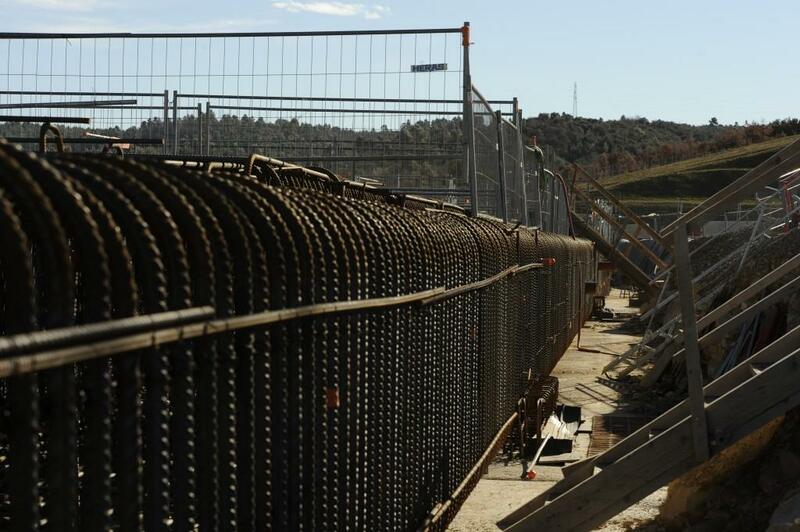 The rails will be 45 metres above the basemat. 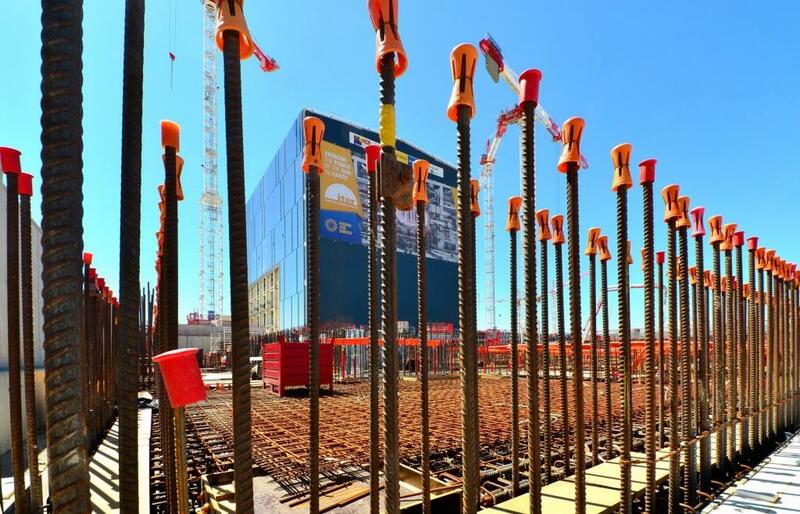 What looks like small Lego bricks are actually barriers protecting the anchor plates for ITER's largest assembly tools—the 800-tonne sub-sector assembly tools. 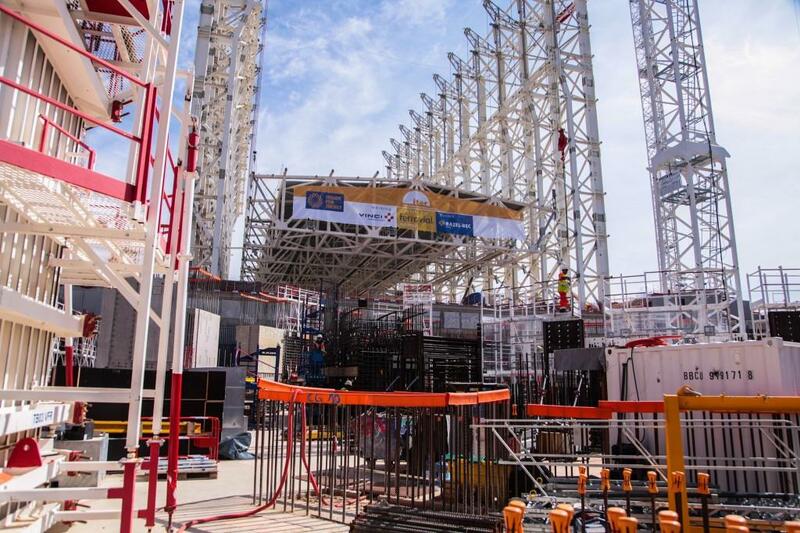 The frame is up for the temporary wall that will be erected between the Assembly Hall and the Tokamak Complex, until construction of the Tokamak Complex is complete. 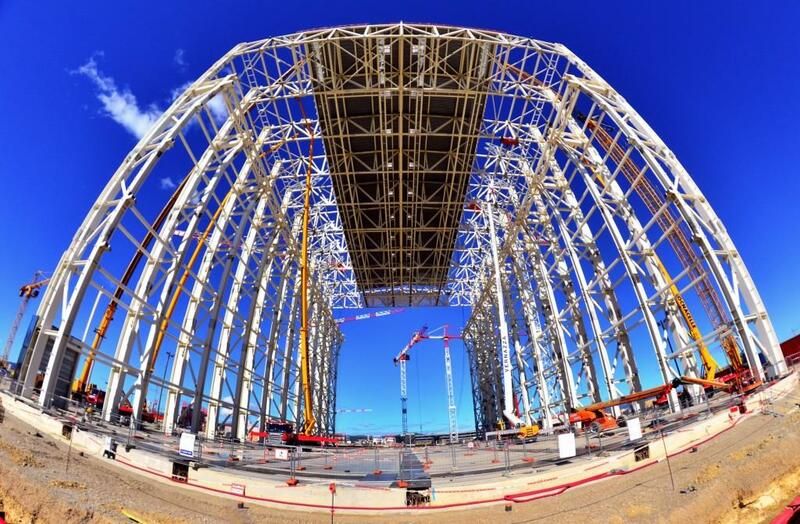 To capture this original view of the 60-metre-tall ITER Assembly Hall, our photographer stretched out flat on his back. 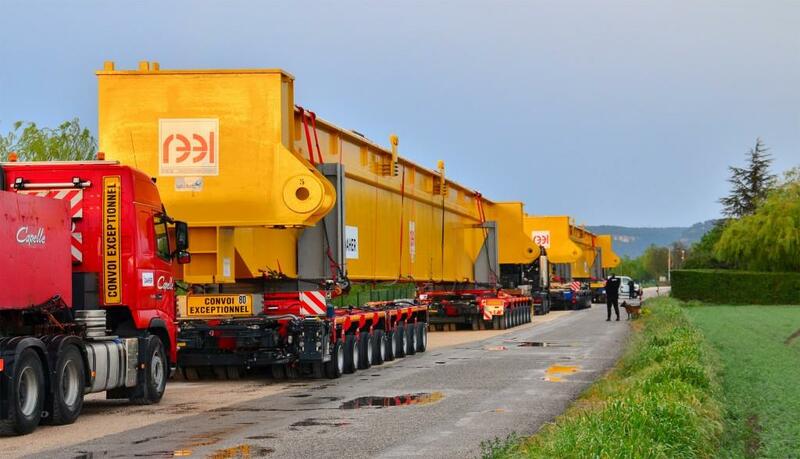 The logistics of bringing two 47-tonne girders along the roads from the Mediterranean Sea to the ITER site takes careful planning. 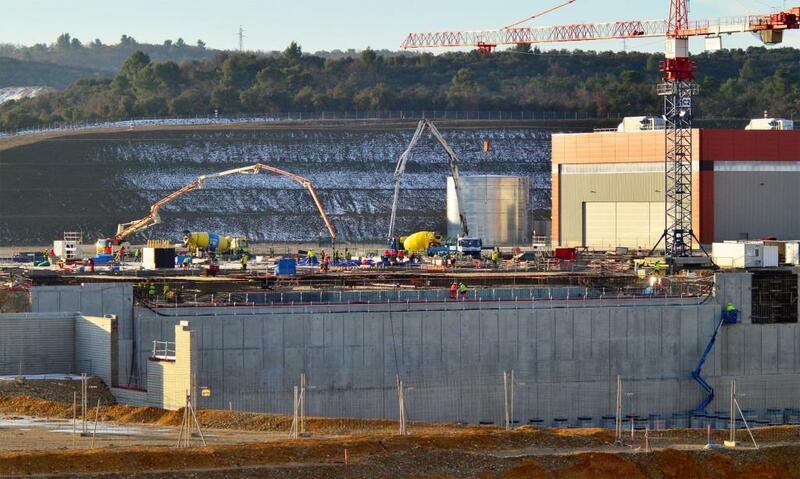 Here, the double convoy is parked near Peyrolles-en-Provence while operators wait for nightfall to conduct the components at 5 km/hour along the last leg of the ITER Itinerary. 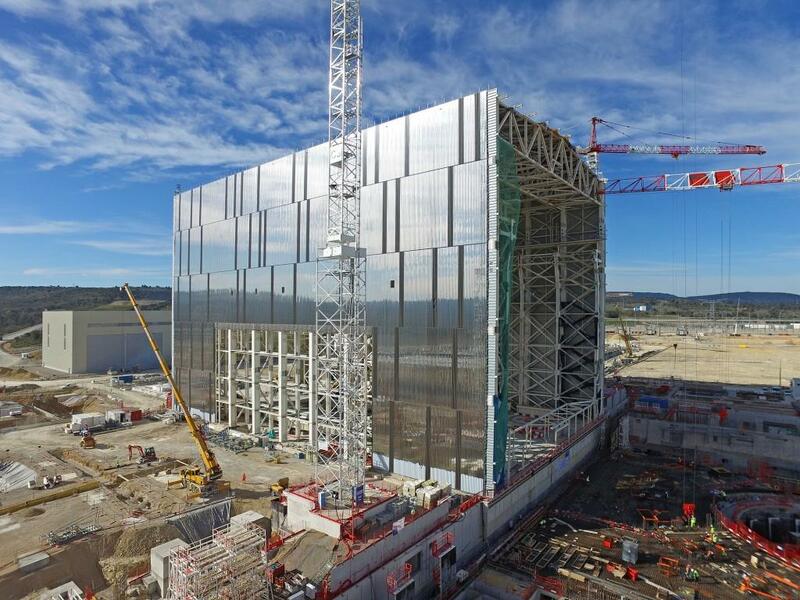 The installation of cladding on the 60-metre-tall ITER Assembly Hall requires specific techniques and safety measures. 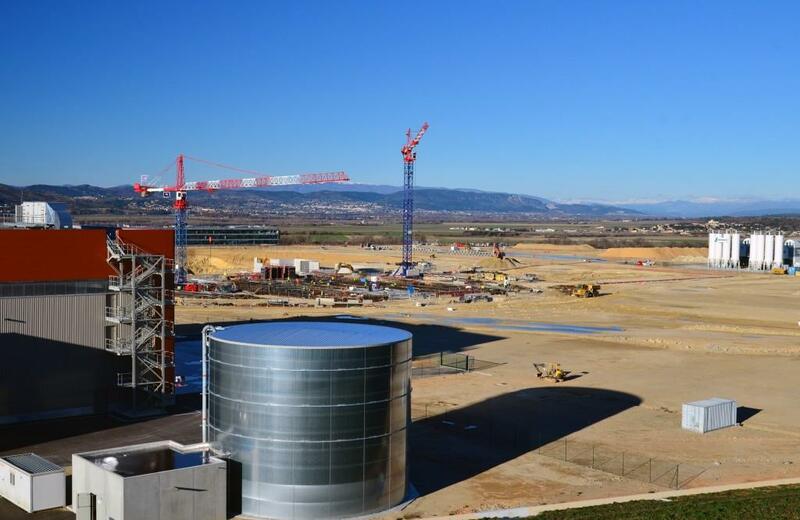 As the reflective cladding advances along the metal structure of the Assembly Building, the colours of a March day in Provence appear. 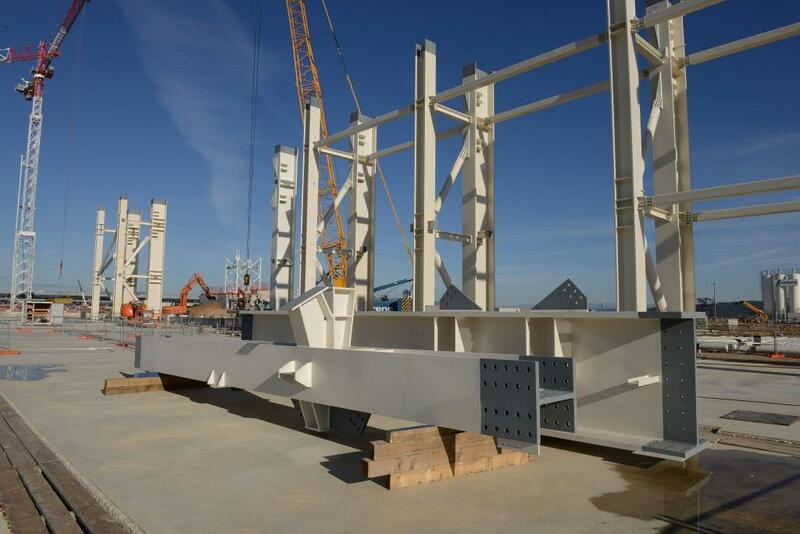 In June this girder, and three others, will be installed on rails inside of the Assembly Building—some 45 metres overhead. 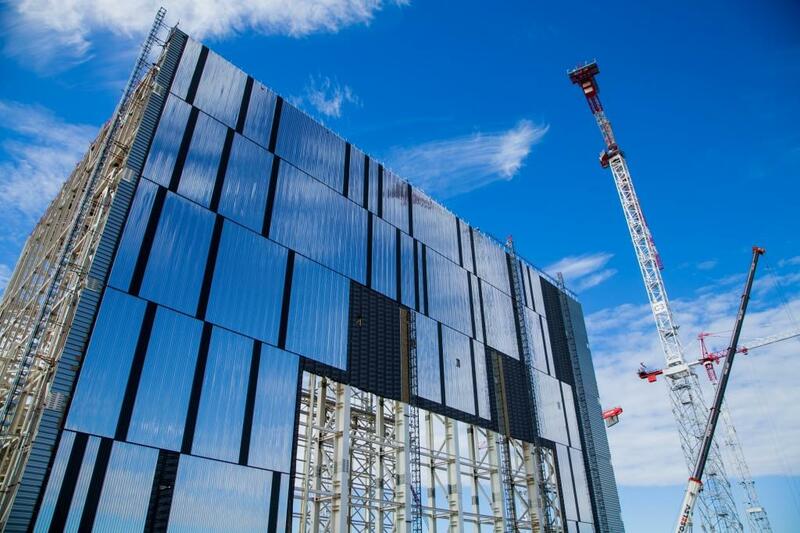 On the northern face of the Assembly Building, work progresses on four layers of cladding. 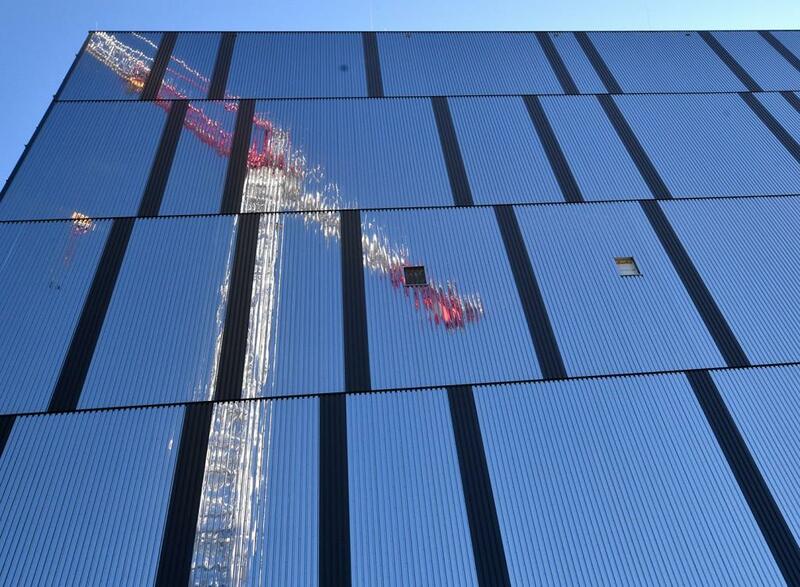 The last layer, in polished steel, will reflect the colour of the sky. 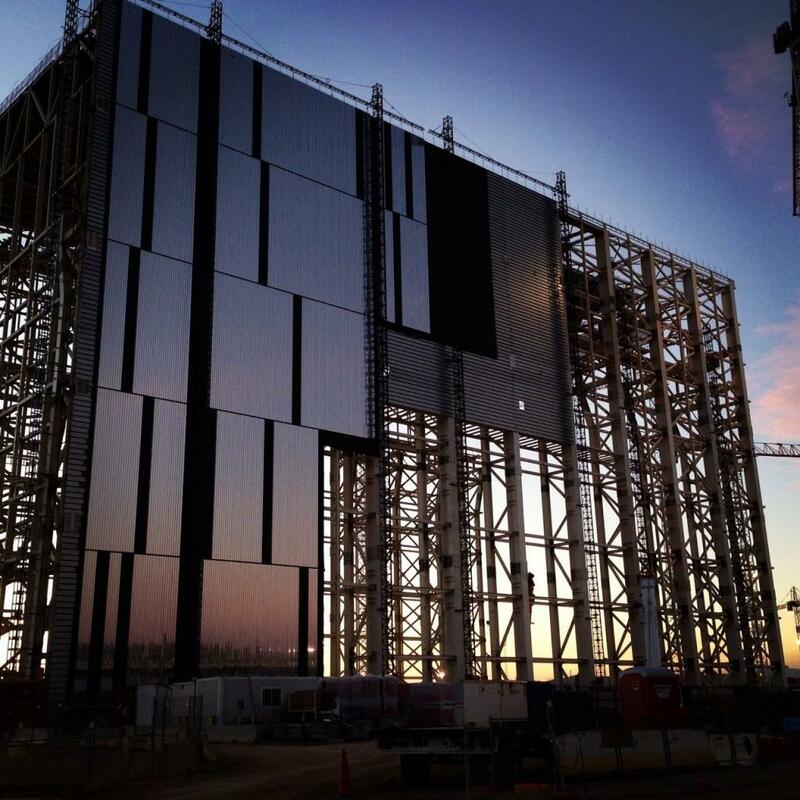 If all goes according to schedule, work on the cladding will end in April. 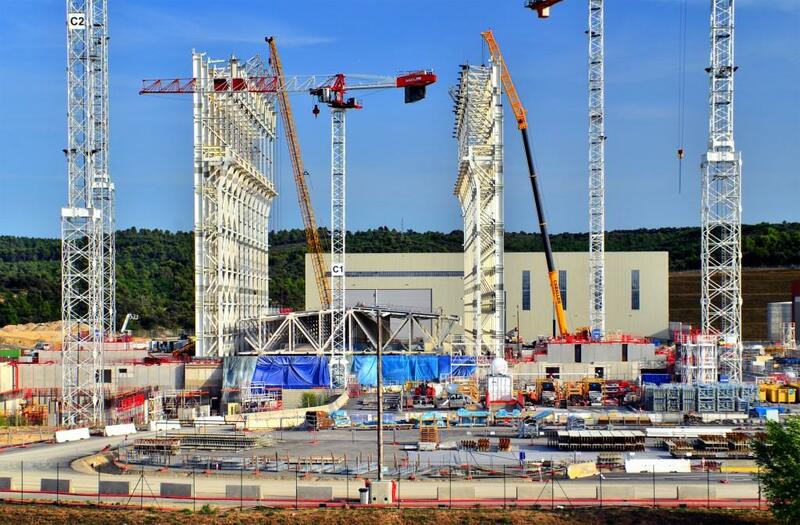 During ITER assembly, a pair of independent bridge cranes will run the entire length of the Tokamak and Assembly buildings, manoeuvring and transporting components. 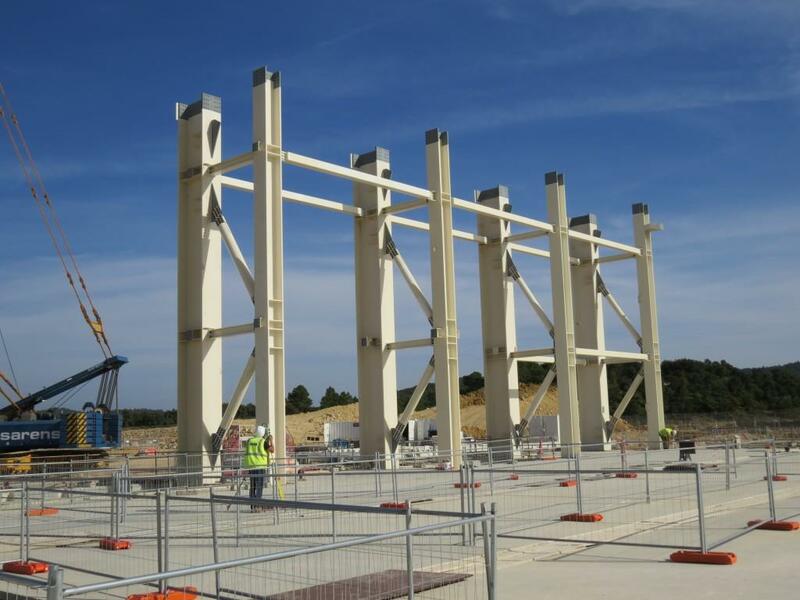 The first beams for the crane bay were lifted into place in January to trial the bolting operations. 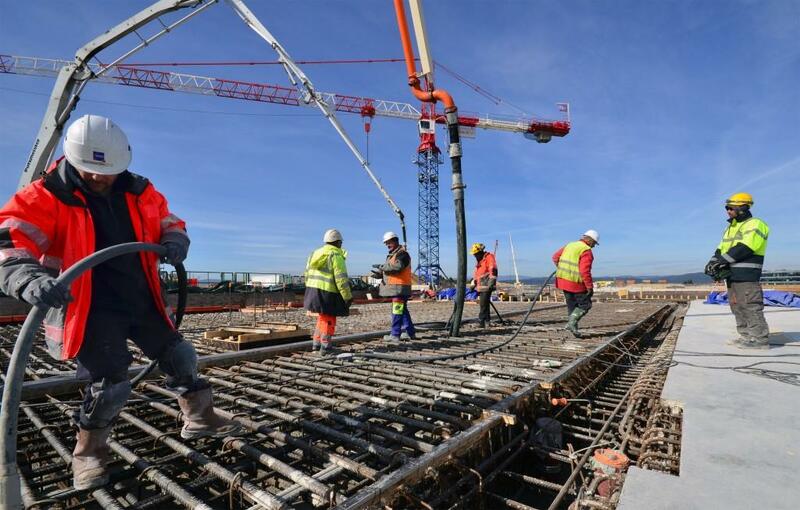 After all the beams are in place, workers will install the rails in time for the arrival of the first bridge crane late in June. 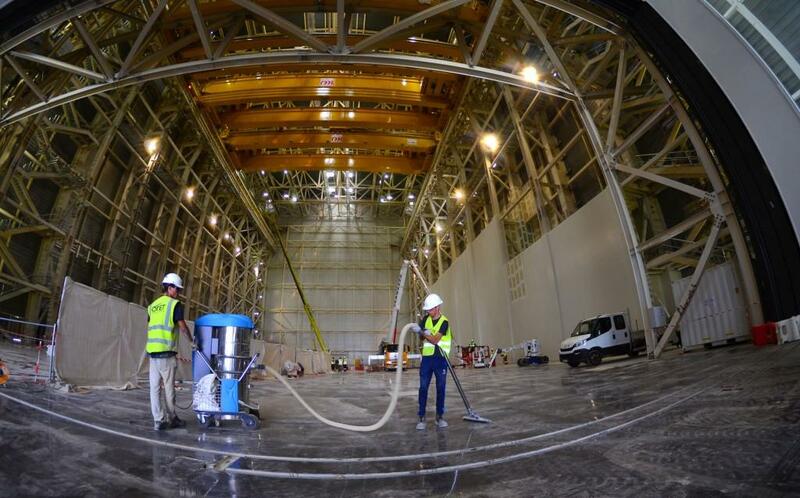 Before they enter into the Assembly Hall ITER components will need to be cleaned using a number of different techniques such as compressed clean air, pressurized demineralized water, and special detergents. 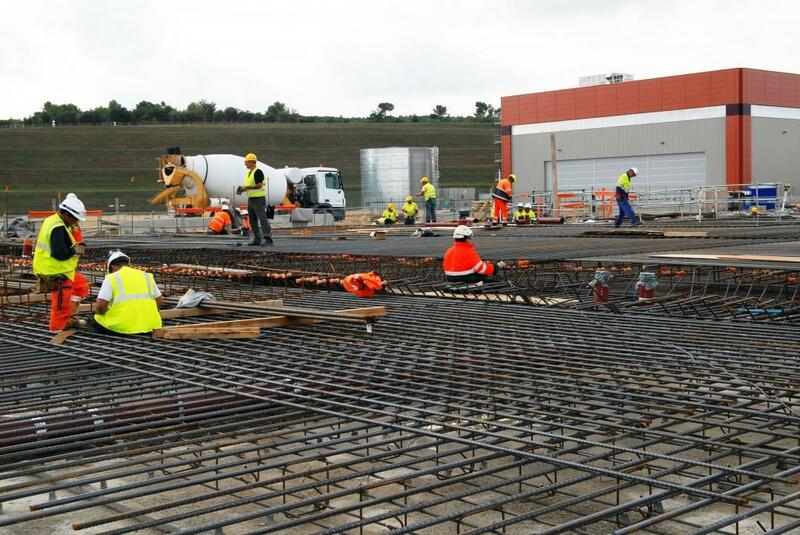 Construction of the Cleaning Facility is underway on the south side of the building. 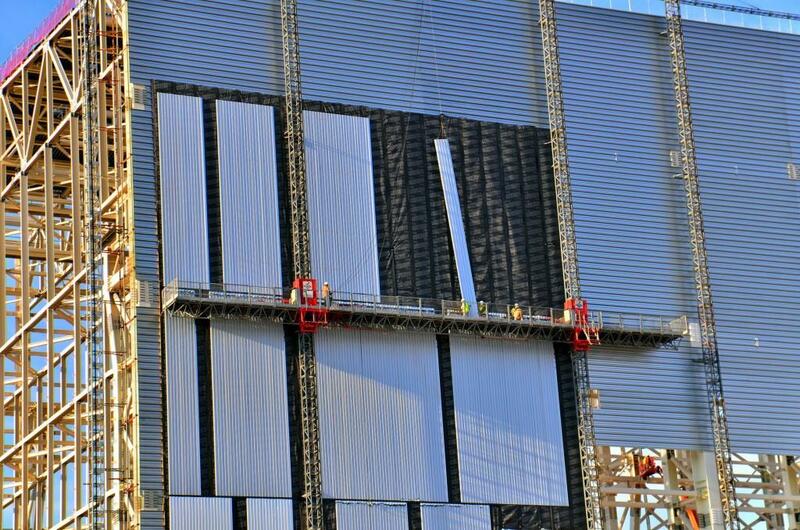 Four layers of the cladding will eventually cover the Assembly Hall, including an insulating layer. 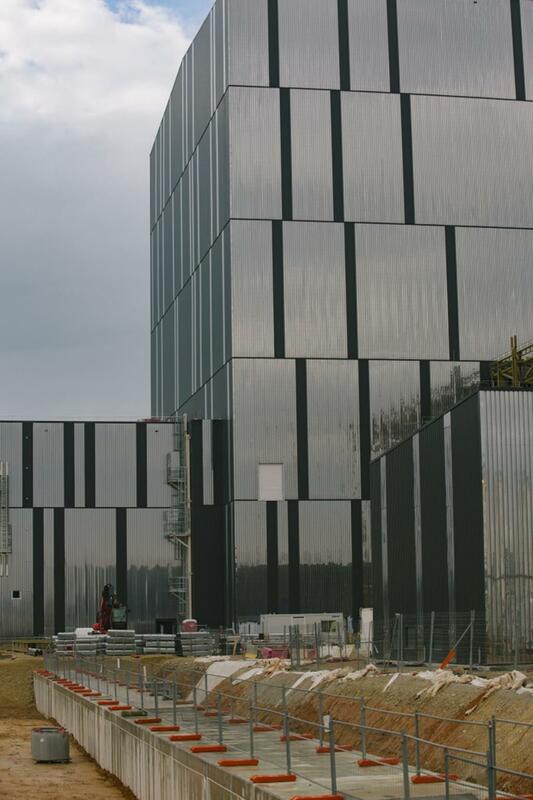 The outermost panes will be mirror-like, to reflect the sky and surroundings. 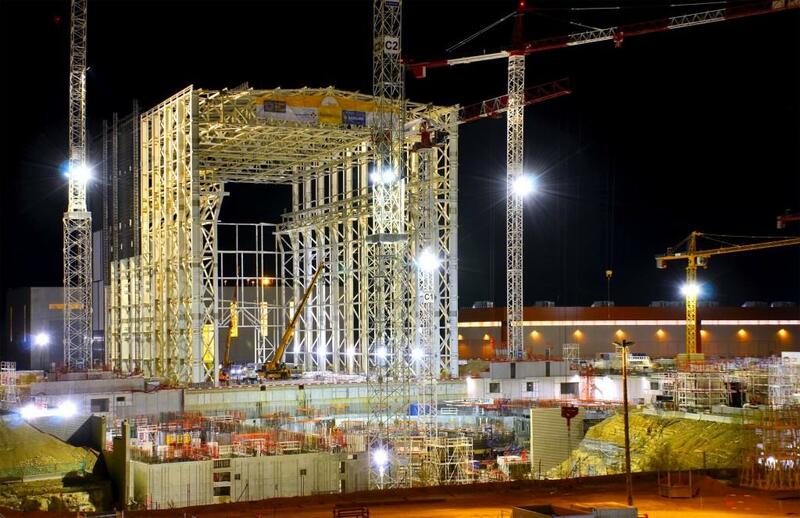 The 6:00 p.m. to 5:00 a.m. night shift is at work on the far side of the Assembly Hall, bolting together the steel lattice that will support the metal cladding. 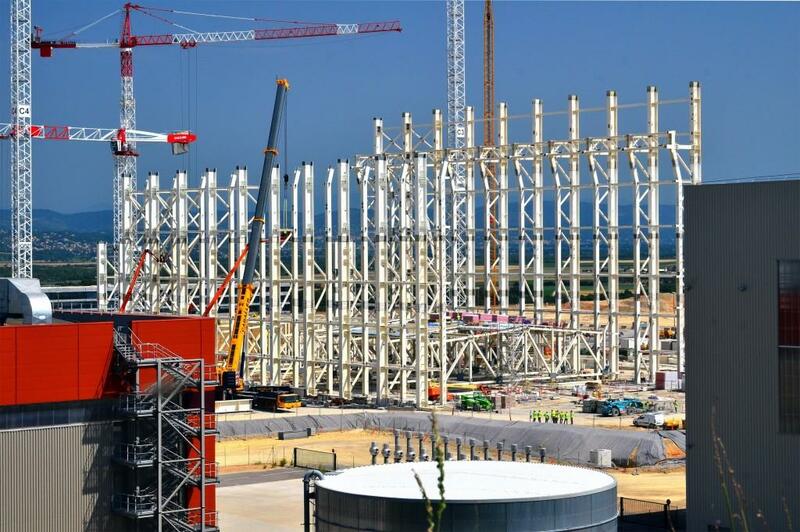 60 metres tall, 97 metres long, 60 metres wide. 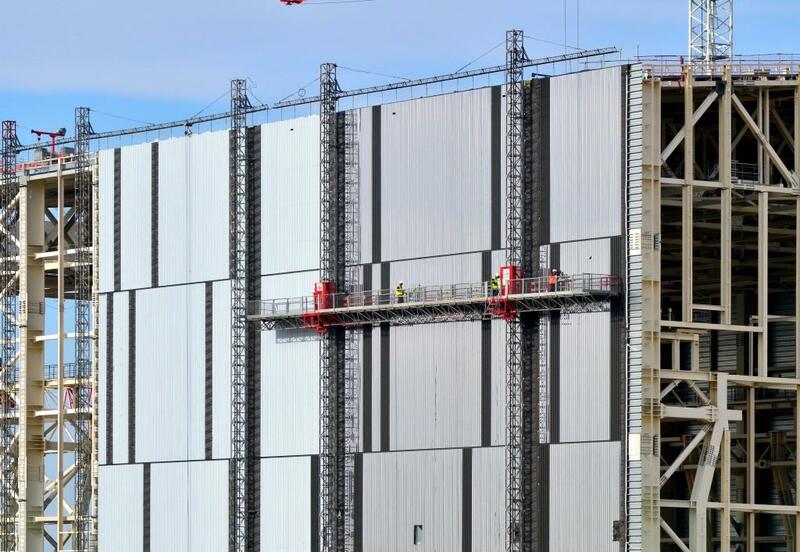 There are 14,000 square metres of surface to cover with cladding. 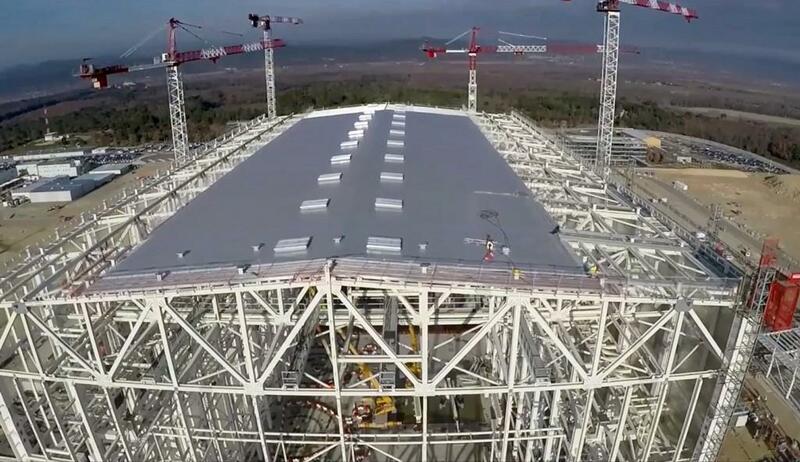 A drone shot of the Assembly Building roof structure. 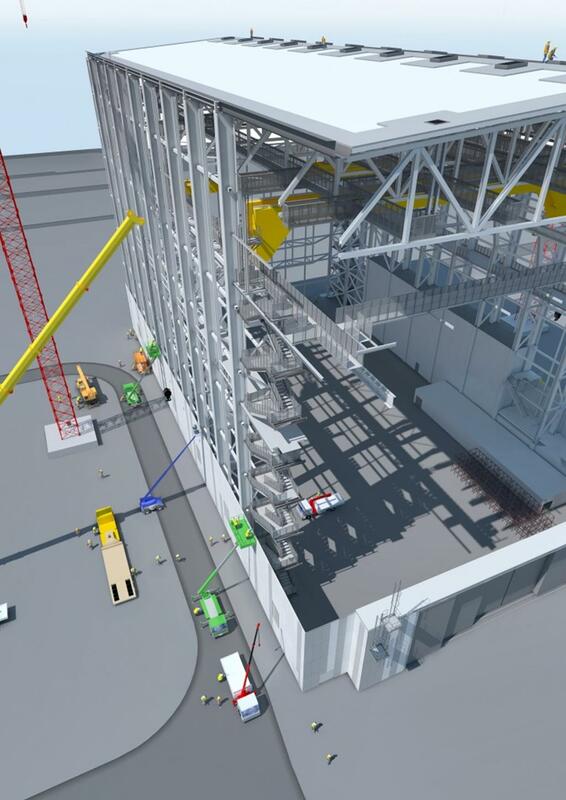 In order to install the heavy-lift cranes inside the building, part of the roof will be opened to allow a lift cable—from a tall crane outside of the building—to be lowered within. 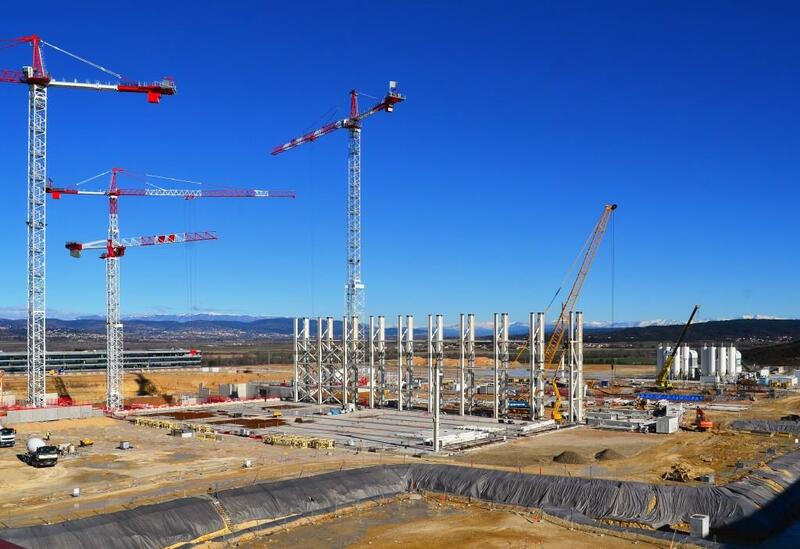 A giant, 22-legged arachnid seems to have taken up residence on the ITER site ... 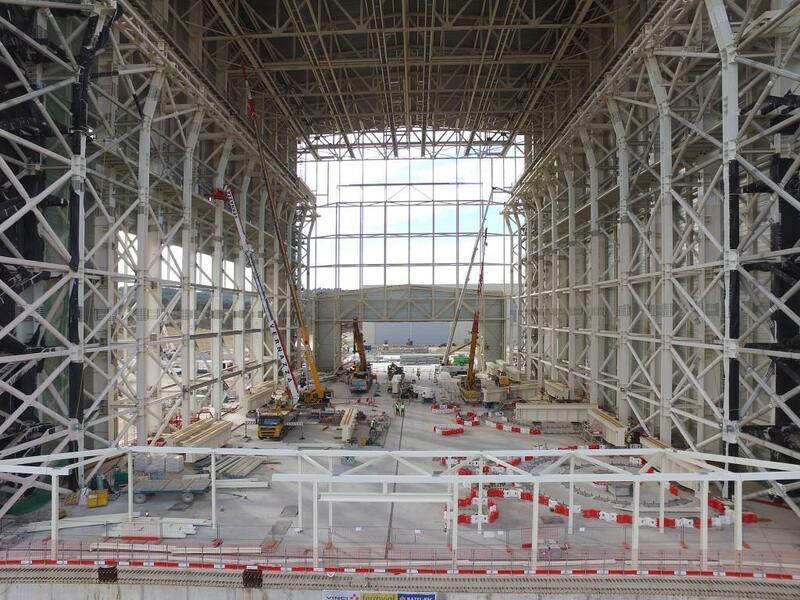 Following the roof lifting operation on 11 September, the temporary structures that held the hydraulic jacks have been removed and workers have nearly finished tightening 3,000 connexion bolts. 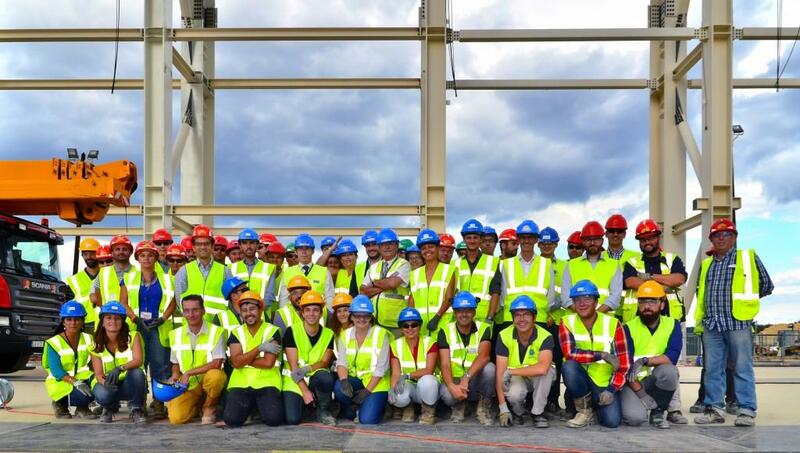 Posing for a group picture under the Assembly Hall roof are staff members from the Buildings, Infrastructure and Power Supplies (BIPS) Project Team, architect-engineer Engage, APAVE (safety specialists), Martifer (steel structure assembly), and VSL (heavy lifting). 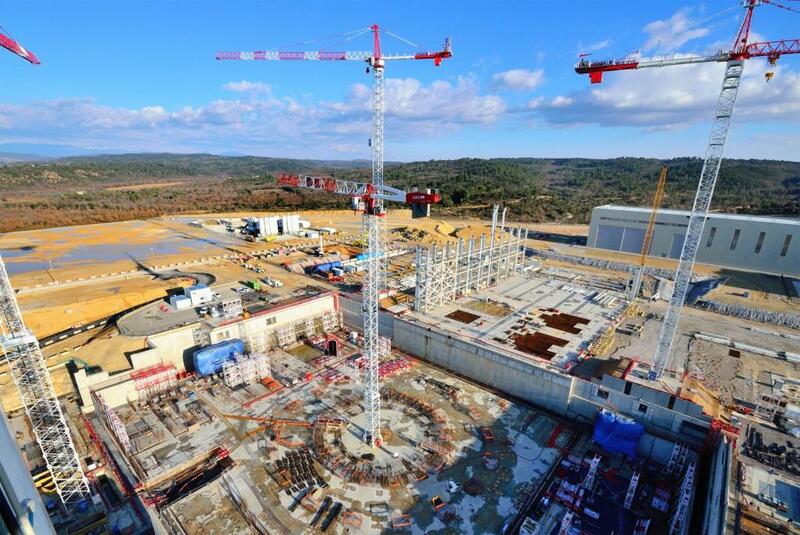 On 11 September 2015, Director-General Bernard Bigot underlines the importance of the latest milestone achieved on the worksite: "Here, in this antechamber to the Tokamak Complex, the principal elements of the machine with be fitted out and preassembled. 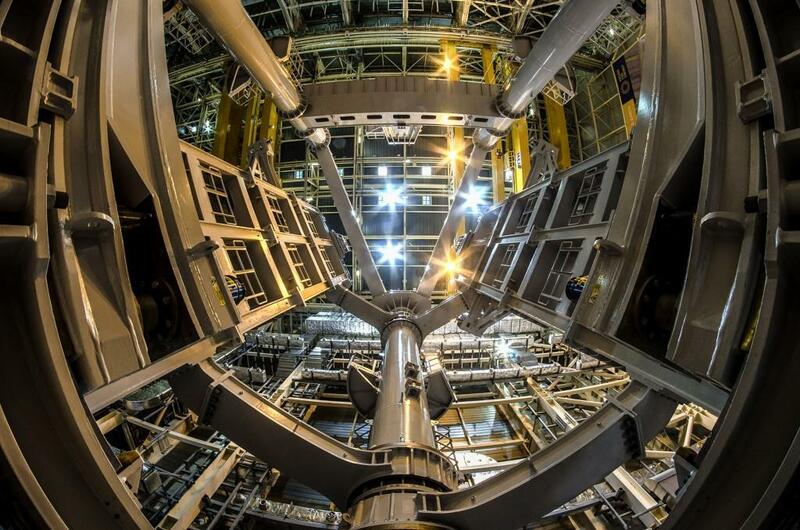 Without this building, there would be no assembly, and without assembly there would be no machine and no project." 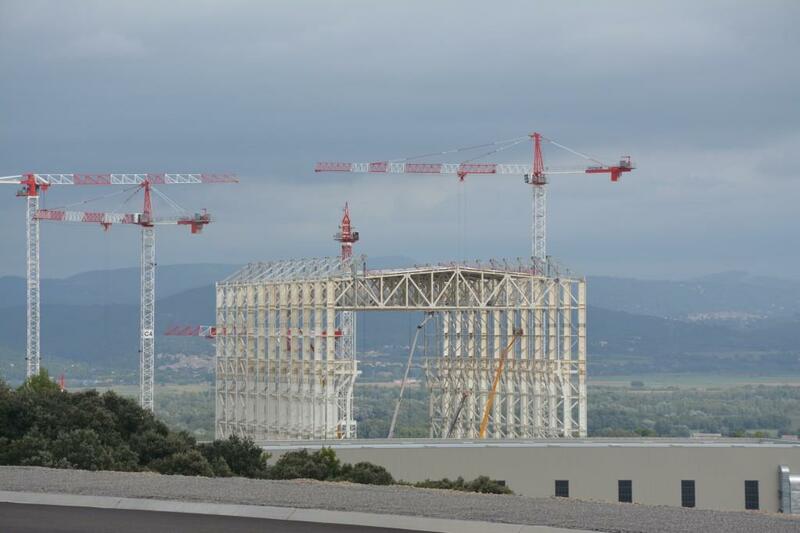 The roof segment of the ITER Assembly Building is successfully raised to its final position in September. 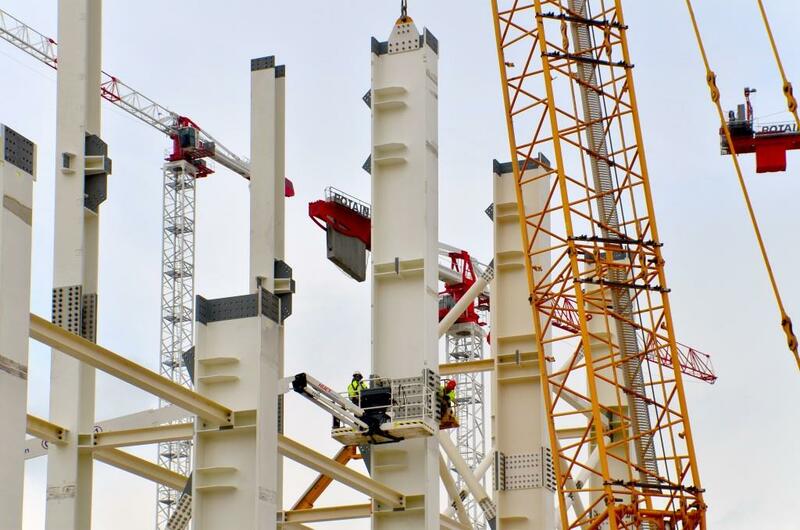 Held in place by temporary jacks following a 14-hour lift operation, the 730-tonne metal structure will be secured to the side pillars in the weeks to come. 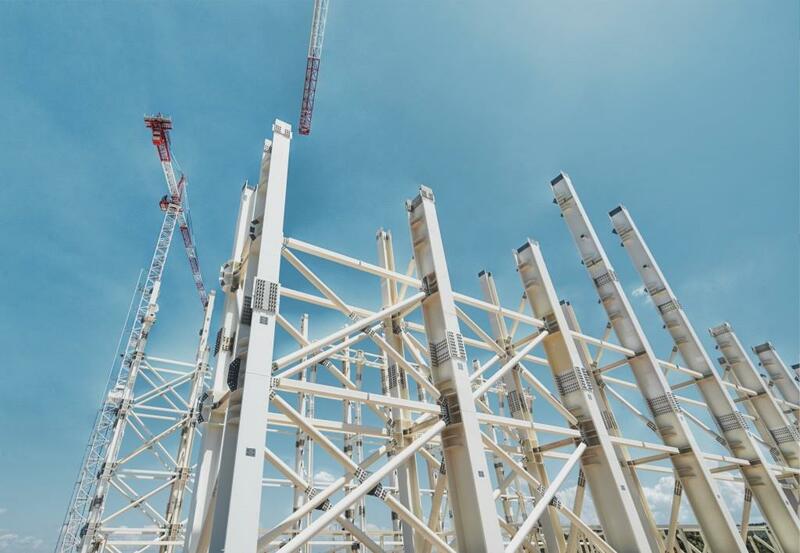 When the roof structure is fully secured to the side columns, the temporary structures put in place for the lift cables (top) will be dismantled. 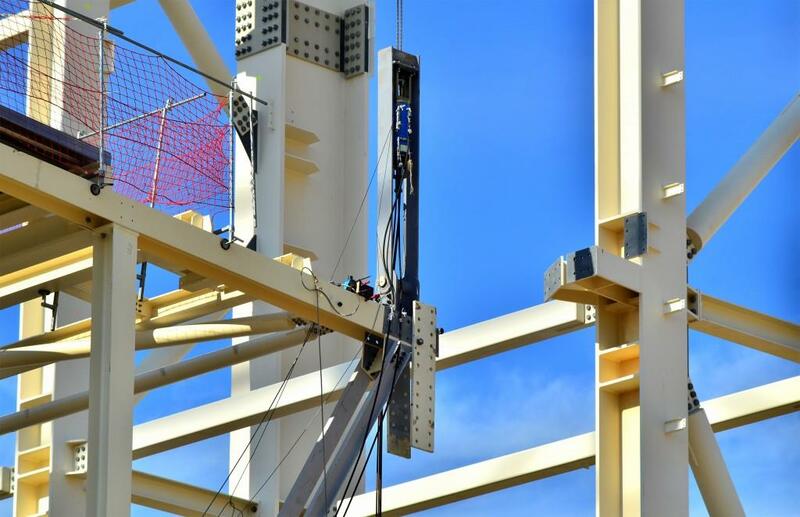 Over the course of 14 hours, 22 hydraulic jacks hoisted the huge structure along thick steel cables that hung from support structures that had been temporarily fixed to the top of the pillars. 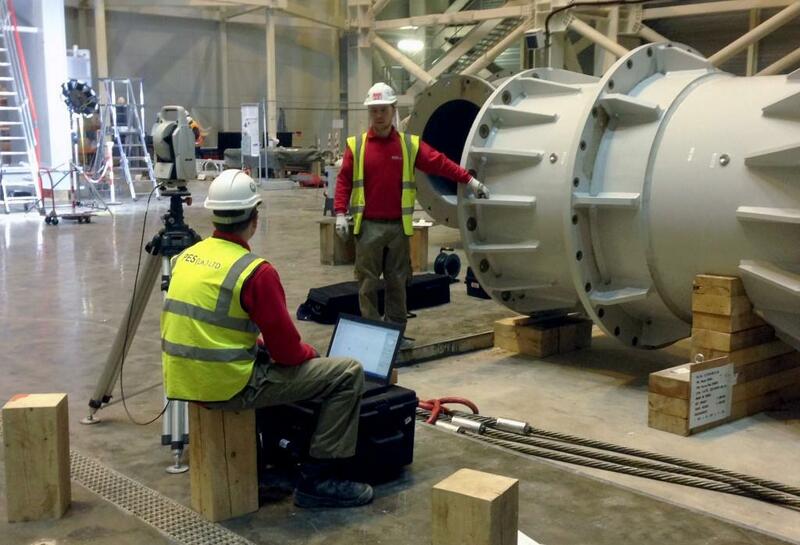 Laser metrology is used to verify the position of the structure as it is lifted. 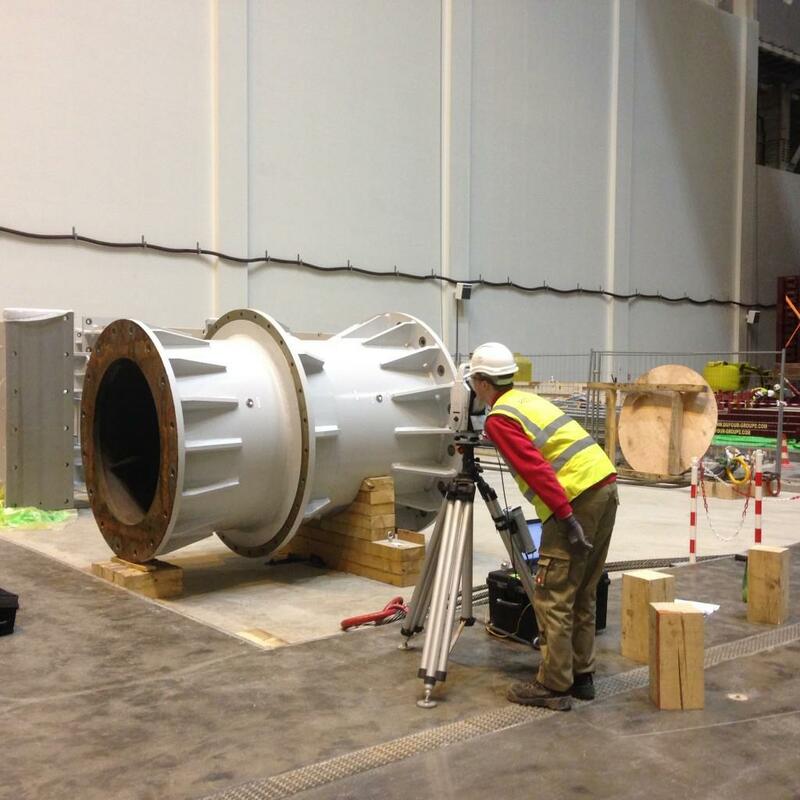 Tolerances of only 35 mm from highest to lowest point are permitted. 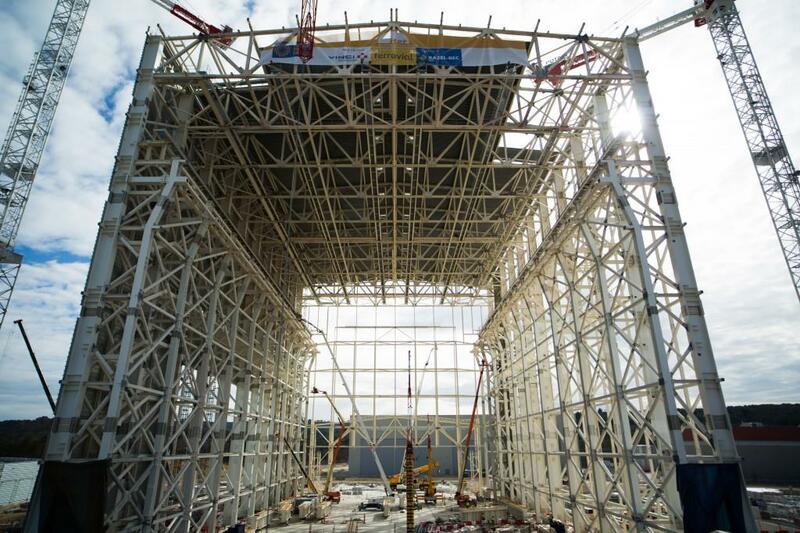 The structure is first lifted 20 cm and left to hang in order to measure the deflection of the steel and check the hydraulic pressure of the jacks. 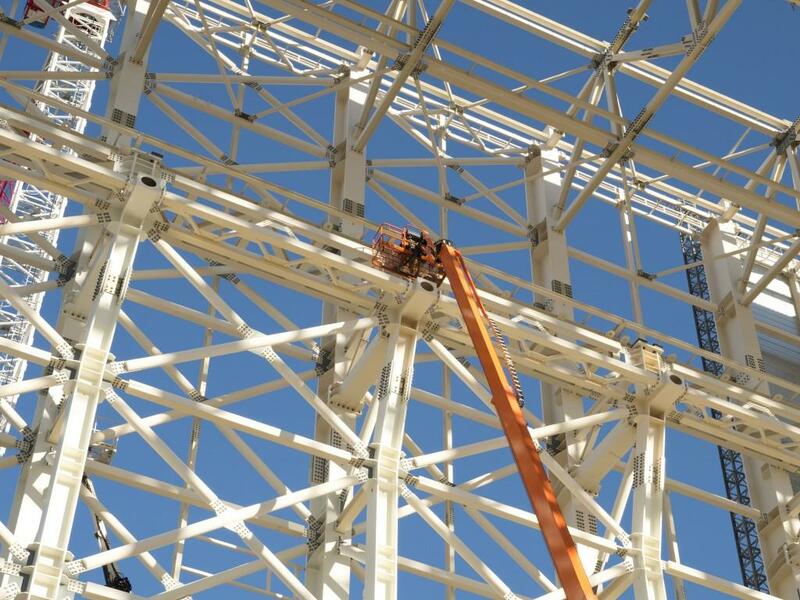 Then, the structure is lifted at approximately 5 km/hour. 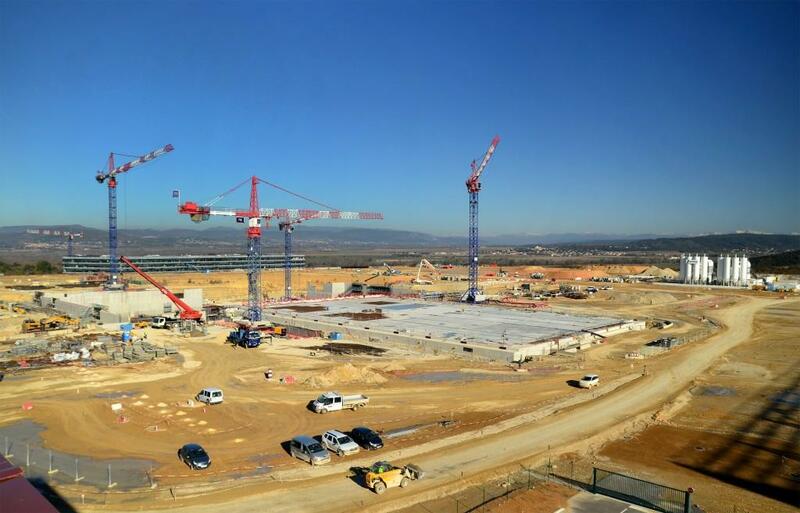 In a 15-hour operation that began on 10 September, the 800-tonne roof structure for the Assembly Building is being slowly lifted to its final position at 50 metres above the basemat. 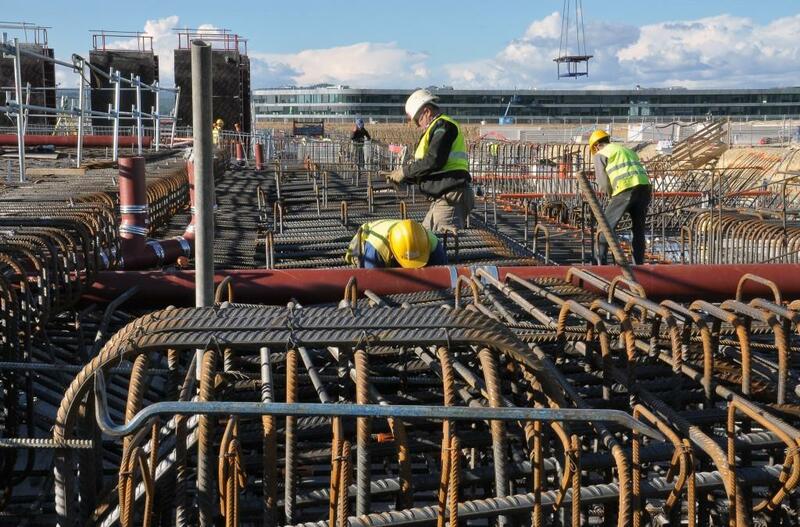 A ceremony is planned to mark the end of the construction milestone on 11 September. 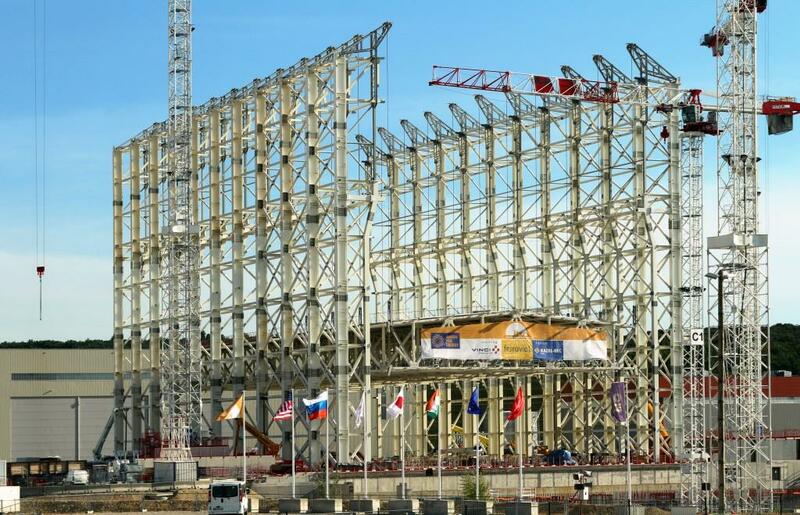 The southern side of the structure will soon be completed. 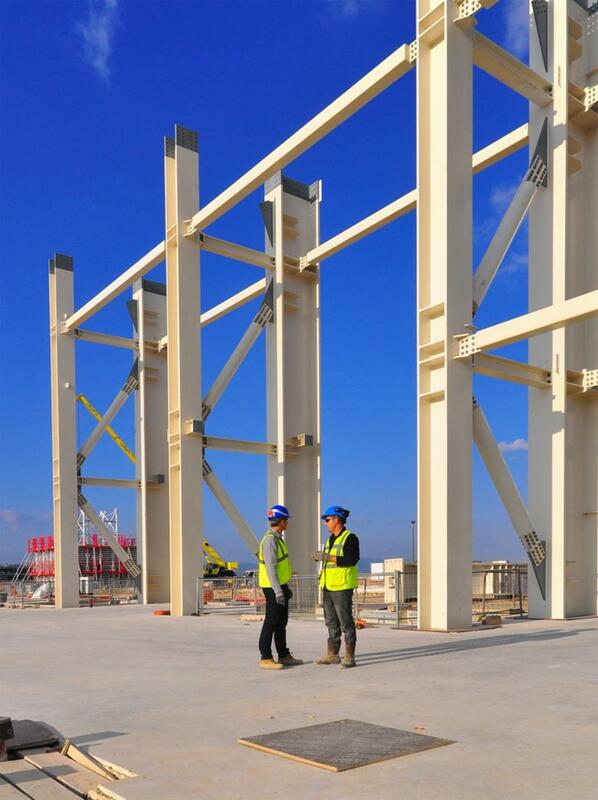 When that happens, the roof beams will be lifted into place. 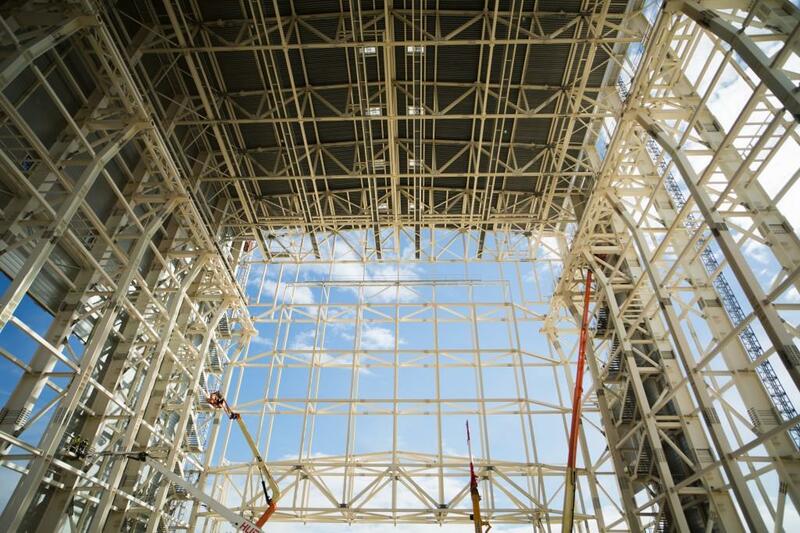 Over 200 individual beams—and 85,000 bolts—make up the metal structure of the Assembly Building. 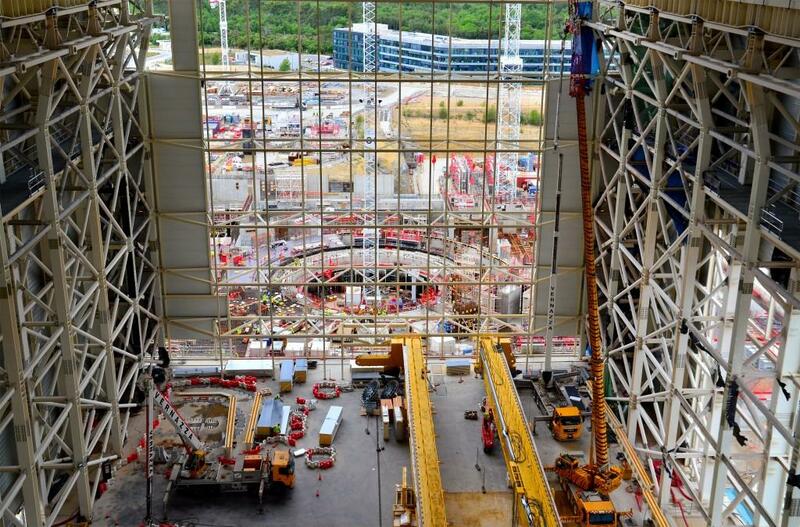 The structure of the Assembly Building, seen from the Tokamak Pit, is truly impressive. 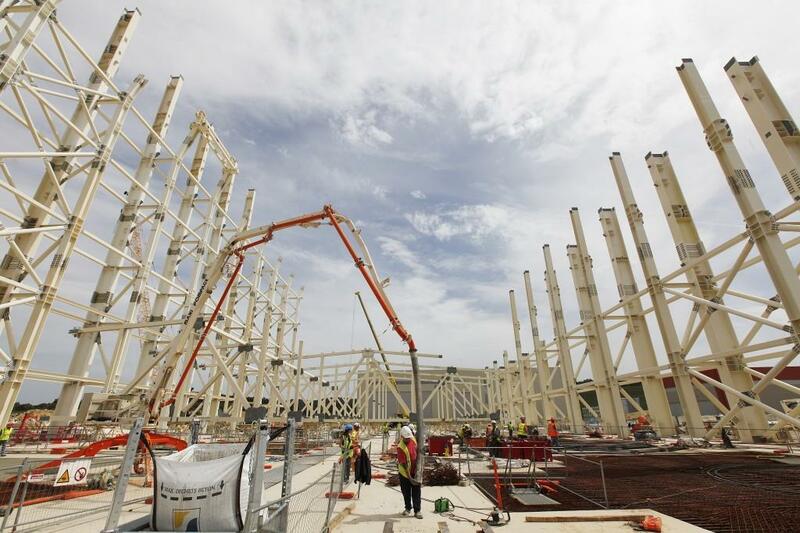 As the pillars of the Assembly Building rise, work is underway in parallel to assemble the roof structure. 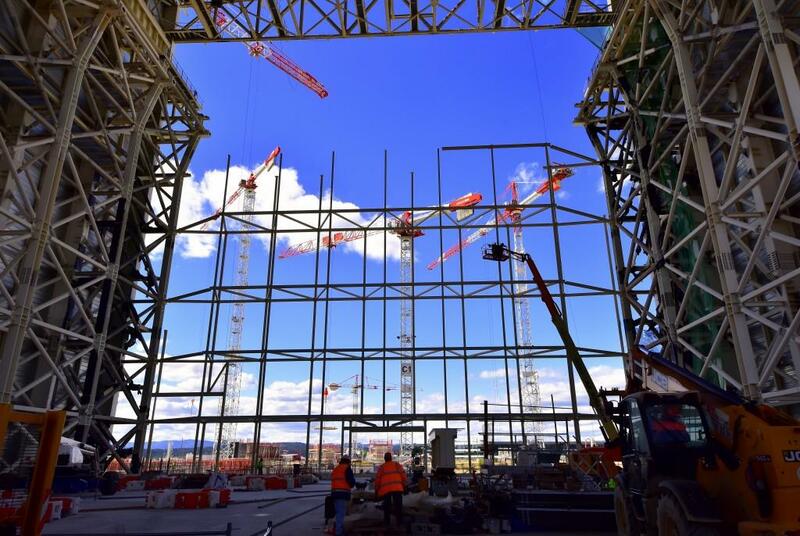 In August, the roof assembly will be lifted in one piece by way of hydraulic jacks and cables. 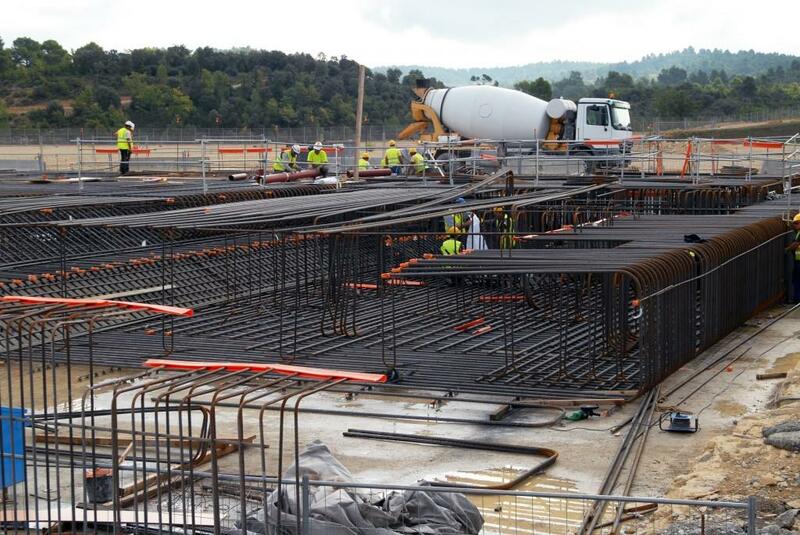 On the north side of the Assembly Building basemat, four vertical pillar segments out of five are in place (appr. 48 m). 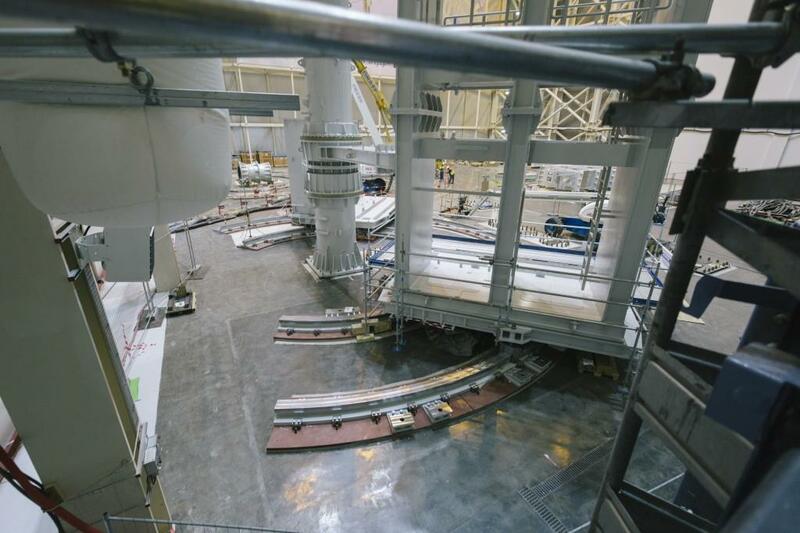 Visible in the picture: the metal balcony that will support rails for the overhead assembly cranes. 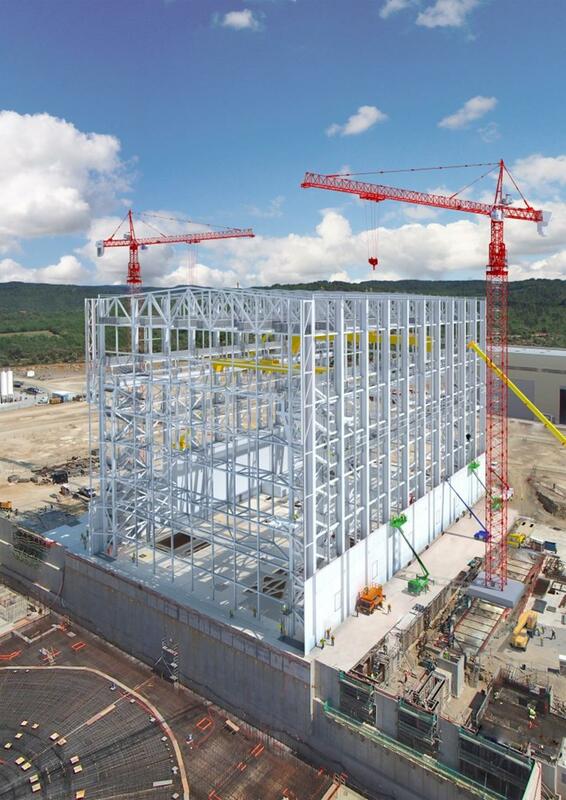 When completed, the Assembly Building will stand 60 metres tall (nearly 200 feet). 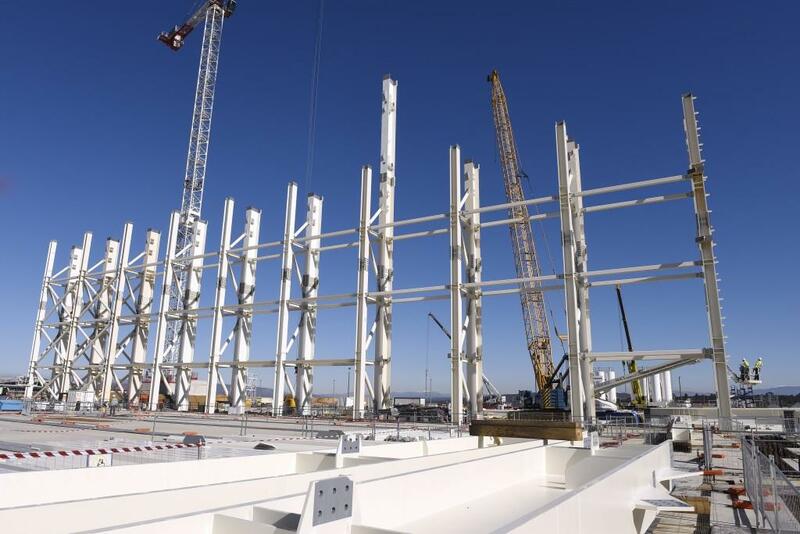 As the fourth level columns are installed (bringing the structure to 48 metres), work has started on the ground to assemble the structure of the roof, which will be lifted and set into place in one piece. 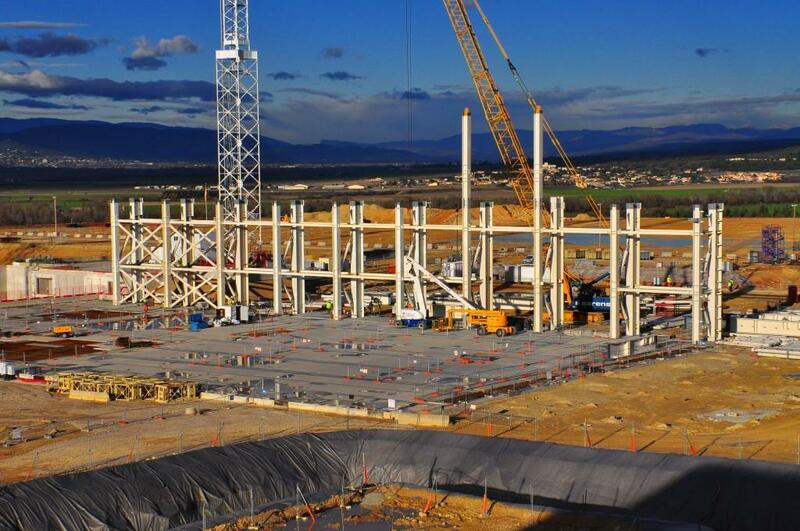 The Assembly Building construction project, on a clear day in April. 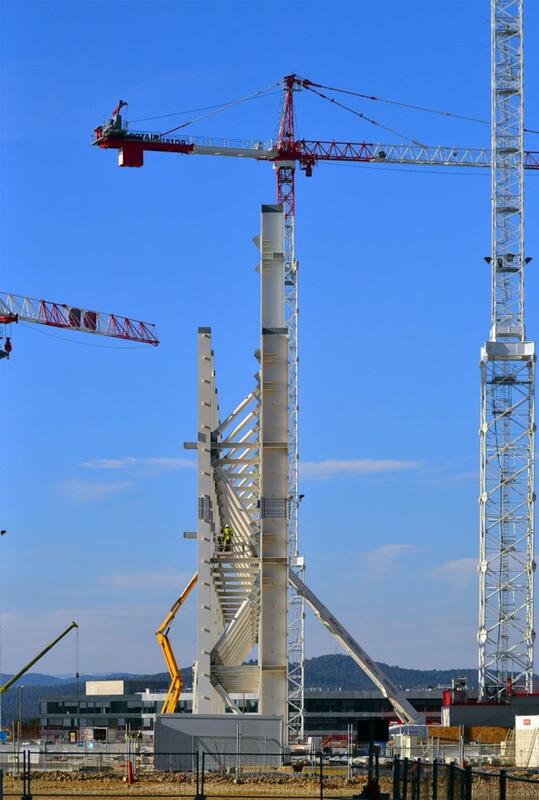 The first third-level pillar is up, and the metal structure of the building is now 36 metres tall. 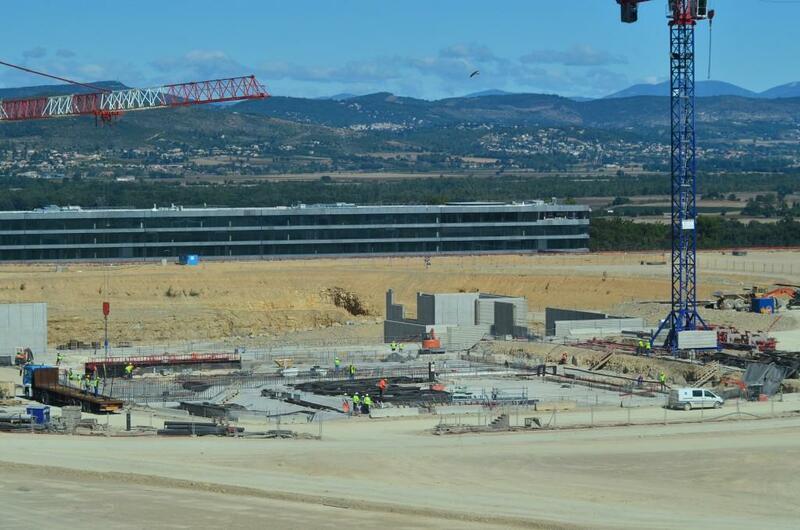 See the building from above! 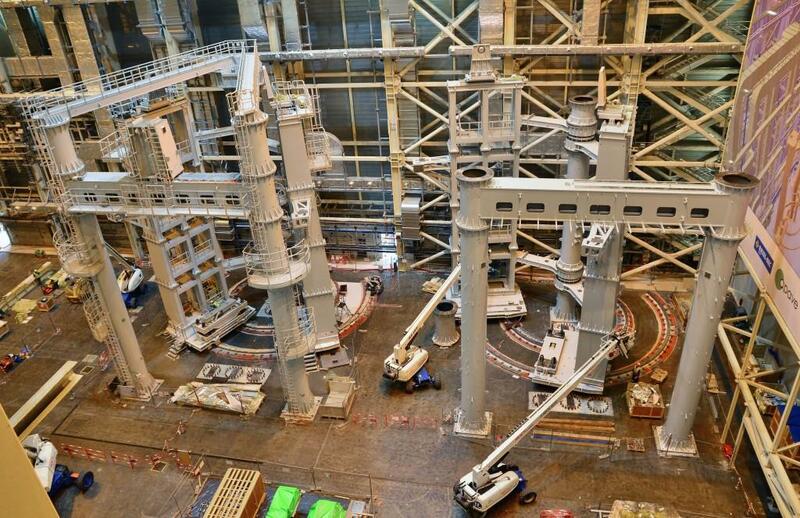 Progress on the Assembly Building pillars is easily measured from above. 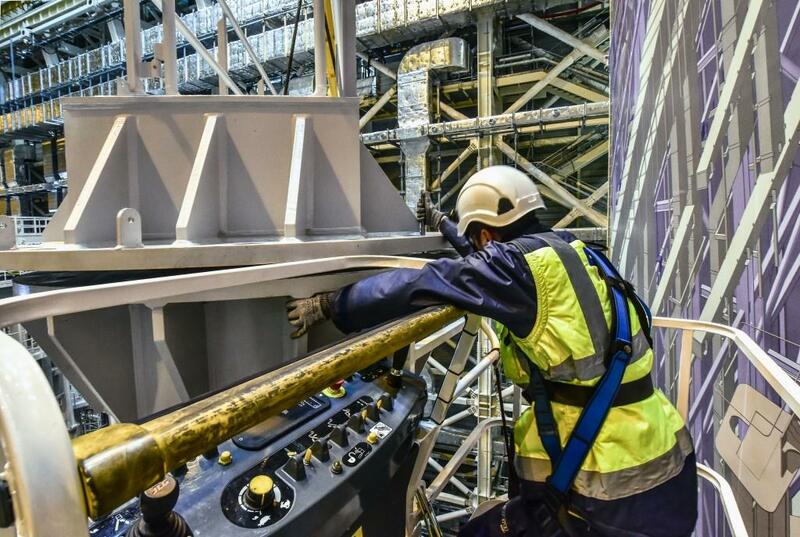 For each pillar assembly, a two-person team manually tightens the bolts on columns weighing 23 tonnes (exterior) or 11 tonnes (interior). 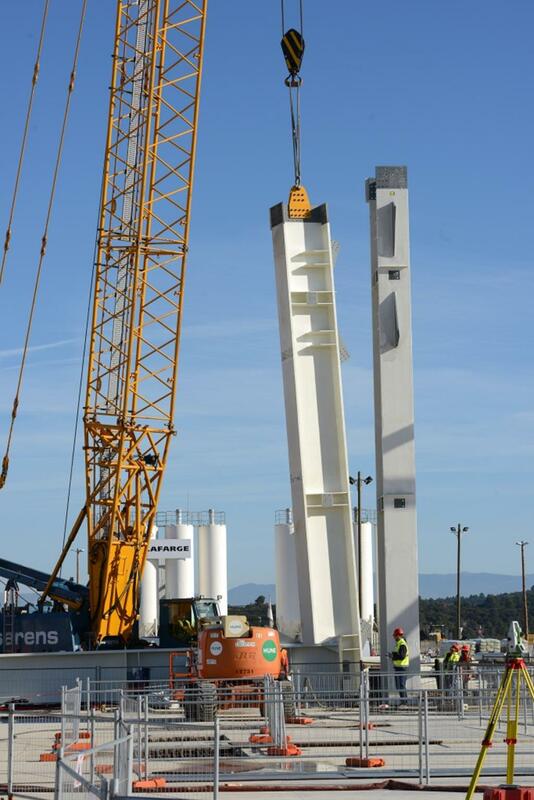 The first pillar is in place on the opposite of the Assembly Building basemat. 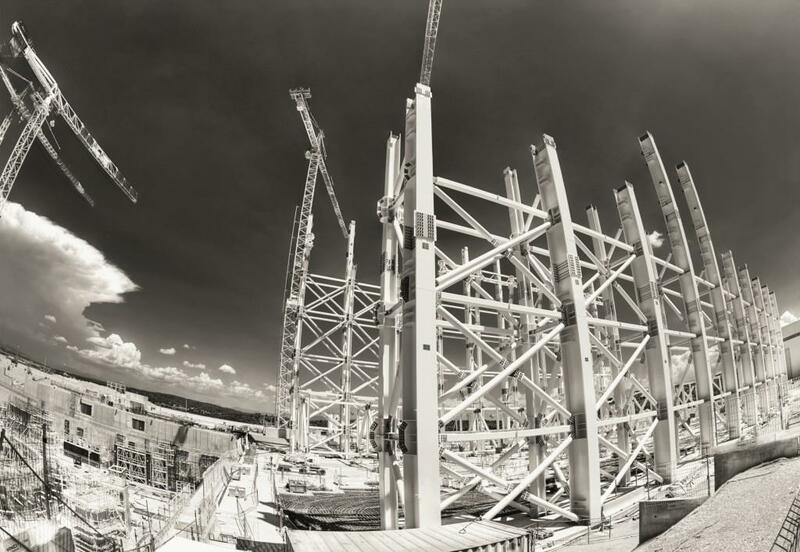 As the Assembly Building's steel skeleton is progressively bolted into place, the massive size of the construction becomes more and more evident. 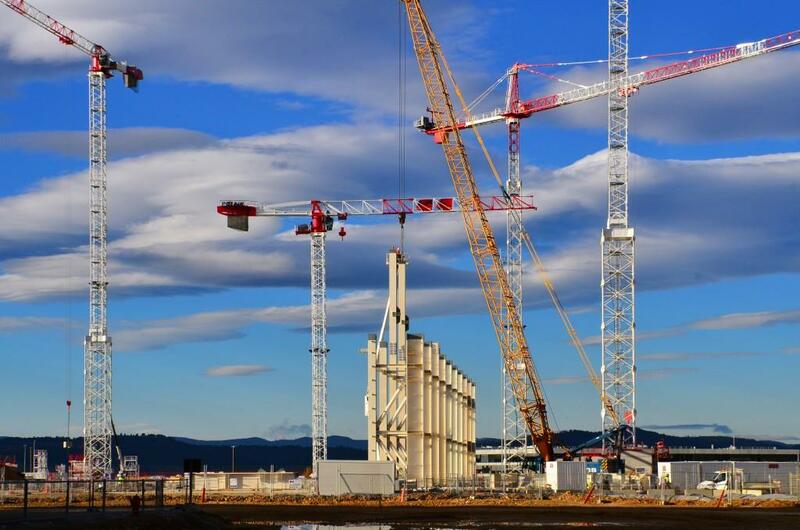 When finished, the Assembly Building will reach the height of the tallest crane. 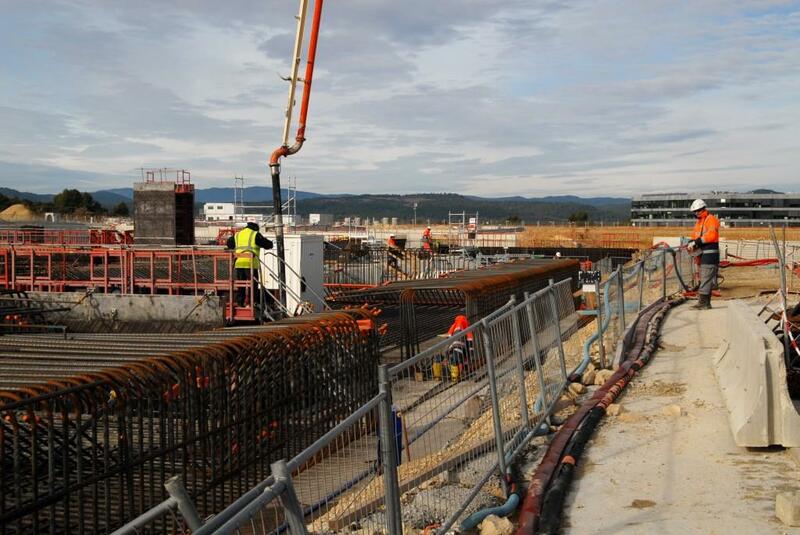 On one side of the Assembly Building basemat in December, work begins on the second level of pillars. 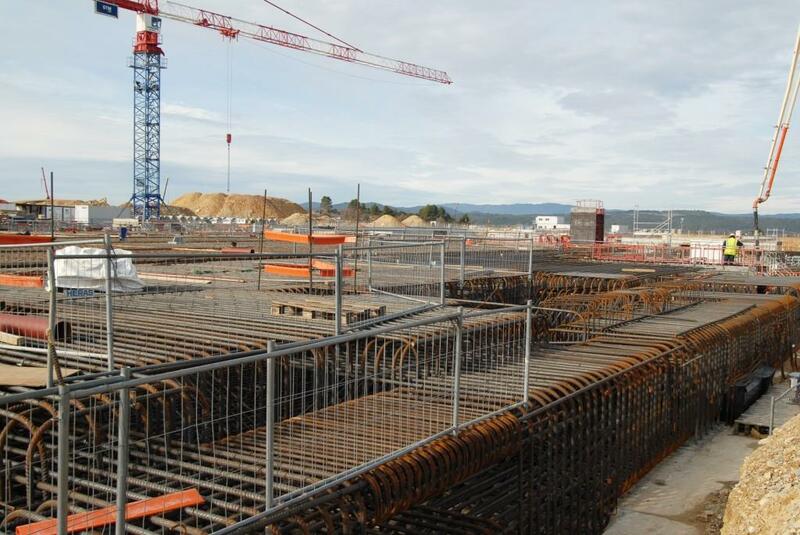 Stored near the worksite where the pillars are being assembled are the plates, bolts and bars of the pillar assemblies. 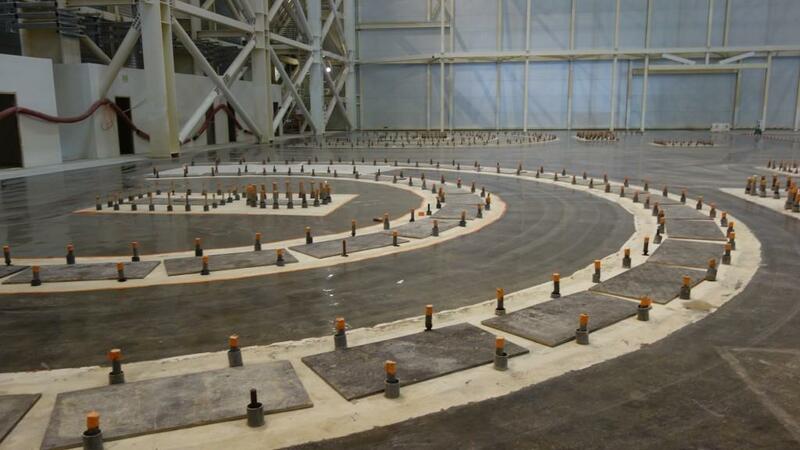 In this area of the Assembly Building basemat, large custom-built tools will be anchored. 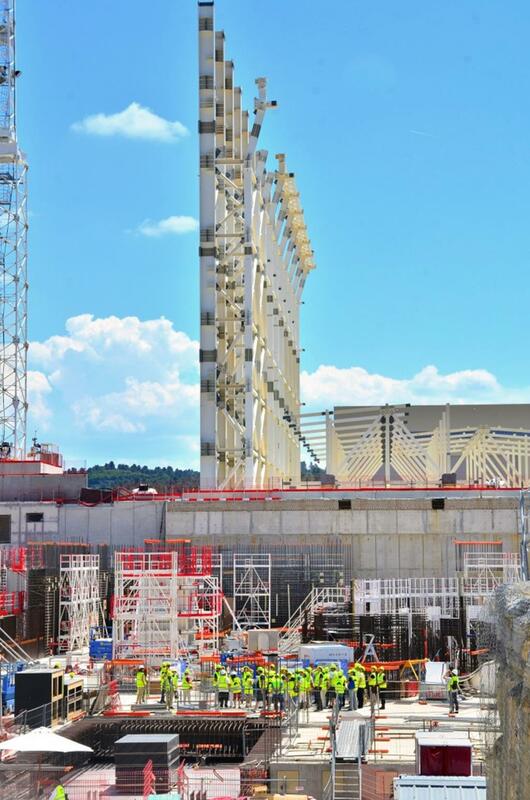 These 12-metre columns are tall, but let's put them in perspective. 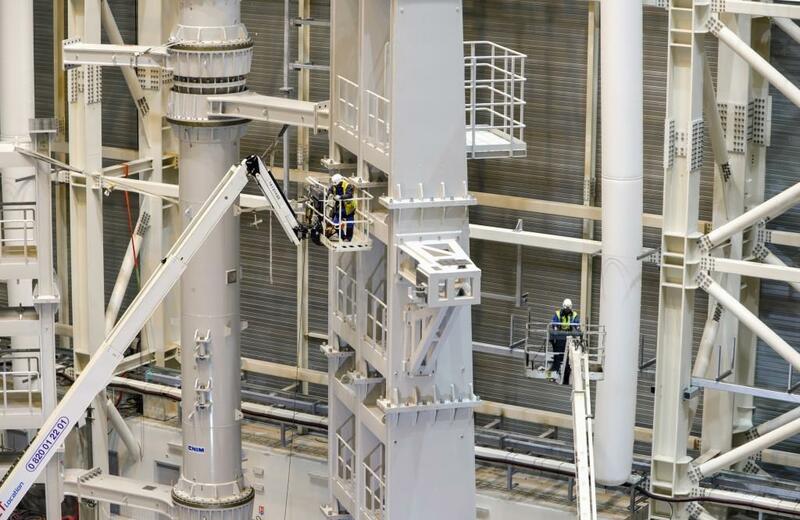 The two tools that will manage vacuum vector sector sub-assembly will stand 22 metres tall in the Assembly Building—or nearly twice the columns pictured. 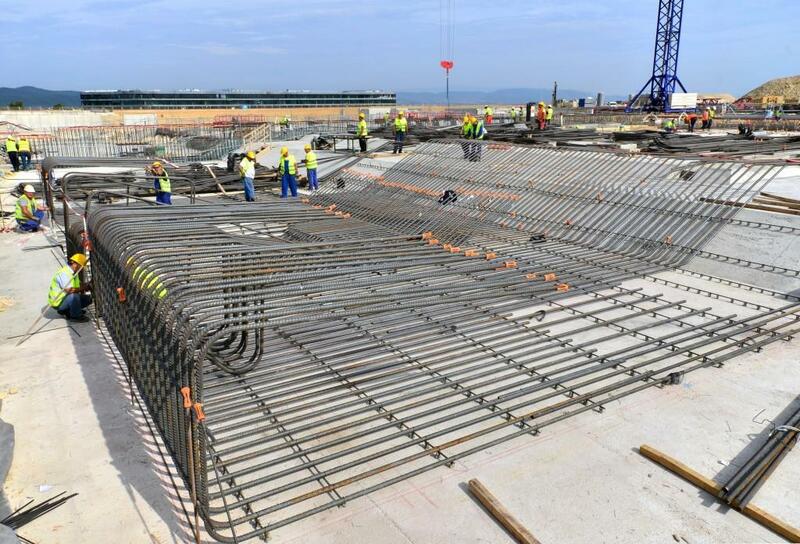 A parallel row of columns will support the Assembly Building roof from each side of the basemat. 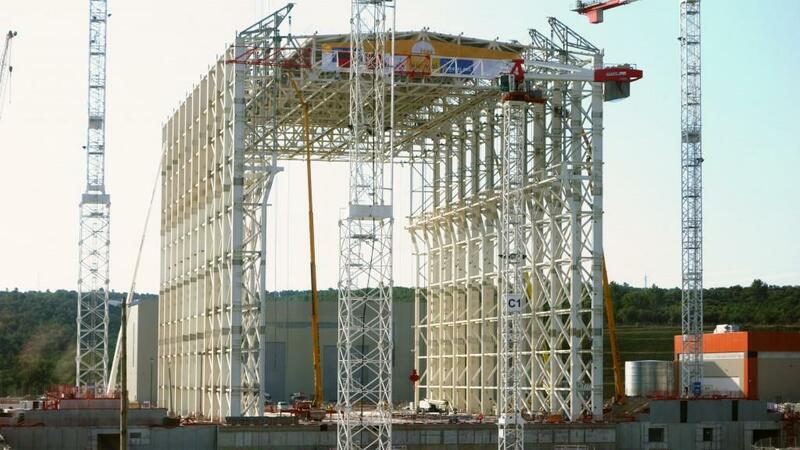 Pictured, the support braces that tie the rows together. 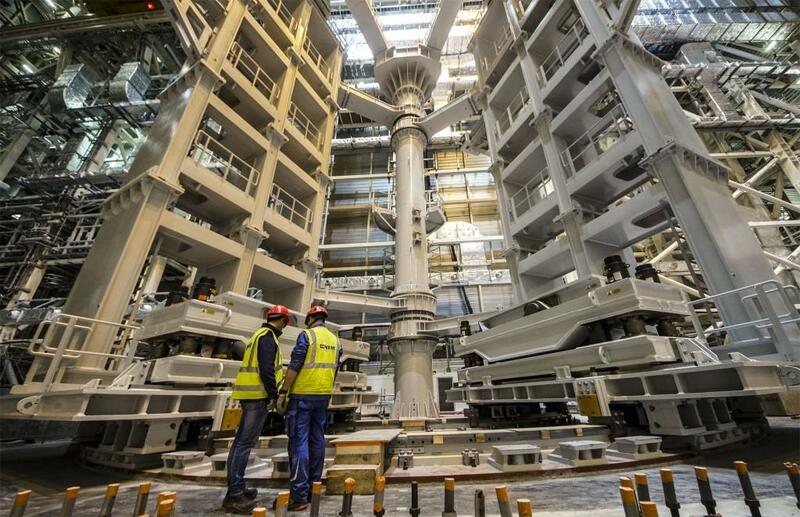 An inspection of one of the 12-metre column sections that will be assembled as part of the steel "skeleton" of the Assembly Building. 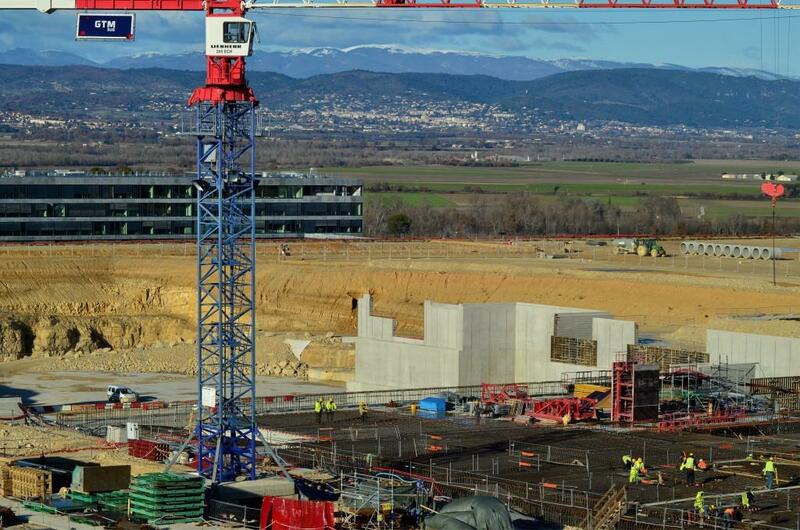 The Assembly Building will rise 60 metres, or more than twice as high as the Cryostat Workshop seen in the background. 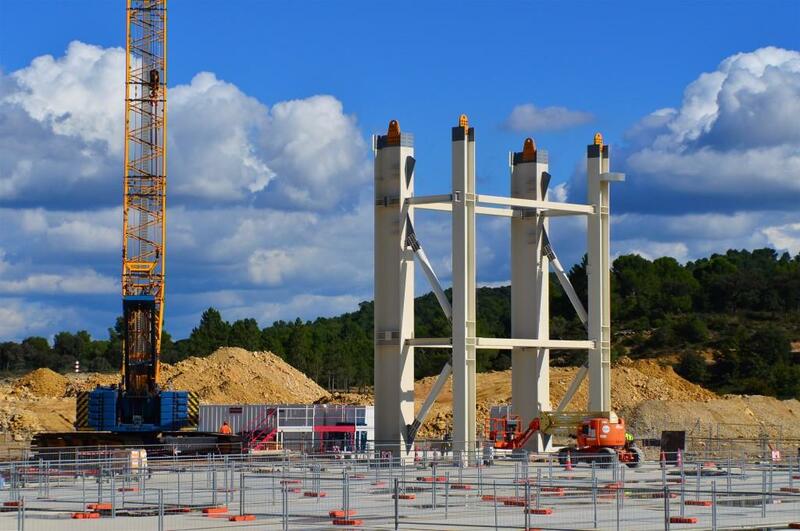 Late September, the first pillars of the Assembly Building were installed. 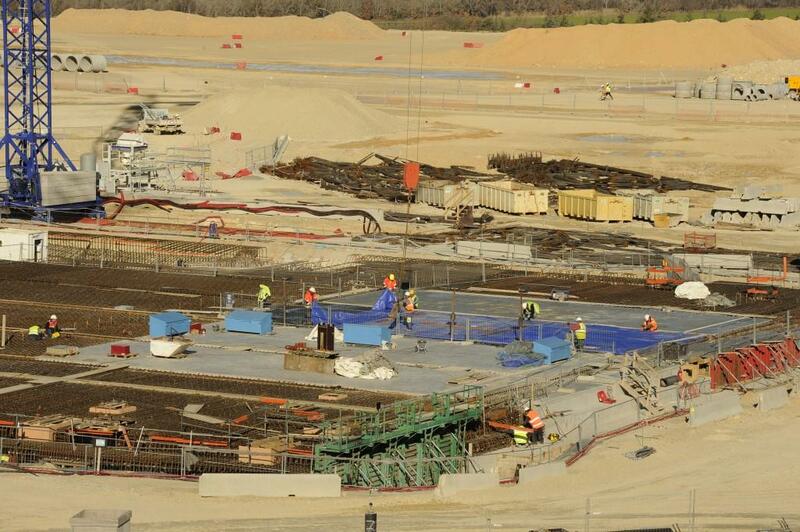 Eleven main pillars, and 11 supporting pillars, will be erected along each side of the basemat. 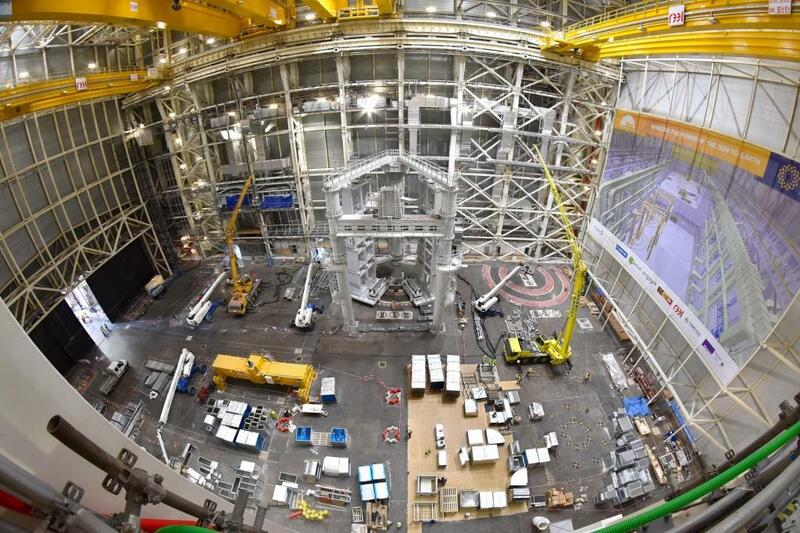 The Assembly Building—a vast antechamber to the Tokamak Complex—will house the specialized assembly tooling required for pre-assembly operations. 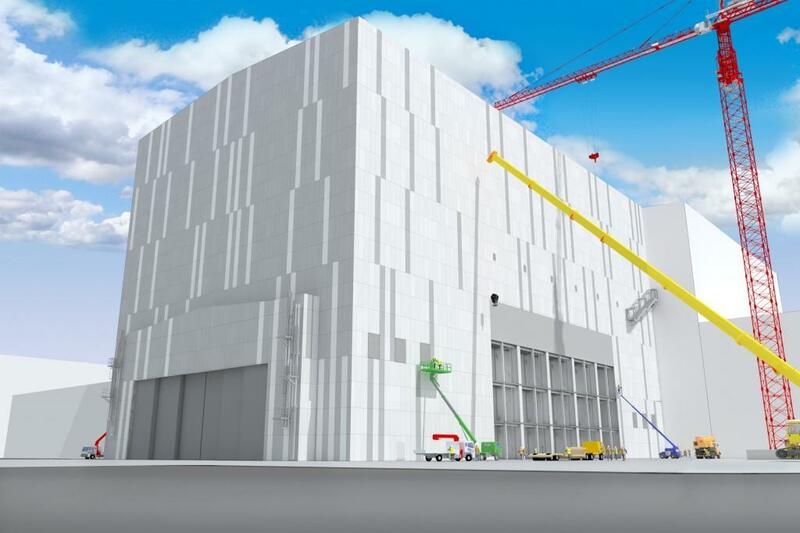 The 6,000 m² basemat of the Assembly Building won't be visible for long: construction begins this year on the walls of the facility, which will rise 60 metres above the platform. 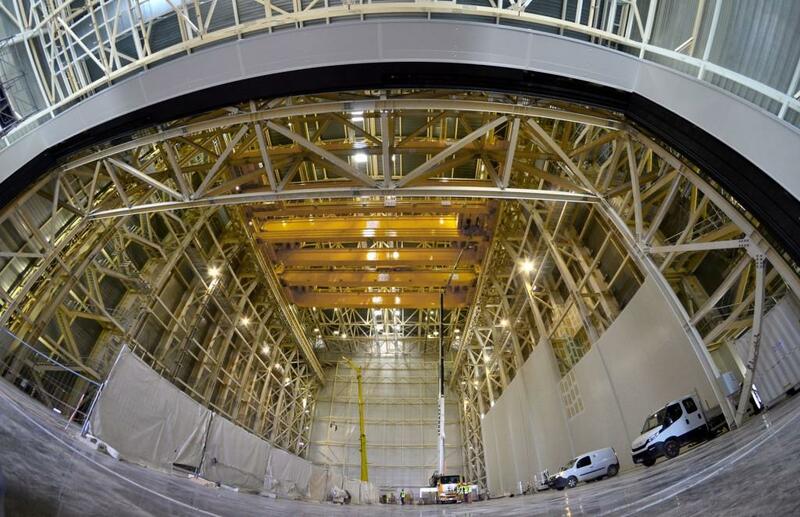 The Assembly Building basemat will support the load of the heavy custom-built tools that will pre-assemble vacuum vessel components. 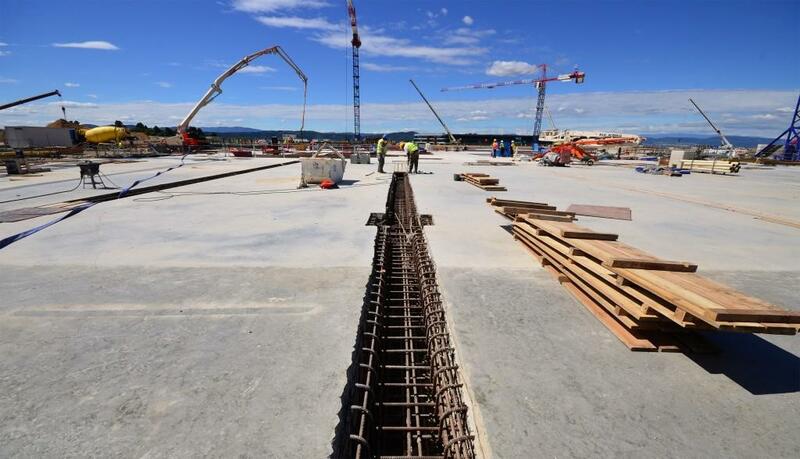 The openings in the concrete, visible in the image, are reserved for the embedded plates that will fix the tools to the basemat. 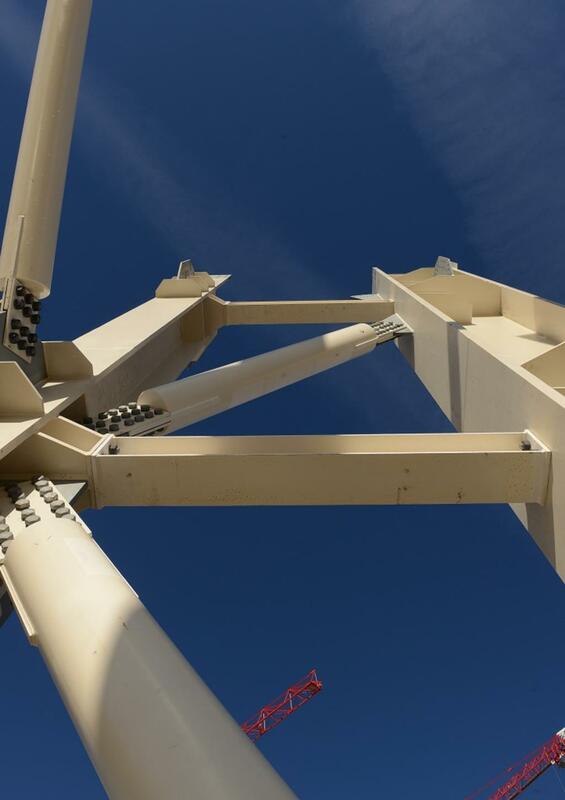 Work on the steel frame of the Assembly Building is scheduled to begin in early July. 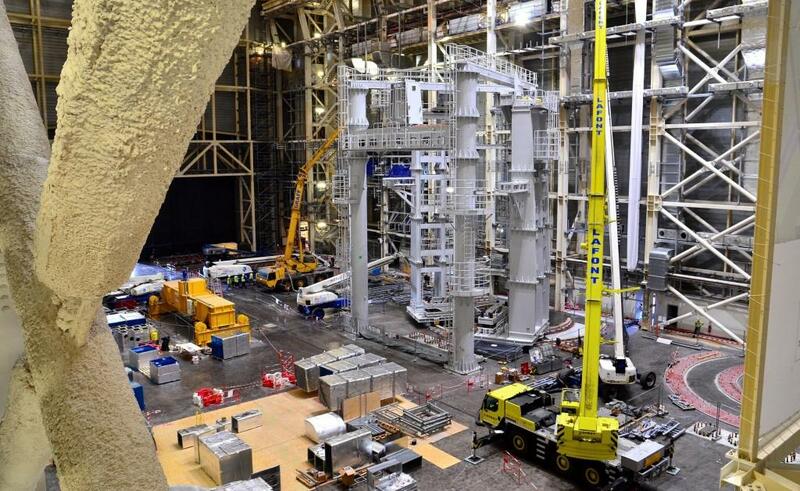 Technical galleries are underway all around the Assembly Building. 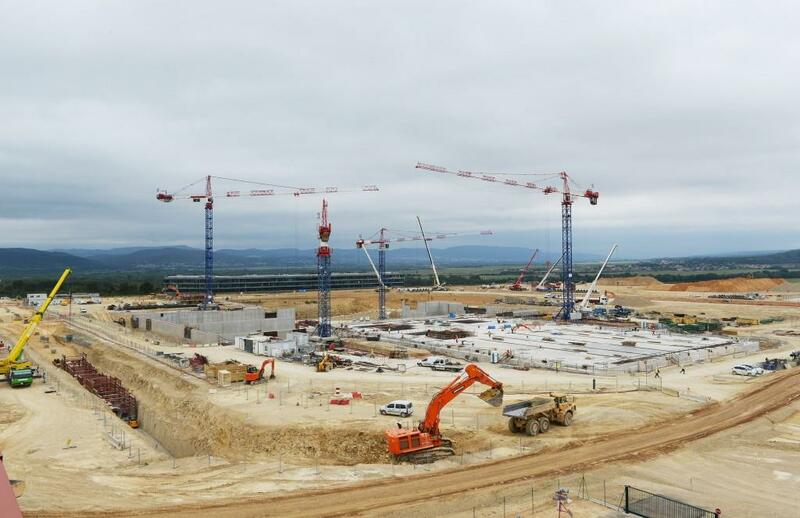 The building should begin to take form at the same time as the adjacent Tokamak Complex. 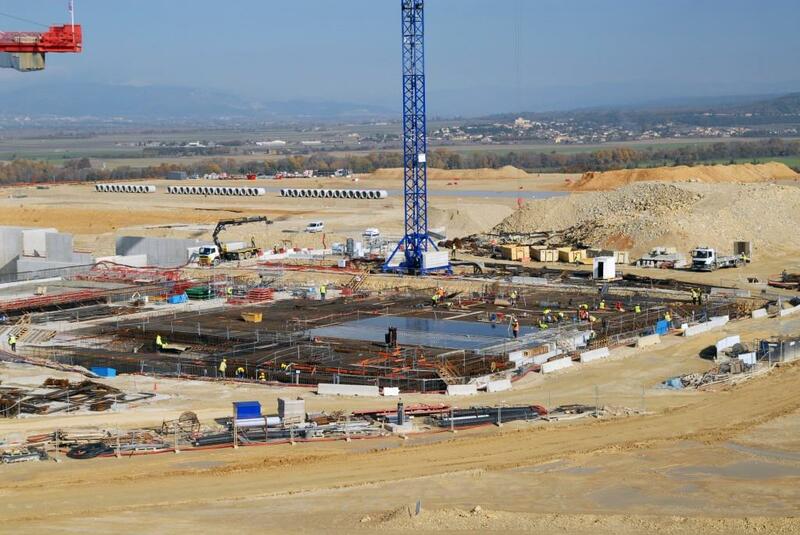 A view from the sky of the Tokamak Complex worksite, where walls will begin to rise next year, and the completed basemat of the Assembly Building (foreground). 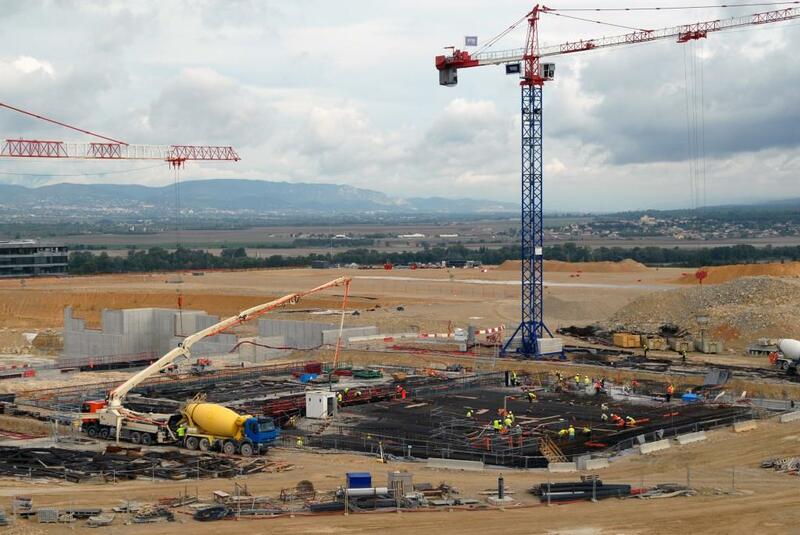 Finishing, cleaning and testing works are carried out on the Assembly Building slab in July. 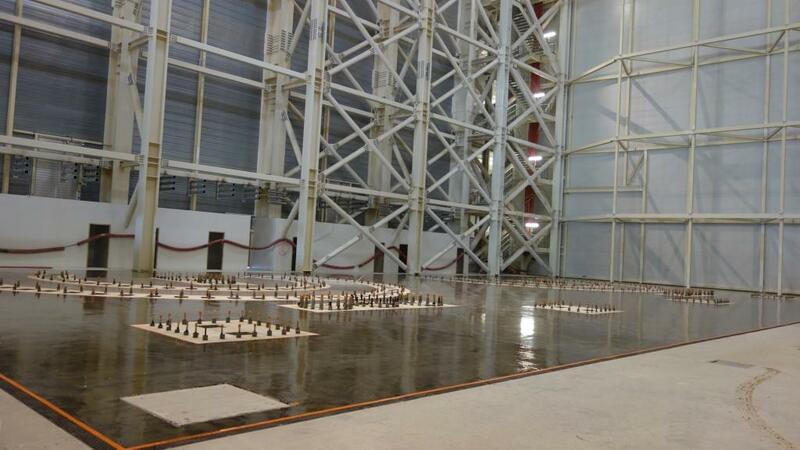 On the completed Assembly Building basemat the footprints of three large assembly tools are visible. 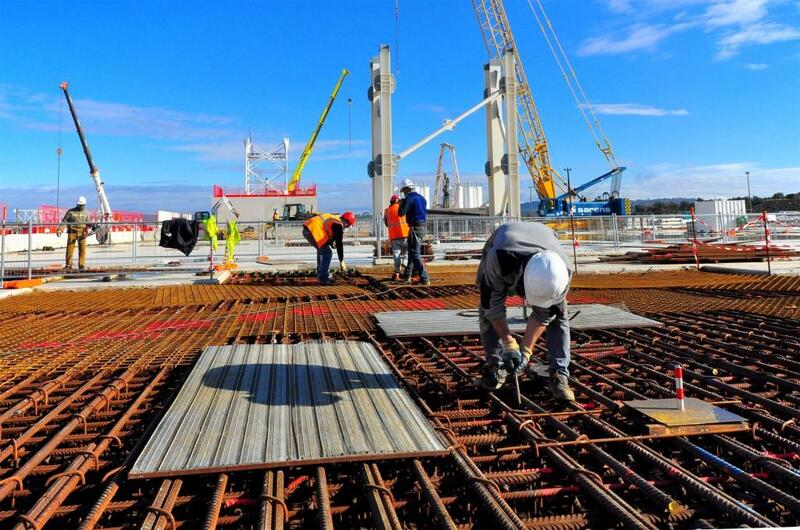 Here anchor plates will provide the interface between the tools and the concrete basemat. 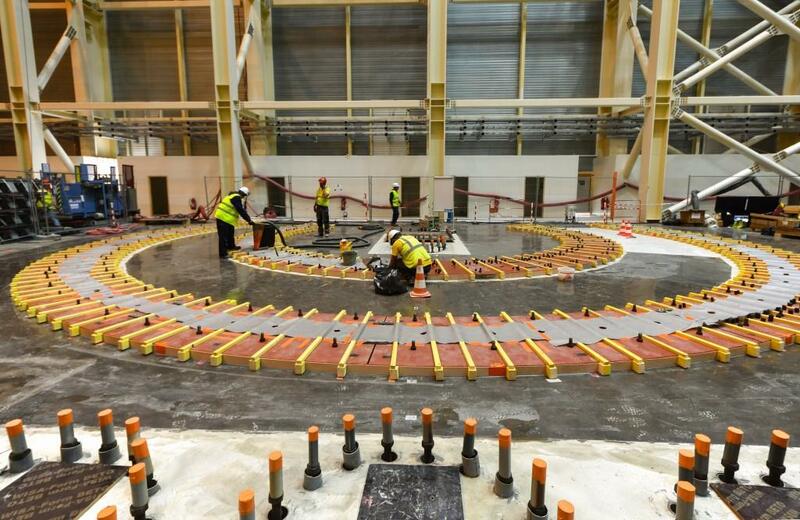 Spaces are maintained between the different segments of the basemat to accommodate the tracks of a small ITER "railroad." 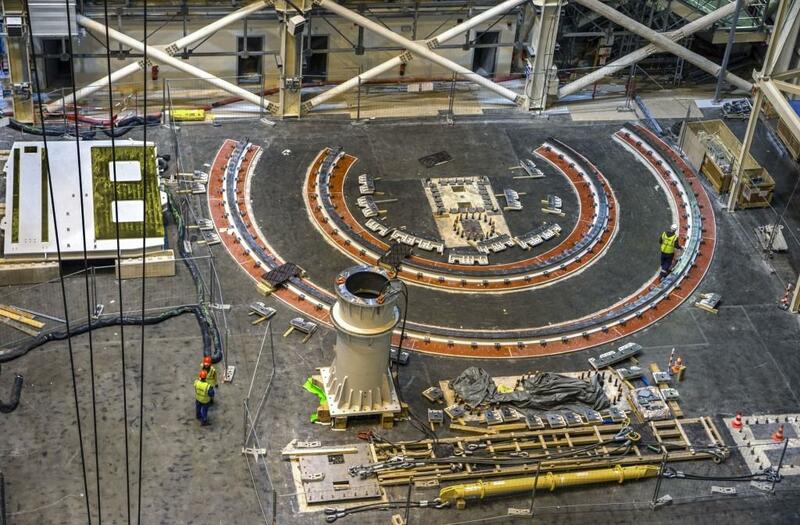 The four large cryostat segments--cylinders measuring 30 metres in diameter—will travel from the Cryostat Workshop to the Assembly Building by rail. 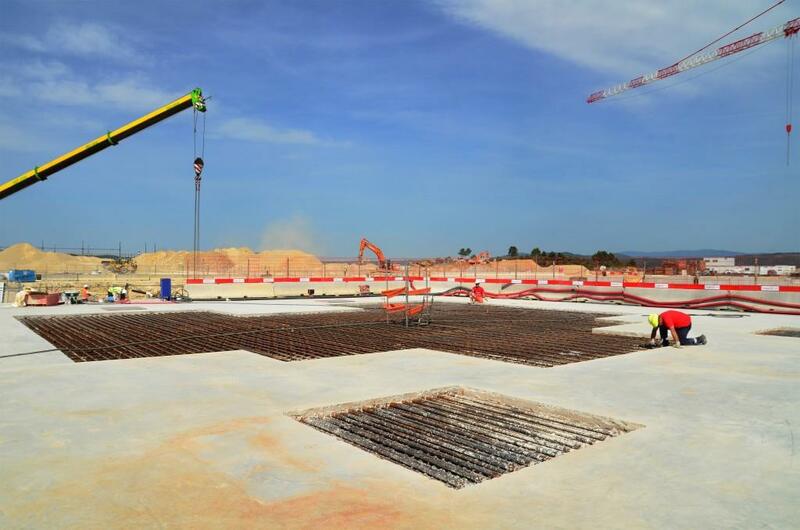 Work begun in November 2012 is concluded in May 2013 with the last pour for the Assembly Building basemat. 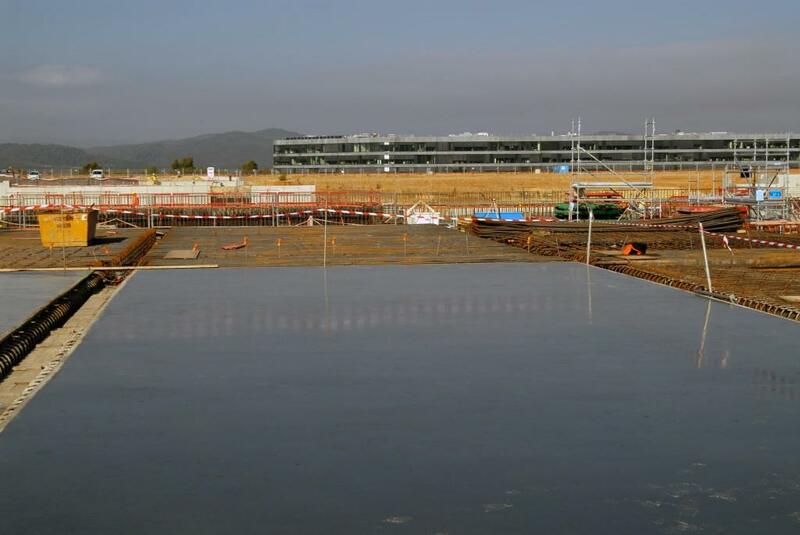 Each concrete plot is poured in two segments with a joint between them that will be filled in once the concrete is dry. This technique avoids cracking. 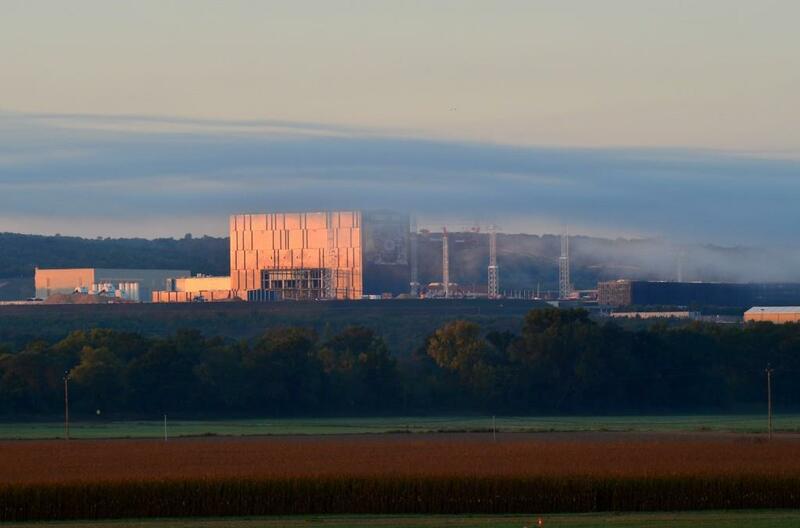 Work begins at sunrise on another slab of the Assembly Building basemat. 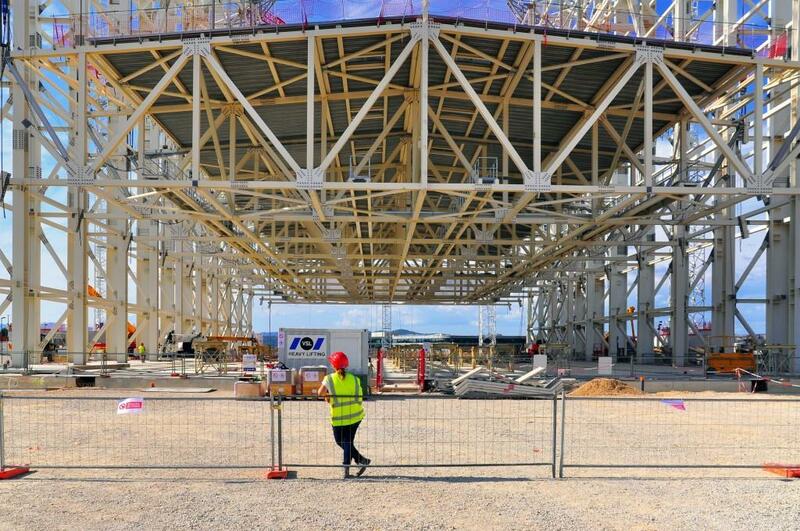 Currently 70 workers are active in this area of the platform. 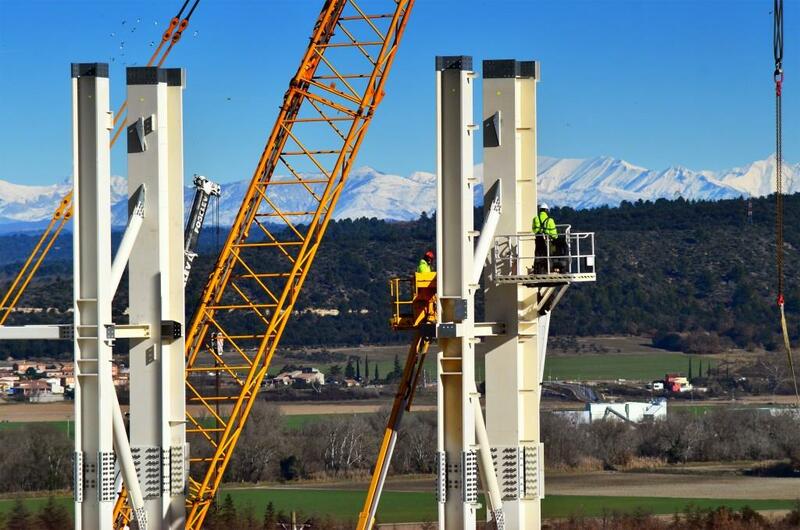 In the distance, the snowcapped Montagne de Lure (alt. 1,600 m) and its small family ski resort. 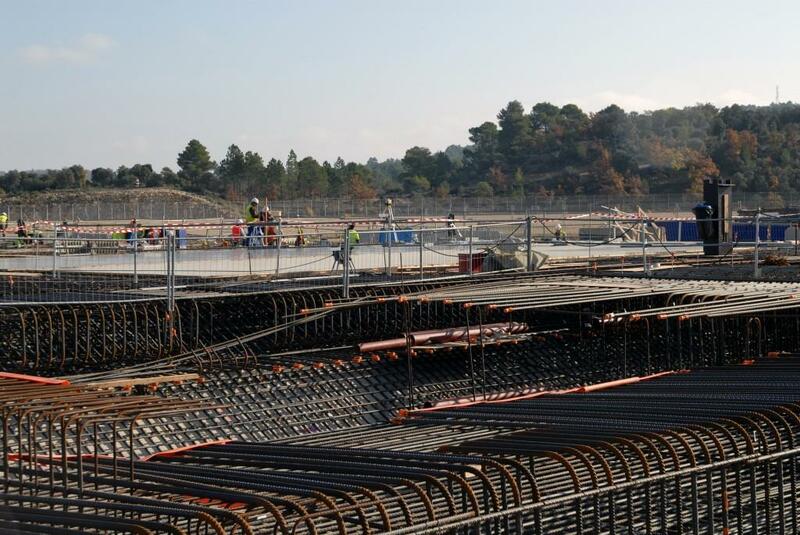 Seventy people are involved in reinforcement and concrete pouring works for the Assembly Building basemat in December. 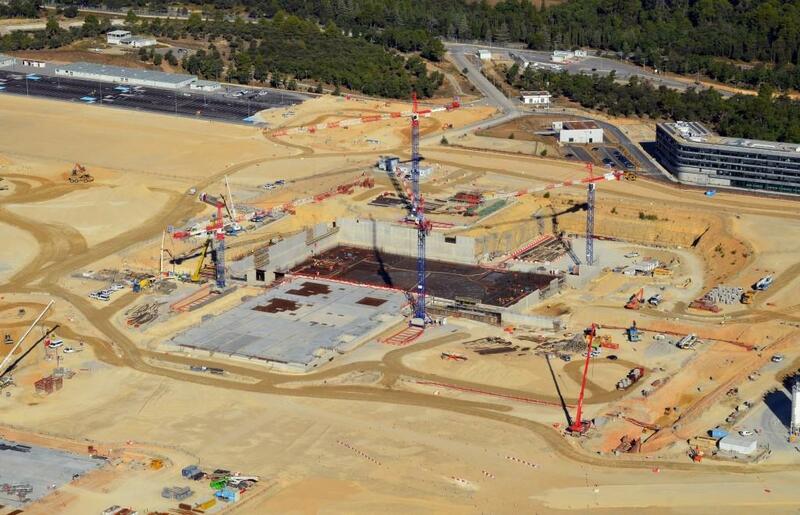 In the very centre of the ITER platform: the Assembly Building worksite. 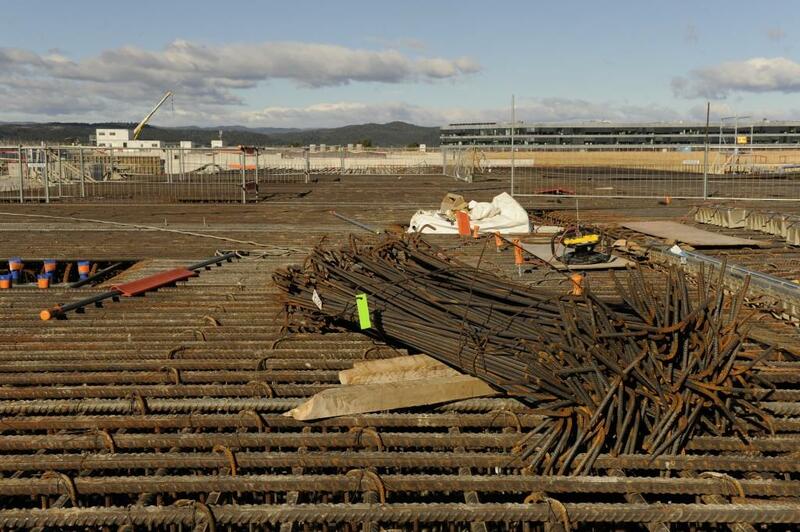 On the 6,000 square-metre site of the future Assembly Building, a complex grid of rebar is taking shape. 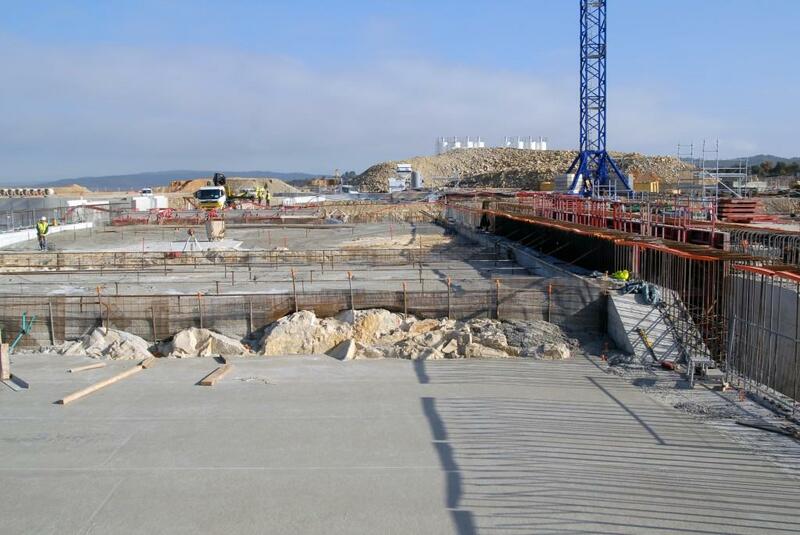 The 5,400 square-metre area of the Assembly Building is covered with a layer of blinding concrete, to prepare for the reinforcement activities to come. 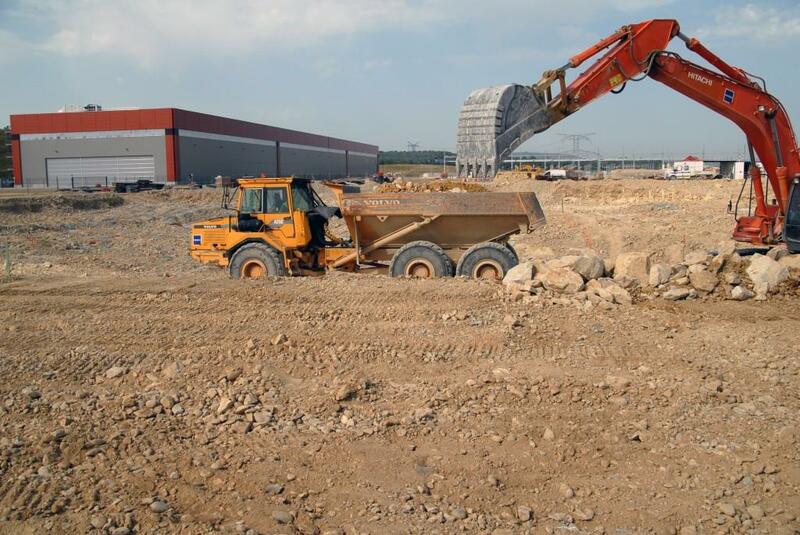 An excavator is at work on an 7x8 metre gallery that will serve as an entry point for most of the electrical cables for the assembly tools and devices. 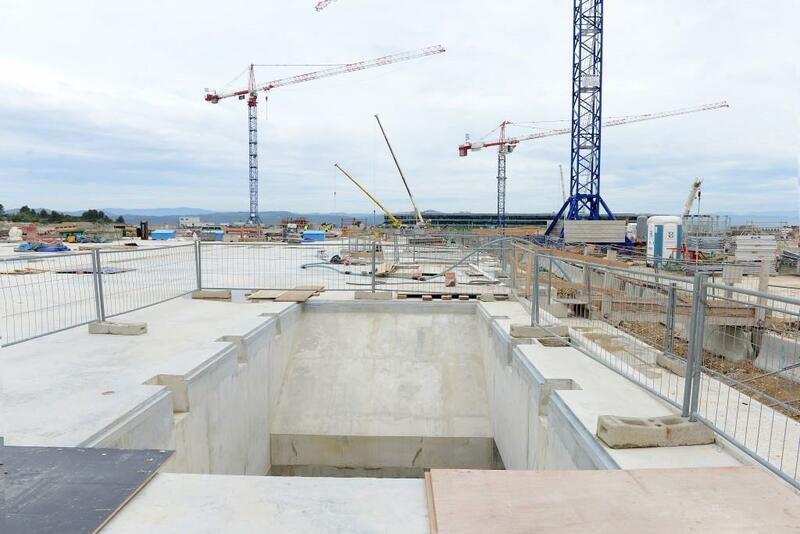 With all of the digging operations for the Assembly Building foundations, the deep underground drainage networks and the establishment of Contractors' Area #2, the tour buses on the site these days are limited to the periphery. 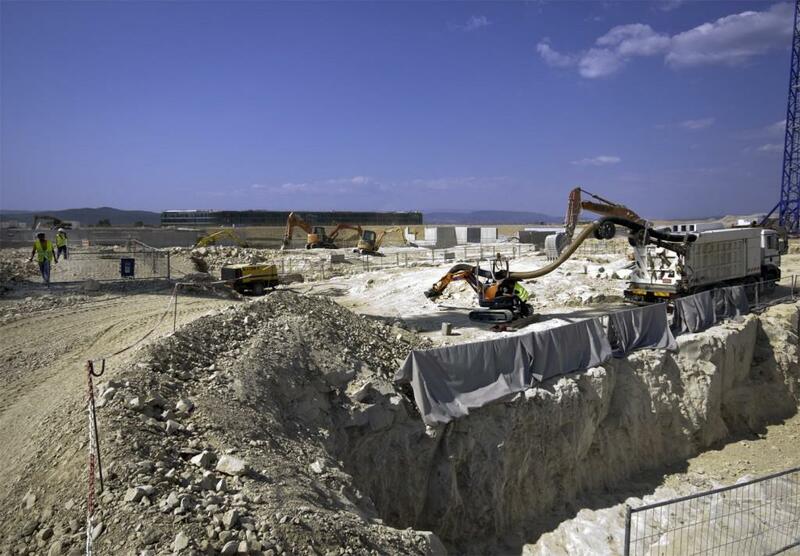 Excavation works for the Assembly Hall aren't as spectacular as those for the Seismic Isolation Pit: only 10,000 m³ needs to be removed. 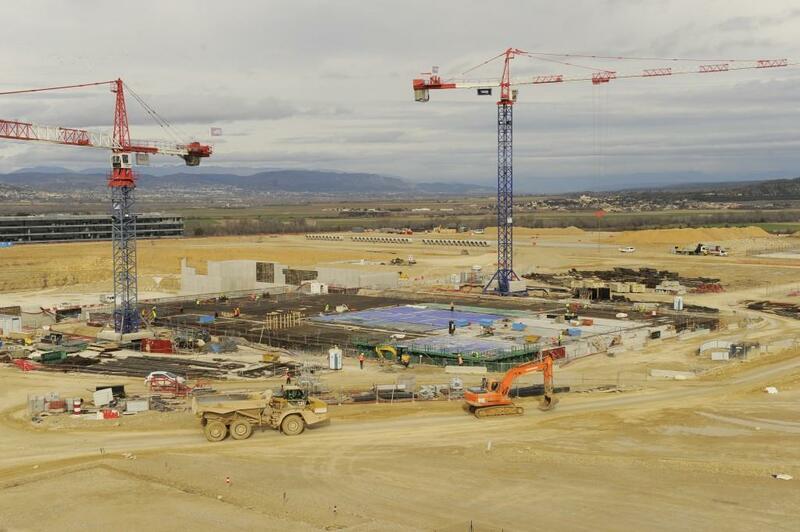 The Assembly Building will occupy an area of 6,000 m² to the south of the Tokamak Complex. 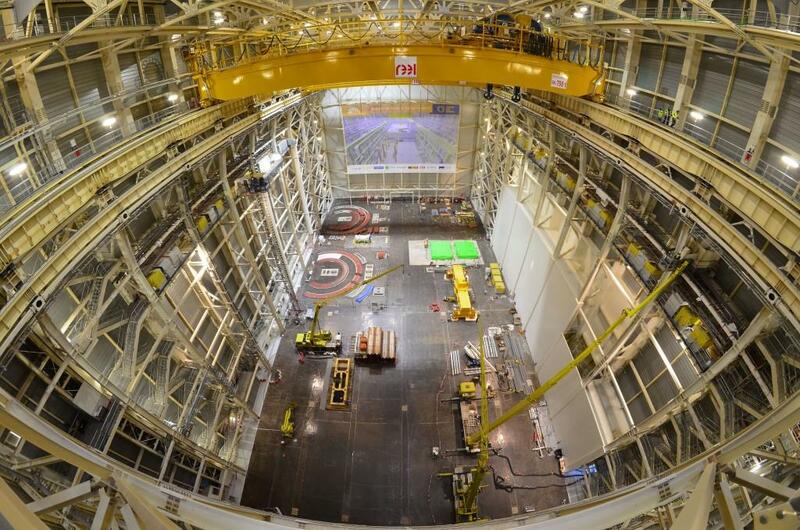 The vast hall will house the specialized tooling that will accomplish pre-assembly activities for the Tokamak components. 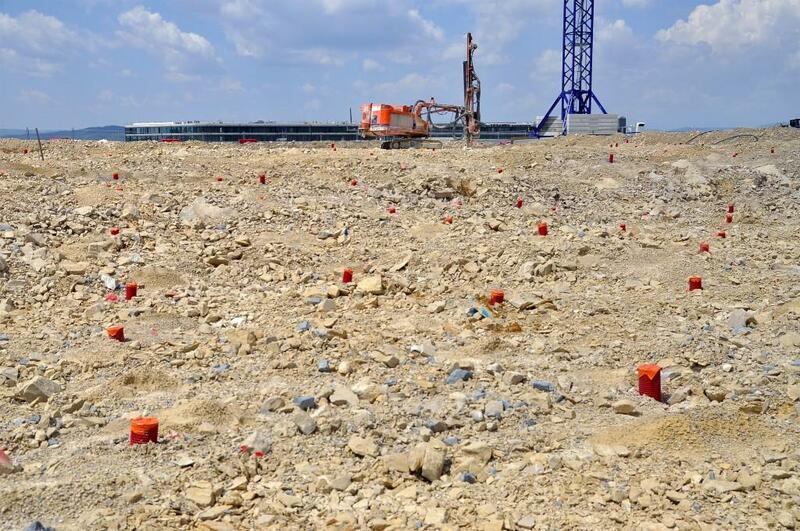 As part of excavation work for the future Assembly Hall, 500 holes have been drilled down to 7 metres to profile the rock substrata. 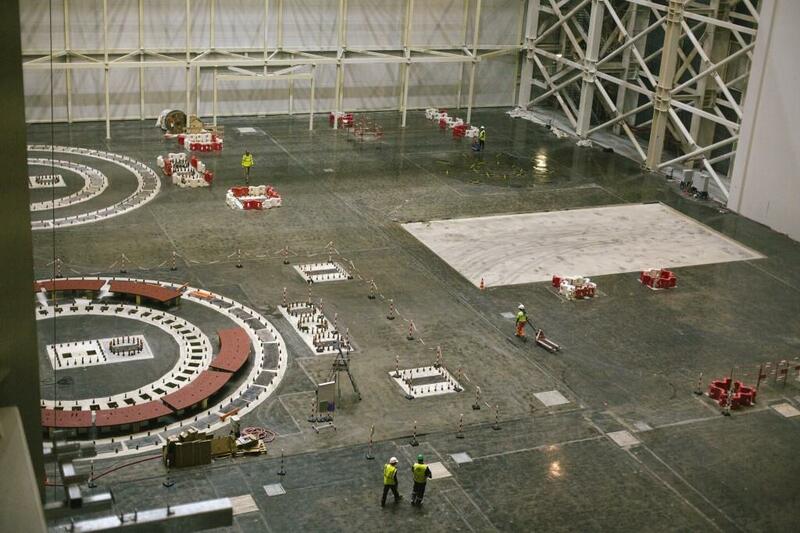 Looking down across the full 97-metre length of the Assembly Hall. 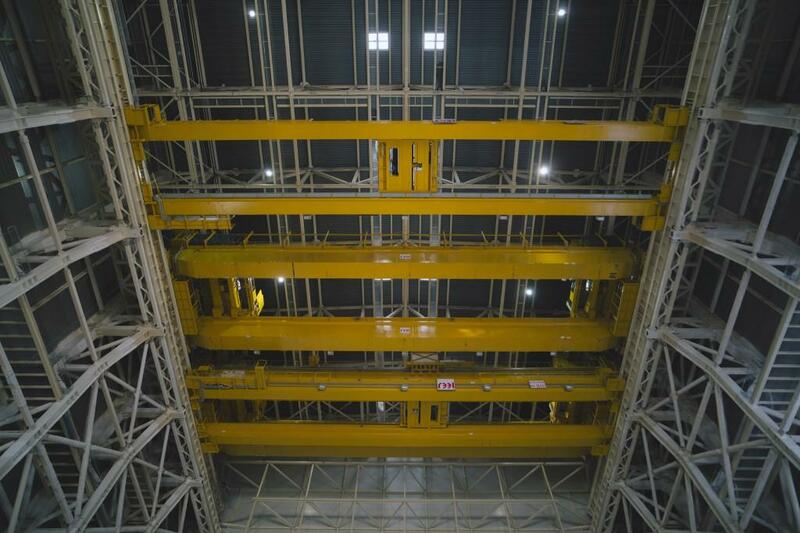 The travelling cranes are approximately 45 metres above floor level. 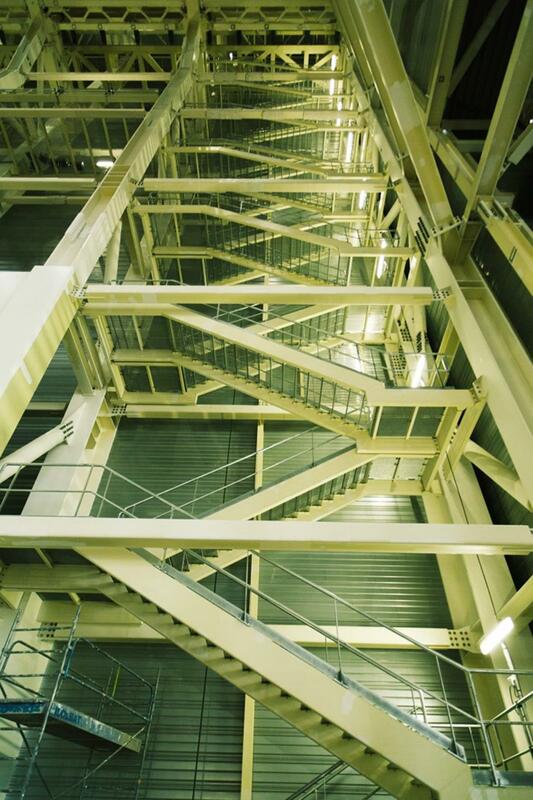 Above, the main hoists of the Assembly Building, capable of handling loads of up to 1,500 tonnes. 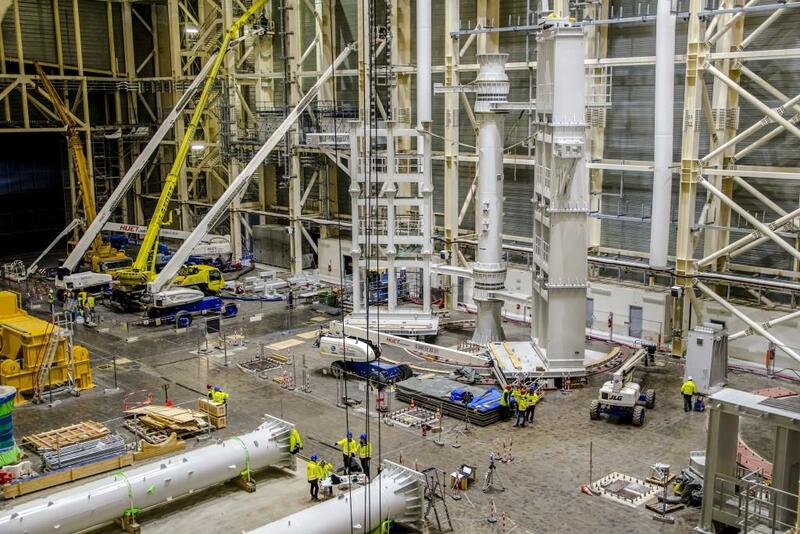 On the shop floor, some of the specialized tooling required to assemble, lift and finally manoeuver ITER's supersized components. 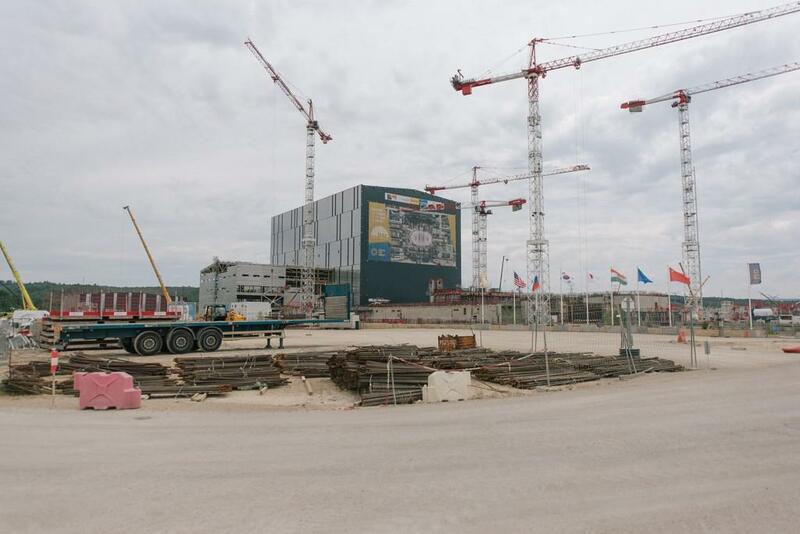 Adjacent to the Tokamak Complex, the Assembly Building will be the location for pre-assembly activities on the massive components of the ITER device before they are transported to the Tokamak Pit for installation. 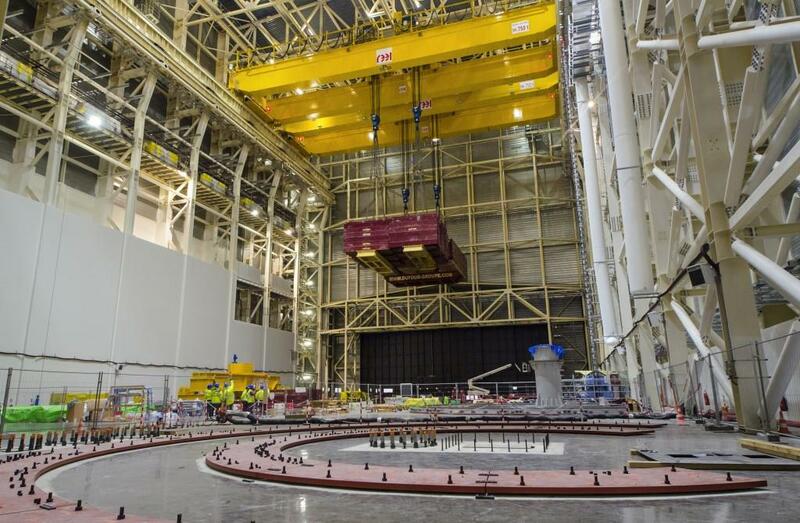 This vast workshop will host custom-made tools as well as two 750-tonne cranes that will travel the length of the Assembly and Tokamak buildings. 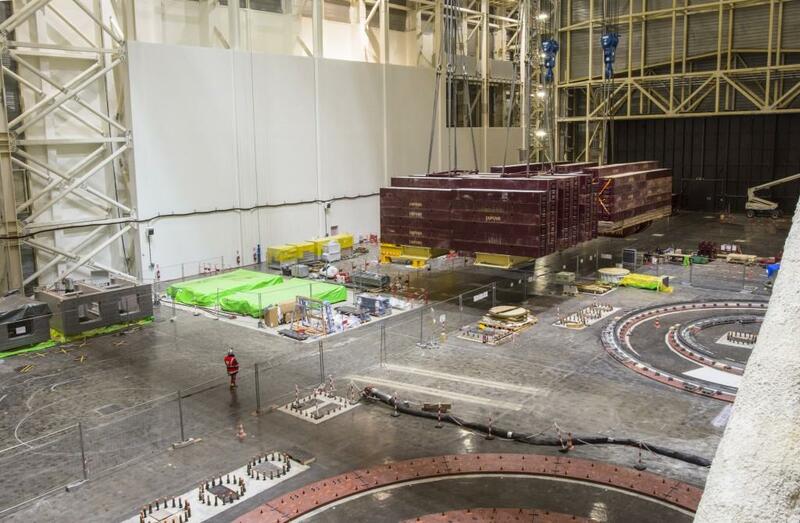 Here, for example, each of the nine steel sectors of the ITER vacuum vessel will be sub-assembled with thermal shielding and two toroidal field coils before being lifted and positioned inside the machine. 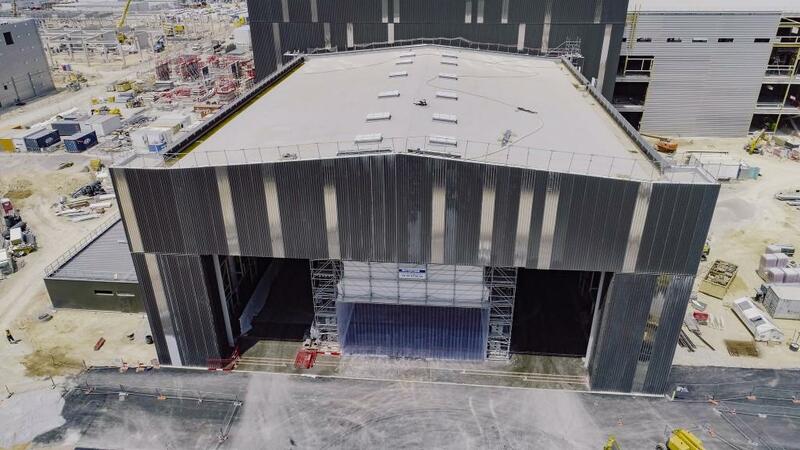 Work on the external structure began in June 2012 and was completed in September 2015 with the lifting of the massive 730-tonne roof structure. 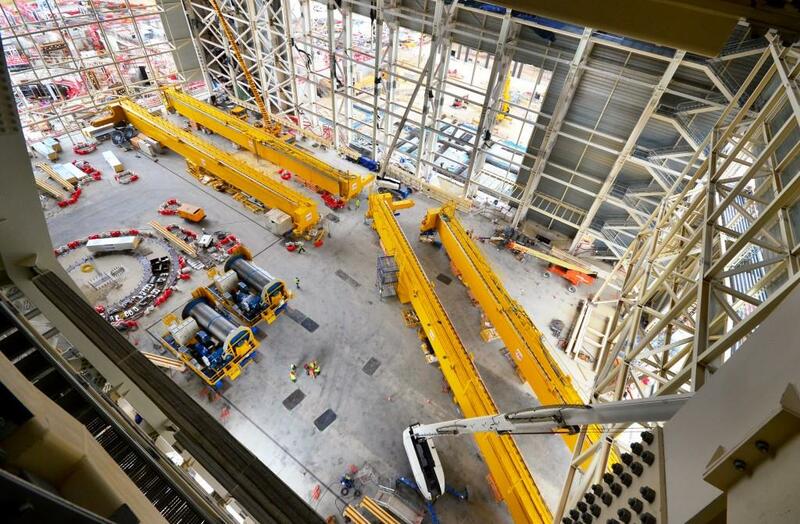 Two 750-tonne overhead cranes and two 50-tonne auxiliary cranes were installed in 2016 and today, commissioning is underway on the largest cranes. 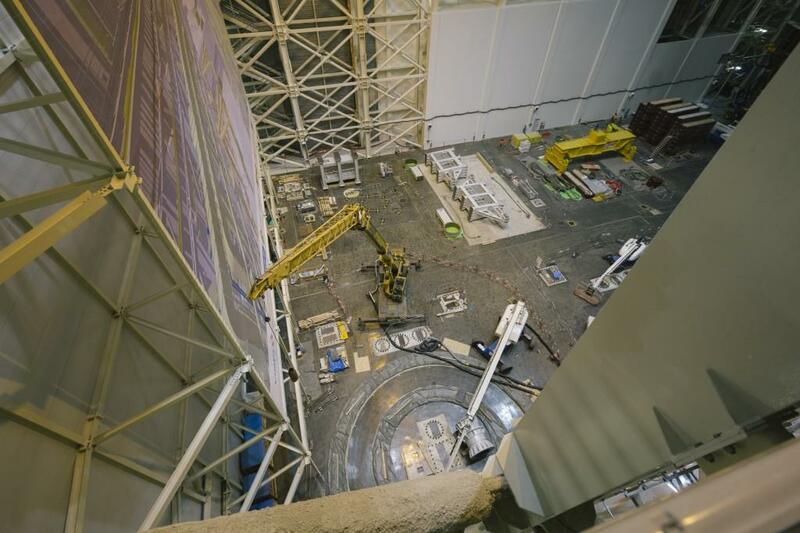 Once the temporary wall separating the Assembly Hall from the Tokamak Building is removed, the crane rails will be extended to over the Tokamak assembly pit. 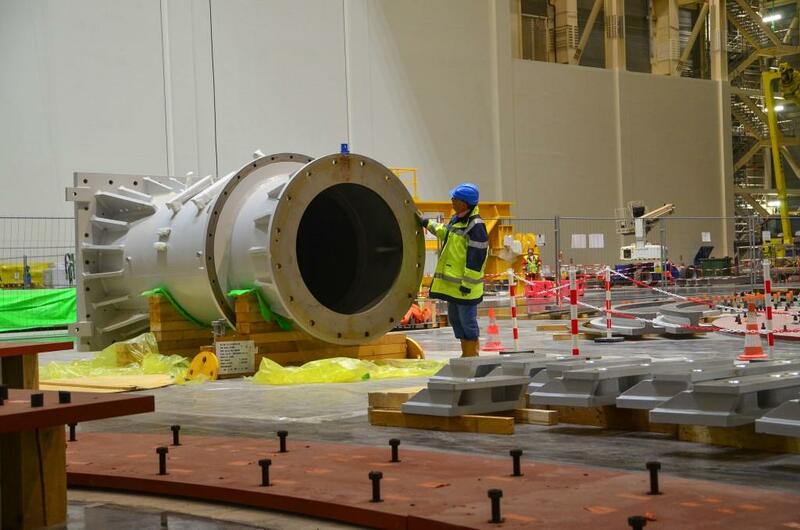 Work has been underway since June 2017 to install the building's first assembly equipment—the vacuum vessel sector sub-sector assembly tool. 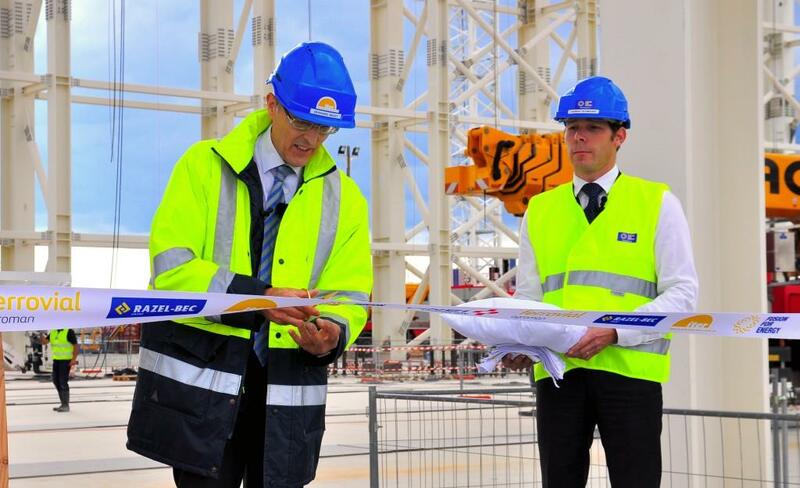 The second tool will be delivered in 2018.